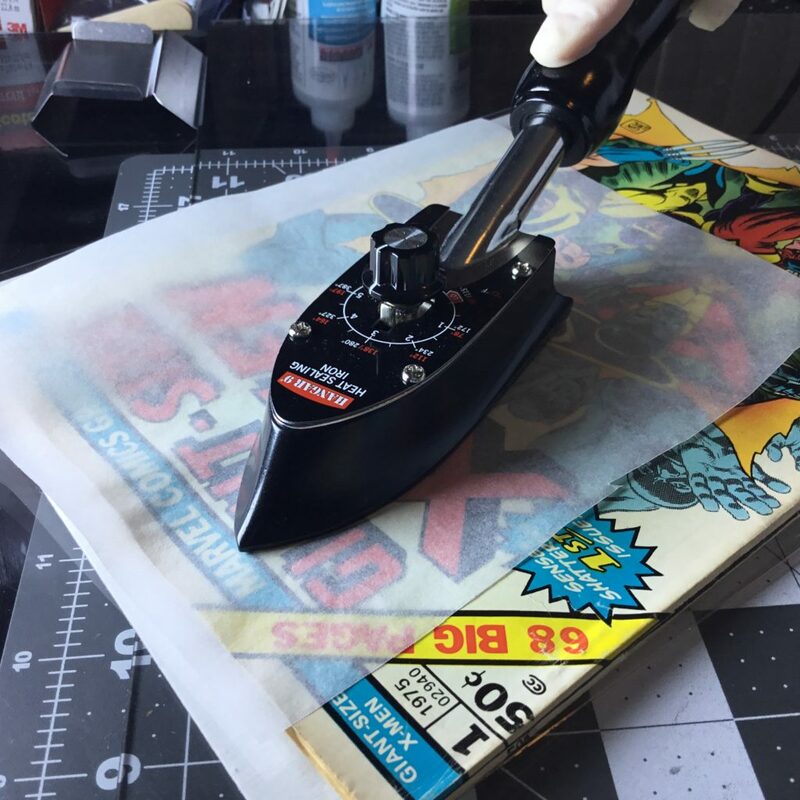 Save time and money by pressing your own comic books with a heat press machine. Most supplies can be purchased directly on Amazon or eBay to save time, money, and shipping costs. I started a personal journey trying to learn the tips and tricks of pressing comic books. I wanted to learn techniques without showing any evidence of pressing or damaging a book. There have been some bumps along the way through some trial and error. This is still a guide for beginners and the basis for a way to get started. It is very humbling but you will damage some books along the way. Start small with some cheap dollar bin comic books or reader copies. I have provided links for easy re-ordering, and for clarification on materials required in this free visual FAQ guide. All of these books were pressed using methods outlined in this guide and on my youtube channel. You too, can achieve similar results. 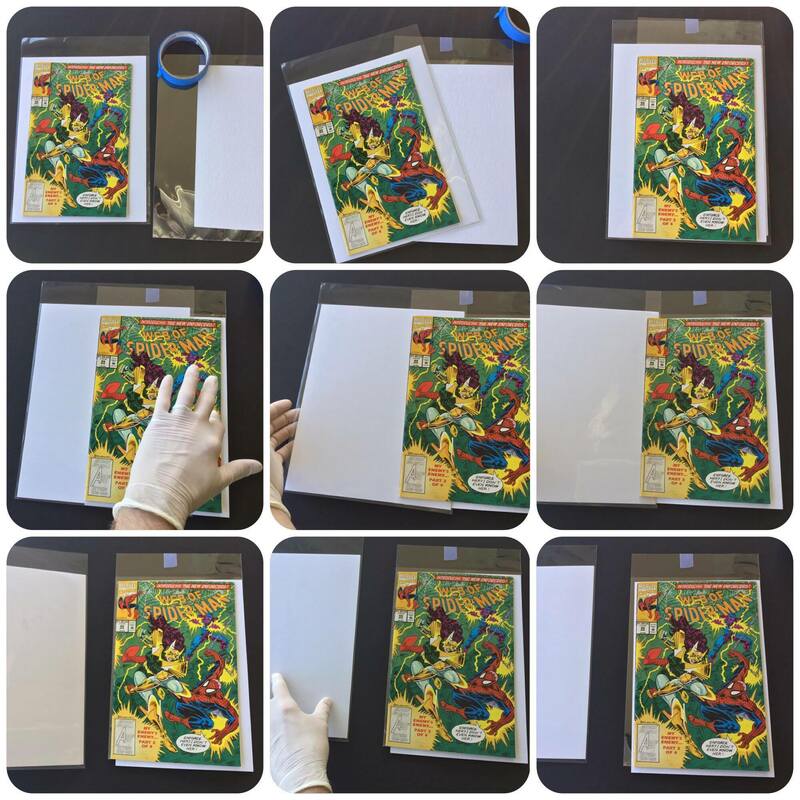 Comic book pressing is the process of flattening out a comic book that has been wrinkled or damaged. 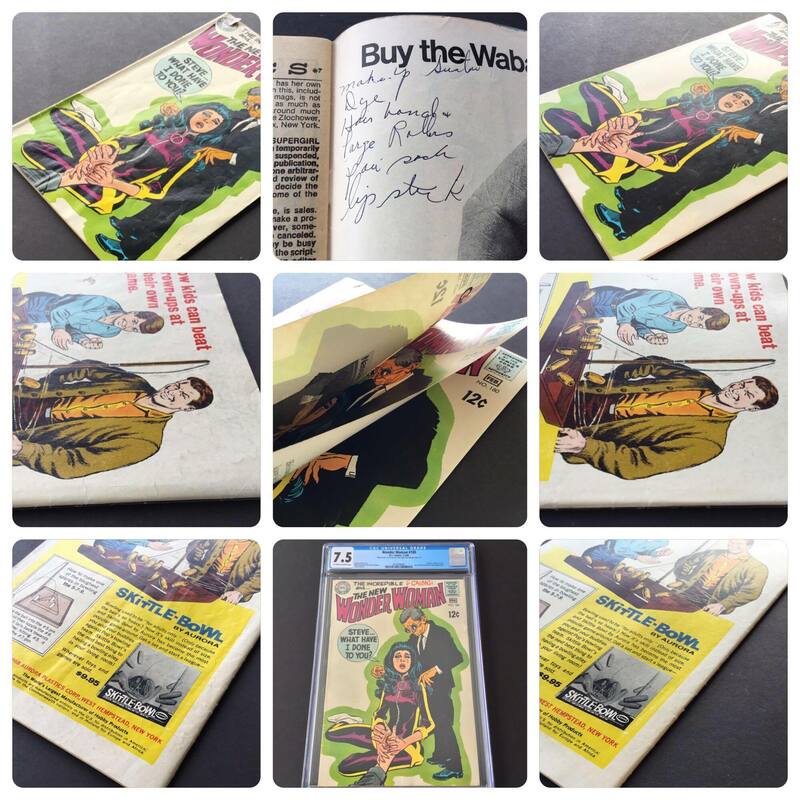 Comics can get bent during shipping or have creaselines from heavy reading. Good news: Comic Books can be pressed using a t-shirt heatpress machine, a book press, a stack of short boxes, or anything heavy and flat. The idea is simple: to smooth out the waves and bumps on the cover of a comic book. This makes the overall grade and eye appeal of the book increase considerably. 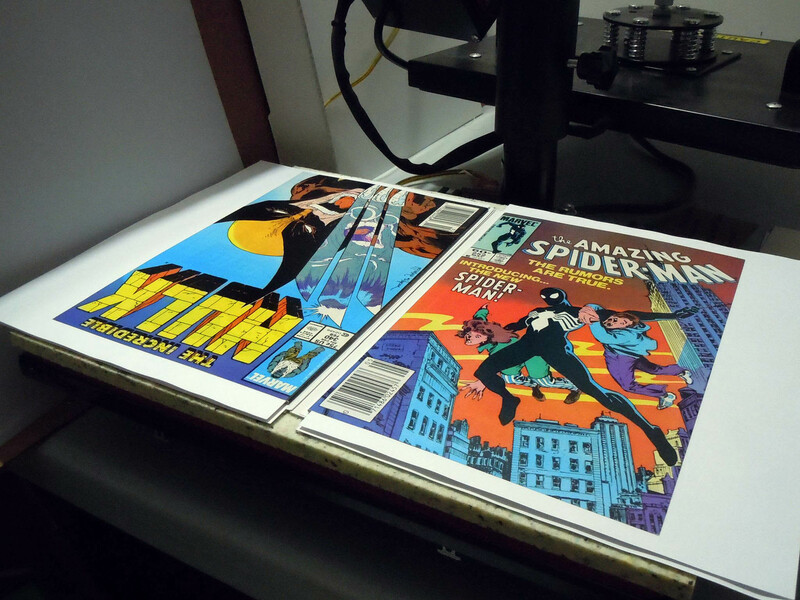 Comic book pressing is not restoration, more like comic book conservation. 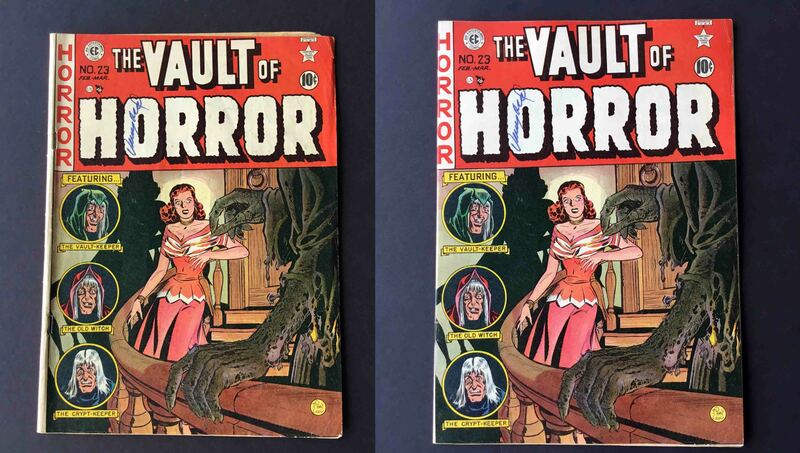 The difference can sometimes mean thousands of dollars when discussing high dollar key comic books. Do NOT press a comic book with an iron. Every person is different. Life experiences, patience thresholds, busy schedules, attention to detail, and climate can depend on the speed of your learning process. 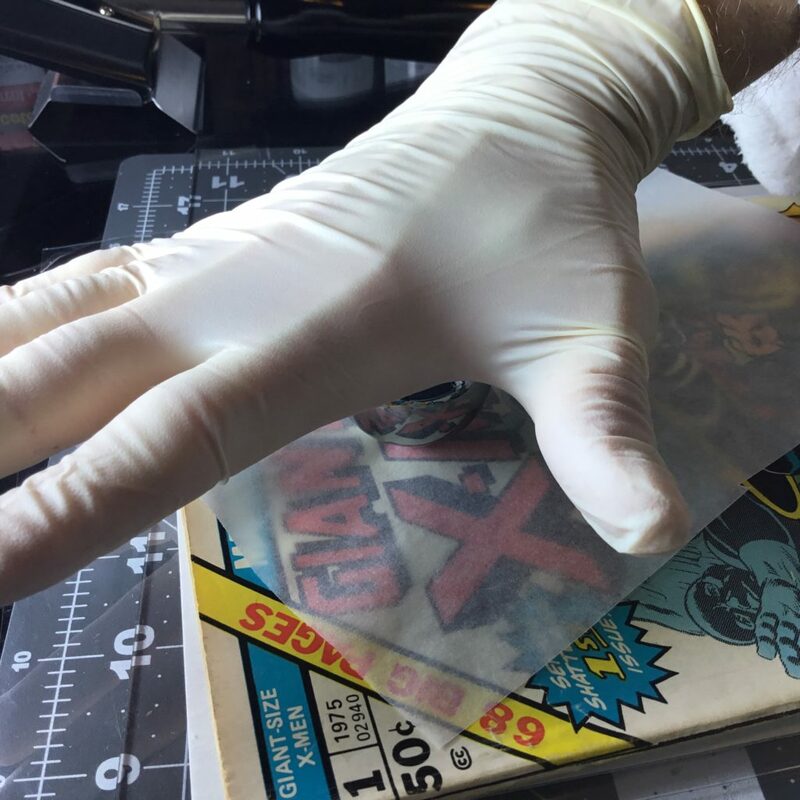 For the average person, it will take a minimum of 2 years to fully grasp all aspects of comic book cleaning and pressing. There are varying degrees of learning the different eras, thickness of books, spine bindings, and paper quality. Experience, time, and patience all play an important factor in this experience. As with anything else in life, it all will depend on how much time you put into learning this procedure. Over time, you will continue to learn new tricks, and develop your own favorite methods and shortcuts as well. Results may vary, depending on region and climate. I live in a Northwest state of the United States, so it is very humid here with lots of rain and moisture from the evergreen trees. It is also a coastal port city as well, so that adds to the climate, temperature, and elevation. If you live in the desert, you might want to increase the humidity time and use less heat at a lower temperature, for example. This is why you will see different varying opinions on the Internet for pressing books. Climate, regional, and other environmental factors weigh in on the success of pressing books where you reside. In the same vein, do not press books in your attic or garage. Dust, dirt, and humidity can also harm your books and create pebbling or divots. This guide may seem out of order, but there are some steps and things you should know FIRST before beginning to press a book for the first time. Each book requires a different approach. This guide will require countless hours of patience, practice and time. For this guide, you will need basic comic book pressing equipment that can be purchased online. This includes the press machine and supplies for cleaning your comics. I have broken it down into 4 main categories. First, what type of pressing machine should you purchase? Everything depends on your budget and what you feel comfortable with using. I will give you full disclosure here in this section for all avenues and pricepoints so you can make your own informed decision. I prefer option 1, the 15" × 15" Clamshell press, for the digital control unit and built in alarm. Because it’s 15" × 15", it has a larger surface area for a better press. Option 4, is to send your books out for pressing to a professional. This can cost $25-$50 in shipping costs and an additional $15-$30 per book to have pressed professionally. Your budget depends on the unit you choose. Keep in mind you will be saving thousands of dollars in shipping and presser fees otherwise sent out to a professional or inhouse presser at a grading company such as CGC or CBCS. Most professional comic book pressers recommend the Seal brand press above all. The Tivor swivel unit handle breaks off, and also requires regular adjusting of the bolts because they come loose over constant use. The Seal brand press machines range in size. They can be either 15" x 18" for the Jumbo 160 or the Jumbo 210 unit is 15" x 22" in size. Both are super heavy, so shipping cost is expensive. Buy local! This guide is written primarily using methods on a 15" x 15" Clamshell unit, but you can adjust your method accordingly depending on which unit you prefer. In order to press comic books, you will need the basics to get started. Practice on dollar bin books or cheap books. Practice on lots of books. You will need a clean sterile working environment, a press machine, srp paper, and backer boards. Patience and time. Countless hours you will put into learning this technique. Gloves. Box of 100 pairs of powder free latex gloves. Bookmark that reorder button page, too! Sterile Workspace. 4' ft x 5' ft work space area at minimum for your press and supplies in a climate controlled room. Do not press comics in your attic or garage. Backer boards. Magazine Sized backer boards for use between your SRP paper and the book being pressed. (Required, Important). You will use lots of these. Buy in bulk to save money! Bags. Magazine Sized bags for use with magazine backer boards. Assemble a few pairs and have ready for transferring and flipping comic books over. Inkjet paper. HP premium inkjet 8.5" x 11" copy paper. (Thick premium inkjet paper). Do not get laserjet paper - it will stick to covers and pages, pulling inks. Most materials can be purchased on Amazon or Ebay. Buy your SRP paper and backer boards in bulk to save money where needed. Absorene Putty lasts a long time as long as you keep the tub sealed airtight when not in use. Dental Tools. Dental tools, specifically a dental pick and scraper. Absorene Putty. Absorene Book Cleaner putty 15 oz tub should be reordered over time and throw away each piece after each use. Cannot be reused to be effective. Do not use on Modern Age glossy covers. Absorene Eraser Pad. 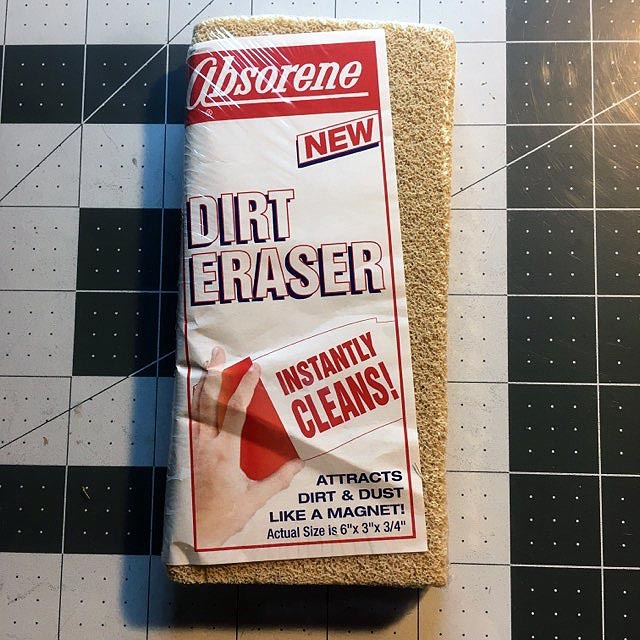 Absorene Dirt Eraser Pad should be reordered over time and thrown away after it has become too dirty to be effective. Cannot be cleaned. Gum Eraser . Gum kneaded eraser. Magic Erasers. Mr Clean Magic Erasers, no scent or fragrance-free. Cut your own 1″ cubes to size. Throw away after 1 use. Cannot be reused. Backer Boards. Lots of non glossy cardboard comic book backer boards of various sizes and thickness. Magazine Backer Boards. 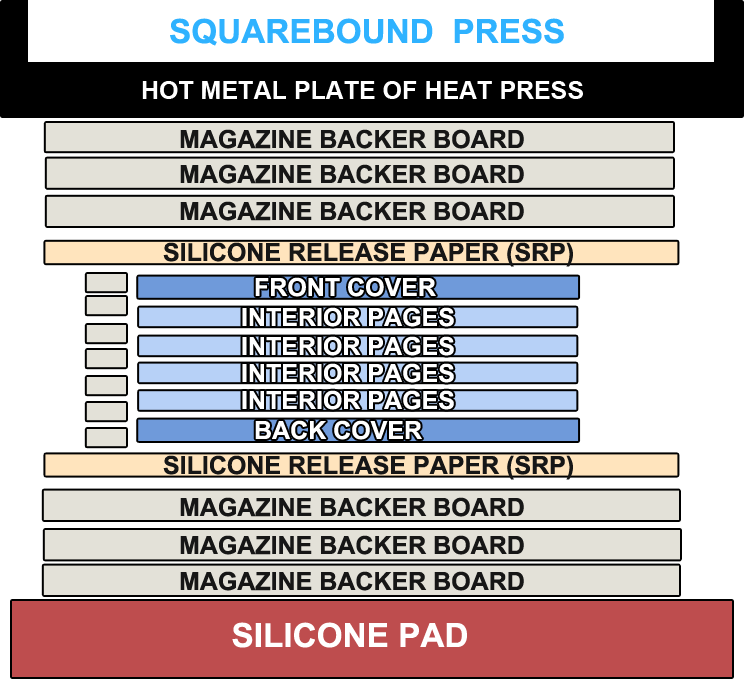 Magazine Sized backer boards for use between your SRP paper and the book being pressed. (Required, Important). You will use lots of these. Buy in bulk to save money! Pencils. Number 2 (No. 2) pencils, unsharpened. Cotton Rounds. Cotton Rounds from the beauty department of any local store like Target or Walmart. 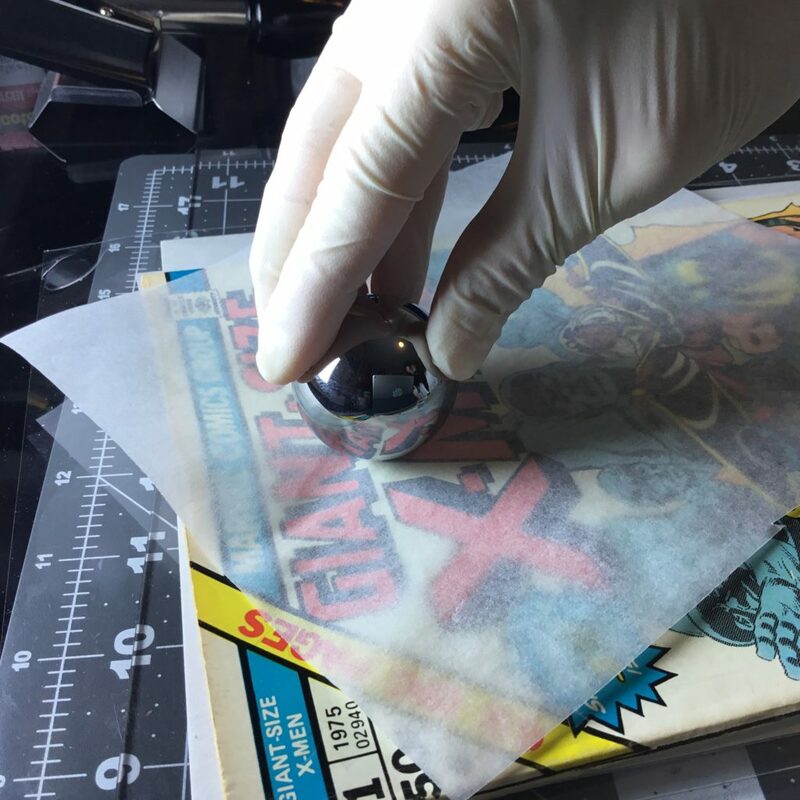 Use these first to remove loose dirt and grime from any comic book. Swiffer Dry Mop Refill Sheets. Swiffer Sheets from the cleaning department of any local store like Target or Walmart. Use these above all to remove loose dirt and grime from any comic book. This is an amazing product right here, folks. Most materials can be purchased in the kitchen department of your local Walmart or Target. All you need is an airtight storage bin with a tray containing your comic book placed on top of some plastic spacers hovering over a 1" water line of distilled water. The humidification begins to take place over a period of 1 hour to 24 hours, depending on severity of creasing and wrinkes on book. This is explained in great detail with photos further down the guide. 40 QT Storage Bin. Plastic Flat Storage Bins with Lids, any one will do as long as there is a lid that can be closed tight. You can use a larger tub as well. Cooking Grille. Weber Grilling Pan any stainless steel grilling grate or pan. Plastic Spacers . 4" PVC couplings or anything plastic and 4" high can keep comics away from water line. Screen Material. You can use t-shirts, terrycloth, nylon window screen, anything to keep water condensation beads away from your books inside chamber. Distilled Water. 1 gallon of distilled water. Use only distilled water inside your humidity chamber to prevent water spots, condensation spots, or any other minerals in the water. Heavy Object. Use anything heavy, such as the gallon of distilled water, to place on top of the lid when humidity tank chamber is closed and sealed for duration of humidification process. In addition to the required pressing equipment, this is the next step as you progress. This section is recommended for when you've mastered the basics of cleaning and pressing. For optimal results use steel plates and 65 lb cardstock on most of your books being pressed. There are always exceptions to the rule but that is the magic formula that works best for me personally. UV Black Light. UV Black Light inspection flashlight for detecting pinholes and tears with sheet of copy paper under cover. UV lights are not reliable for detecting all restoration. Distilled Water. For use in your humidity chamber. Distilled water only. Phone or tablet. Take photos of your process. Tack Iron. Hangar 9 Sealing Tack Iron for dimples, divots, and stubborn spine dents. Steel Ball Bearing. 1.5" Steel Ball bearings for rolling across covers in conjunction with using a tack iron. Plastic putty or paint knife. For staples, positioning, pushing down flat. 100lb Cardstock Paper. 100lb bright white cardstock paper for digital code inserts. 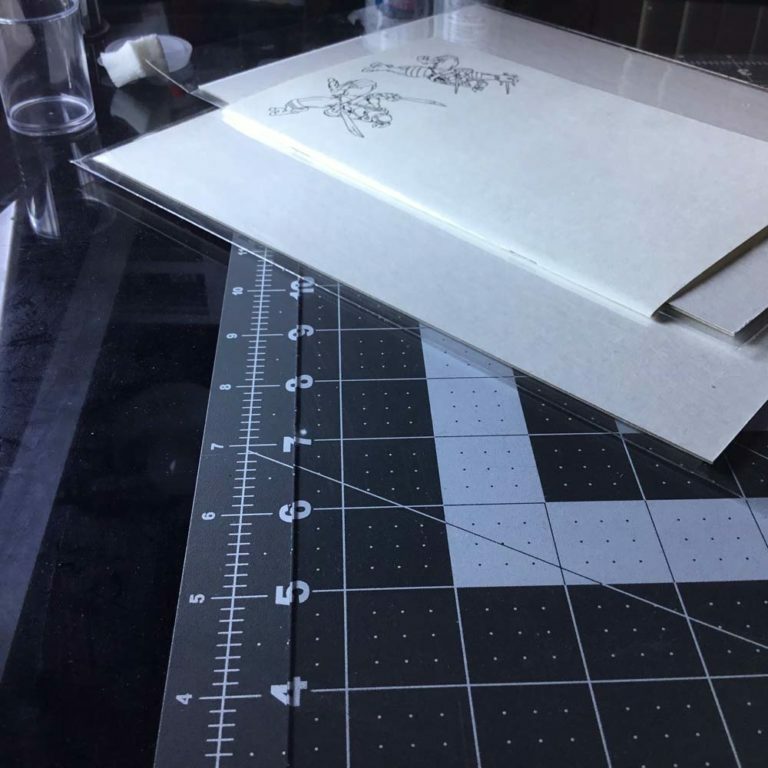 (50 sheets) Use steel plates and cardstock paper for maximum professional pressing results. 65lb Cardstock Paper. 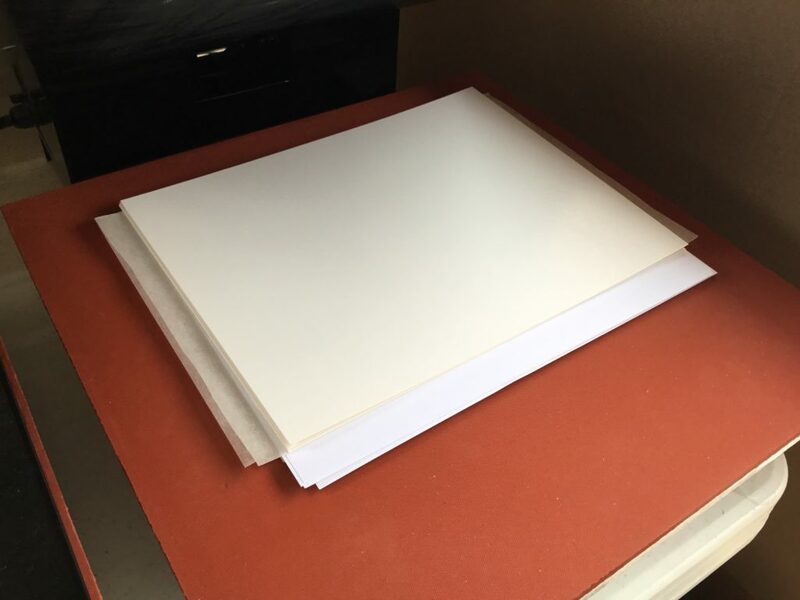 65lb bright white cardstock paper for use under covers for pushing out stubborn spine dents and bunched corners. (75 sheets) Use steel plates and cardstock paper for maximum professional pressing results. Digital Calipers. Digital calipers for measuring thickness of books. Control the required gap for your press machine. Digital IR Thermometer. IR Thermometer for temperature validation on metal platen of your press machine. This is a must have so you can verify your temperatures are accurate when pressing comic books. This will prevent flaring and burned books. Marble Ball . Marble Massage Balls from the health and fitness department of Amazon. This is an optional alternative used in conjunction with a Tack Iron (opposed to using a 1.5" ball bearing) for smoothing out divots and pebbling. Make sure your work surface is clean and free of dust and debris. Comic books are very fragile. Every little thing you do to these graphic novels effects their overall condition. With this mindset, you should always wear latex gloves and use lots of bags and backer boards. When flipping a book over to its other side, use 2 pre-assembled magazine comic book bags/boards or mylite2+fullbacks to support the spine. 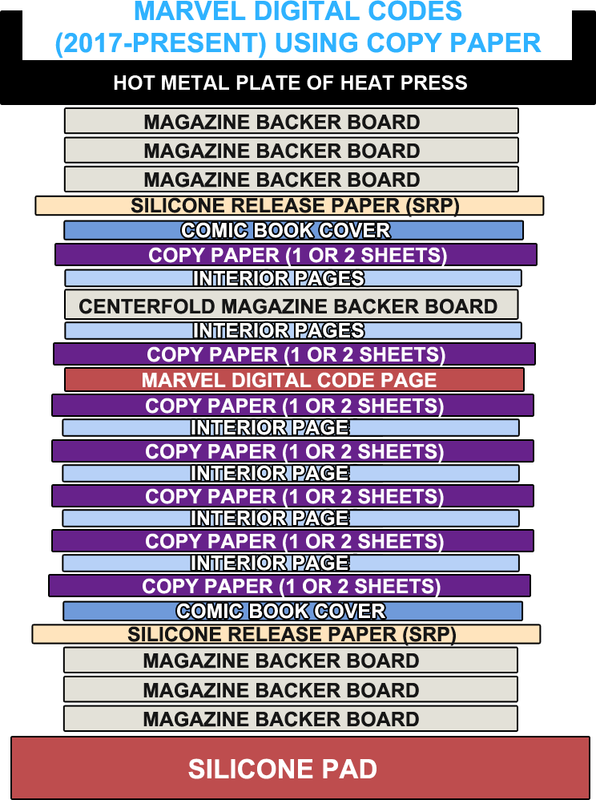 Keep a backer board at the centerfold of each book you work on for spine support. Use dental tools and pencils with eraser tops for cleaning. Always handle each book carefully and slowly. Always slide the comic book out of bag by pulling the board out of the bag at the same time as the comic book so you don't scratch the back cover. I will reinterate: Be sure you slide both book and board inside bag. Do not slide a book inside a "pre-assembled" bag and board. You will scratch the back cover of books. Flipping the book over carefully without causing stress lines to the spine or wavy bends to cover is important. You can do this while pressing books and flipping sides. You can also do this when finished pressing a comic book. The process is very simple, use another clean assembled spare bag and backer board! Avoid dark or black covers using this method (just in case) but it should be okay because you are not pressing the book down when you slide the board under it. Slide assembled BCW magazine bag + board under comic book. Place a second assembled BCW magazine bag + board on top of comic book. Flip comic book over using both hands. Remove top assembled BCW magazine bag + board. Slide bottom assembled BCW magazine bag + board out from under comic book slowly and carefully to prevent scratches and scrapes. Handling pressed comic books is tricky. Make sure you have a separate correct size era backer board and bag ready for transfer. 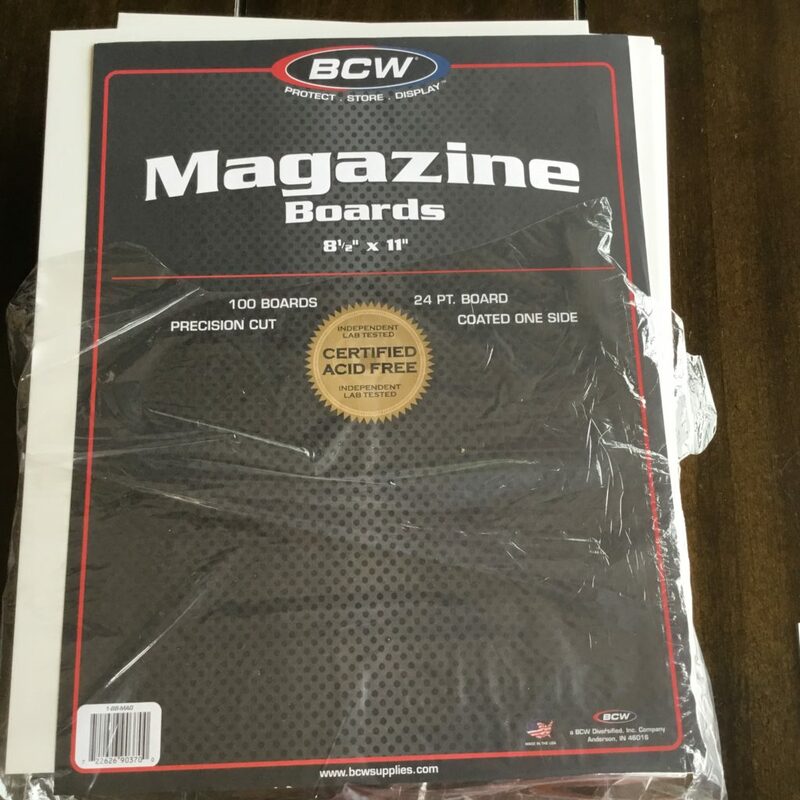 Take an assembled BCW magazine backer board + bag and slide that under your pressed comic book. Move the book across and over onto the backer board you are using for transfer. Take your main-hand and lightly use your index finger to hold the outer edge of pressed book in place. With your off-hand, slide the assembled BCW magazine backer board + bag out from under the pressed book while holding the book in place with your main hand index finger. You are now ready to hold the pressed book in place with backer board to slide into its new bag. Slide your pressed books over onto a backer board or mylite full back. Then, slide your book + board into your mylite2 or appropriately sized comic book storage bag. Buy a plastic letter sized storage container in the office supply department of any major retail store or big box store. There are larger sized ones like the pictured blue one you can use for a larger stack of 10-20 books. This is especially useful for temporarily storing pressed comic books until you are ready to ship to a buyer/client/grader. In order to place a comic book inside a bag + board, be sure to slide the comic in the bag with the board. Pinch the very center top of cover and backer board with your index finger and thumb and gently slide book into bag. Be sure you slide both book and board inside bag. Do not slide a book inside a "pre-assembled" bag and board. You will scratch the back cover of books. Especially black or dark covers. DOES THIS BOOK NEED TO BE PRESSED? BURNING A BOOK Use less heat - keep it under 160 F, less duration. Set a timer on your phone. FUZZY INKS Ballpoint pen and sharpie ink will appear fuzzy or blurry. Use minimal moisture if possible. Use a lower temperature for ballpoint pen marks on cover. COVER IS FUZZY OR BLURRY Too much moisture and humidity (over 14-18 hours). Less time in the humidity chamber (Under 8-10 hours). FLARING Causes wavy pages and wavy cover. Removing book too soon from press or too much pressure (or both). Place a backer board at centerfold to protect the rigidness and flatness of pages. STAPLES ARE CRUSHED OR SUCKED IN Use less pressure with pressure adjustment knob. Place a backer board at centerfold to protect staples. SPINE IS CRUSHED OR FLAT Use less pressure with pressure adjustment knob. Place a backer board at centerfold to protect staples and spine. WARPING AND WRINKLES ON COVER Re-using SRP paper. Throw away SRP paper after 1 use. Temperature is set way to high or there is a malfunction with thermostat on unit. Place a backer board at centerfold to protect the rigidness and flatness of pages. 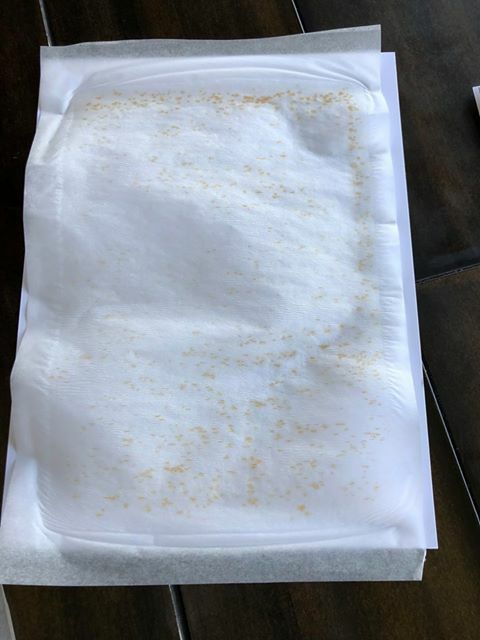 DIVOTS OR CRATERS ON COVER (pebbling) Use SRP paper and magazine sized backer boards above and below the book as a disposable sterile barrier from dirt and dust debris. Wipe each book front to back with a fragrance free, lotion free kleenex. If you use steel plates be sure to sand and wipe the plates clean before use. Using a can of compressed air helps as well. If you blow with your mouth you can get saliva bubbles on book. VERTICAL LINE traveling along spine on covers or interior pages. Too much pressure, backer board/cardstock/copypaper is not placed right up against spine as close as possible. Cardstock paper used is too thick. Try using 65 lb instead. SHRINKAGE (cover can shrink but rest of book measures out). Too much heat. Using too thick of cardstock under front and back cover also can cause cover to shrink. STAINING (water stains, moisture stains) . Use distilled water only. No tap water or bottled water. The minerals can and will stain your books. SPINE ROLLS Books are stacked improperly over a long period of time or production error. SPINE SPLITS on an otherwise near mint book. Production error, or using a backer board under covers with too much pressure. STARCHED COMIC BOOK All pages stuck together. Enture book is starched and stuck together. Modern glossy page books require a much lower temperature setting, such as 145 or 150 degrees. Try lifting each page one at a time. ADVERTISING COVER Ads from inside cover inks can be seen through the cover from page inks underneath. Too much moisture followed by too much pressure and heat. IE., "overdoing it". STAPLE PUSH Staple prong pin holes or color rub on cover. Too much pressure when pressing, or improper inspection should have notated the staple prongs need to be pushed down using a plastic putty knife or similar tool. Most common with glued squarebound books such as Silver Surfer 4 or Giant Size X-Men 1. DIGITAL CODE SQUARES Marvel and DC Digital Code Insert imprints of 1" square on last 8 pages of book, including back cover. Improper preparation for pressing a book with a digital code. The pressure of the press imprints the digital code into each page before and after the code. You must use cardstock paper or copy paper to cushion each page before and after. (Up to 4 pages before and after to back cover). SCRATCHES Back cover is scratched. Make sure you slide a book with board inside a bag. Do not slide a book inside a pre-assembled bag and board. RUST (Iron Oxide) or Mold on cover. Rust can form on the steel plate of press when pressing damp books from humidity chamber because moisture seeps through SRP paper if not using a buffer such as a backer board. You must also change out all paperstock and SRP paper after 10 minutes and re-press as normal before leaving overnight. WASHED OUT COLORS Faded colors on cover. Too much humidity. Less time in the humidity chamber. 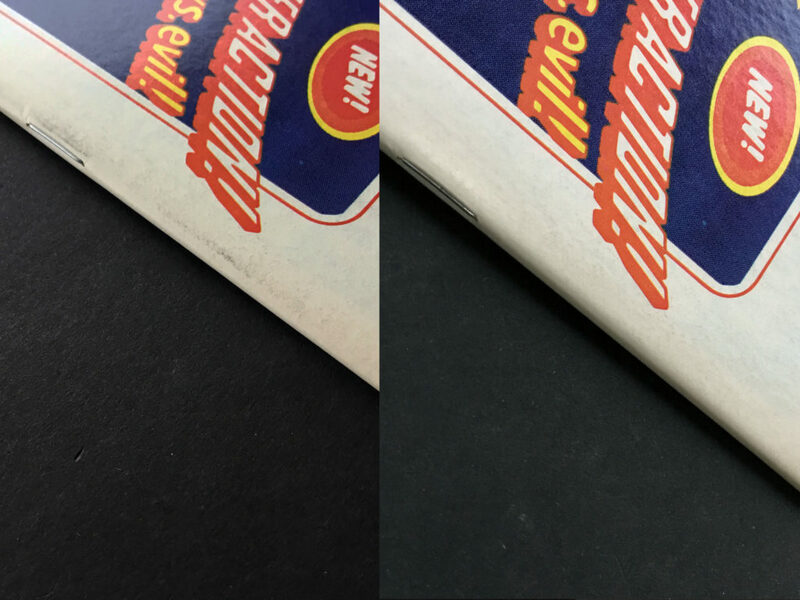 Using too much pressure with erasers can also cause color rub faded colors on cover. COCKLING Wrinkles on cover. Using too much steam from a clothes steamer. Re-using SRP paper and cardstock or copy paper. Always use SRP paper once and done. You will imprint wrinkles from used SRP paper right into the next book you press. SPINE DENTS Spine ticks. If you spot new spine dents that weren't there before pressing, the book was incorrectly handled prior to pressing or afterwards. Make sure when you flip a book to use 2 assembled bags and boards to create a rigid surface for flipping and transporting a book. FINGERPRINTS If you spot new fingerprints that weren't there before pressing, the book was incorrectly handled prior to pressing or afterwards. Make sure when you press a book you always wear cotton or latex gloves. Use lotion free kleenex tissue and wipe in circles. COVER LIFTING CURL and/or wavy. If your front or rear cover starts curling or looks wavy after pressing, you may have let the book cool down too fast or it was heated up too fast. Try leaving the press off until you have the book inside press machine and clamped down in the closed position. Then turn press machine on and let it heat up slowly and cool down slowly. Humidity may be needed to repair this book's paper fiber memory. While rare, another reason could be an outer corner crease fold with creaseline and a middle tear along bottom or top edge. This can cause the cover to curl as well. FUSION of some pages stuck together. Book has been pressed at too hot of temperature. Modern age glossy modern comic books with glossy interior pages and cover cannot handle extreme heat temperatures. Try pressing the book at 150 or 155. To repair this, be sure to carefully unstick each page one at a time. Or, you can try slightly bending the comic book vertically down the middle. You should hear the pages unstick. Otherwise, the pages have fused to one another and this book may be ruined with color loss and ink rub when separated. 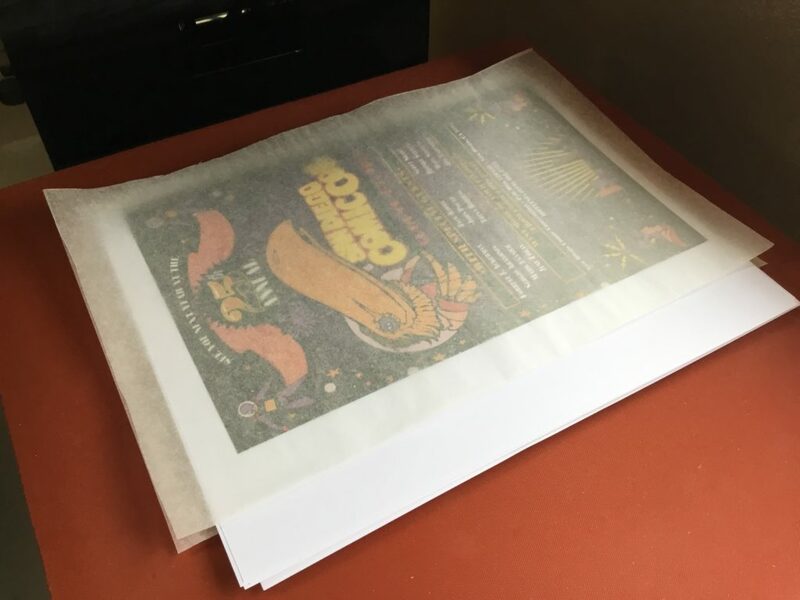 INSIDE COLOR RUB If your inside covers appear to have missing inks or color rub, scrapes, or light spots - the cover fused to a sheet of inkjet copy paper or cardstock paper. Always use inkjet paper and not laserjet copy paper. 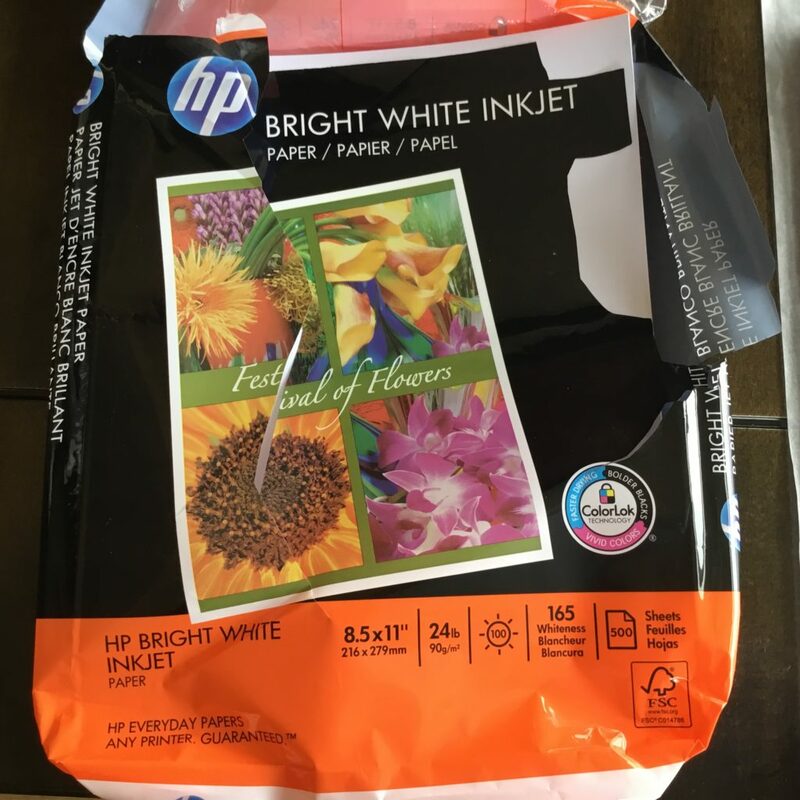 The laserjet paper will stick and pull inks. Otherwise, the book was pressed too hot and is permanently damaged. Press at 150 degrees or 155 degrees next time for glossy interior pages and covers on modern age comic books. Modern age comics cannot handle temperatures past 160-165 typically. CANVASING Fine tiny square gridlike patterns across surface of book cover. This is caused by using too much pressure and/or re-using teflon paper sheets. I recommend disposable $0.02 cent sheets of SRP paper from ULINE to eliminate canvasing, pebbling, and pitting. Now both Marvel and DC Comics modern age comic books have digital code inserts inside the last few pages of every book. 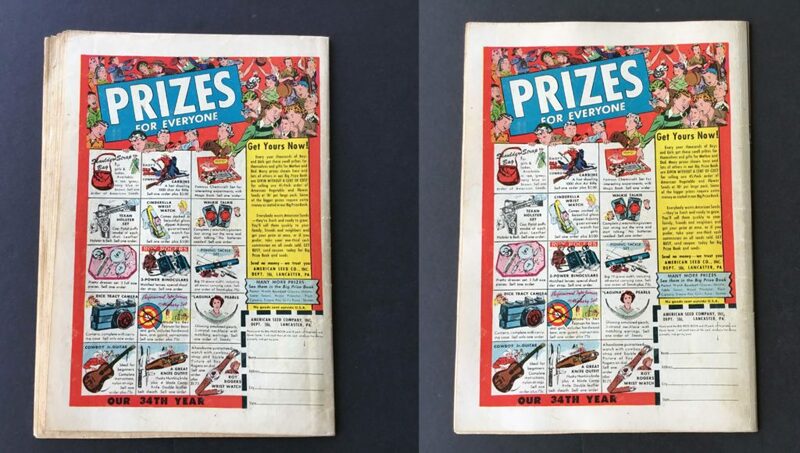 Some older books also have Tattooz inserts or other items, such as 1990s Image Comics Image #0 coupons and vintage Mark Jeweler's Inserts. Mark Jeweler's inserts are found inside newsstand copies of comics that were sold around close proximity to Military bases. Other books that come to mind are the 1990s Marvel books such as Web of Spider-man 119 which featured Marvel subscription offers with envelope and form to fill out. Regardless, all of these books require a very different and very careful approach. You need to make certain the digital code or insert does not press or imprint a 1" square onto the back cover and adjoining interior pages. Further down the guide this will be explained in greater detail. If you remove the sticker, CGC will give you a blue label but the label will note "DIGITAL CODE INSERT REMOVED FROM BOOK" under title. CBCS will most likely give the book a 0.5 grade stating "INCOMPLETE" on label. Once a digital code sticker is removed, there is no sticky backing to reattach the sticker to book. Also, once removed the stickers can peel and wrinkle. Try not to ever remove the sticker from a book, it will effect the grade and label of book. Purchase a blackboard at your local art supplies store. Coldpress blackboard, used for school projects and presentation displays. They cost around $2-$5. They are soft and will not scratch your book covers. You set your book on that and spin the board around so you don't have to touch the comic book or scratch the covers while taking photos. Looks more professional than an ugly table or background distractions. Also, you can freely spin the book without ever moving it physically. Use a phone or tablet to take photos before, during, and after your work. Photos can provide clues to your own work as a resume for others considering your services. Photos also can show proof that damage was done to a book before you started working on the book. Photos can provide a lot of details and clues to everything. Lighting is key. Hold your camera or tablet steady before taking the shot. Do not take blurry dimly lit photos. That is worthless to you and anyone else inspecting your work. Take all your photos under a well lit room with lots of windows during the daytime. Take photos at every angle of the book so you can see the bumps, waves, bends, creases, and folds of the book in question. Start a facebook photo album if you don’t own a website or gallery page. Photos mean everything! If it's night time, wait until tomorrow for better lighting. If you don’t have time, make time. This is not a good example of a photo that displays your work. This photo displays the entire book in one shot, with lighting at an angle to show others the overall “sheen” or “shine” of the surface of book. Lighting is key. 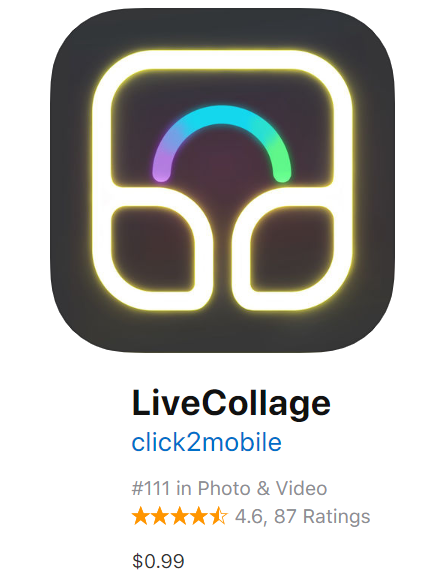 If you have an iPhone or Android, search for the app "LiveCollage". It's only 99 cents. This is a great application for taking the same photos and combine into a photo collage that displays your "before" and "after" shots with ease. This is a valuable tool when showing your work to clients and peers. Highly recommended! Be sure your work surface area is clean and smooth. Using mylite2+fullback for sharp edges for protection as a barrier under the book can prevent surface wear and staple rub. Always use gloves. Always. No fingerprints! Heat is the number one ingredient for a successful press. That heat can also transfer oils from your skin to the plate or the comic book. Before you start using the press, put on some latex gloves. I prefer the small size so you get a firm sensitive grip. 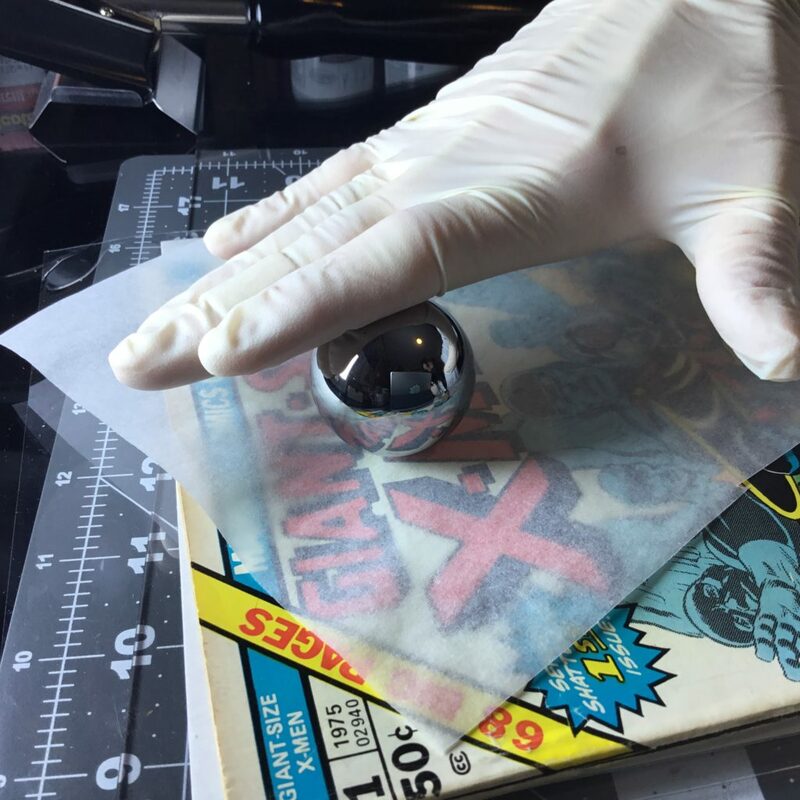 A clean, smooth, and flat work surface is crucial when cleaning and pressing comic books. You can prevent un-necessary surface rub or wear on the book being cleaned or handled. The best way to do this is to use Golden Age size Mylite2 + Fullback boards to handle and transport books. You can even use 2 mylites+fullbacks above and below the book to flip the book over easily as well. Magazine sized bag + board also works well too. I use a glass artist table folded down flat with a cutting mat on top of that. I have placed a sheet of plexiglass down on top of the cutting mat as well for a smooth shiny surface to work with. 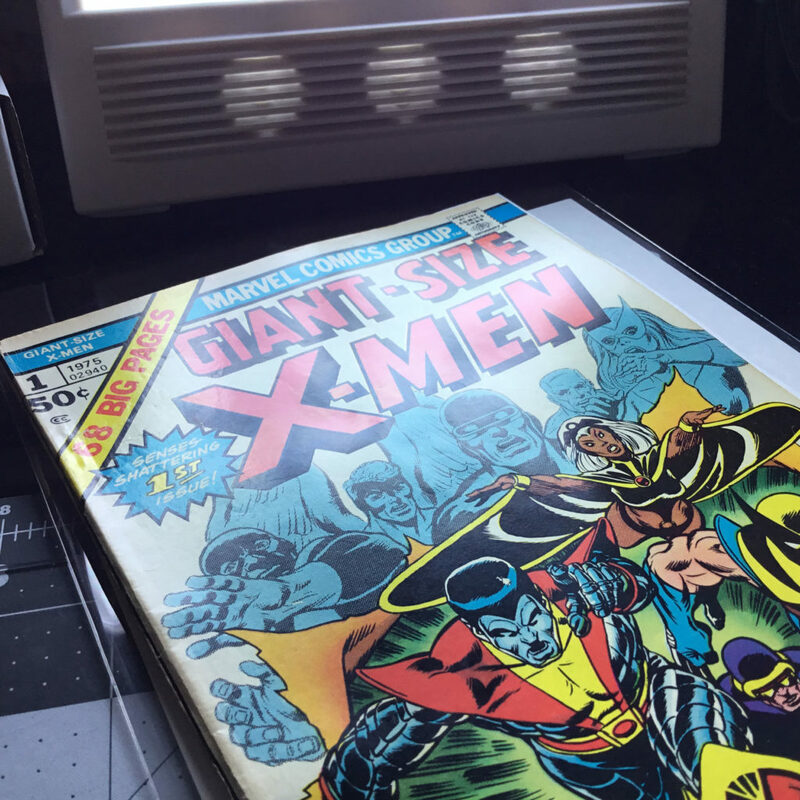 It’s a good idea to keep a Golden Age size Mylite2 + Fullback board underneath the book while on the desk surface so you can swivel and slide the book without damaging it. You do not want to spin the book on a bare table surface. Ever. Next you can gently place a Golden Age size Mylite2 + Fullback board inside the cover of the side of the book you are cleaning. This places firm pressure on the other side of the surface you are cleaning without risk of damaging the spine. A magazine sized backer board and bag will work as well. Place a mylite2+fullback or magazine sized backer board and bag inside your cover being cleaned but not all the way against the spine. Don’t press too hard either when cleaning or you will have a light visible vertical line running down along the spine you will have to press out later. Use a UV Black-Light inspection flashlight to detect pinholes and tears on cover with a sheet of inkjet copy paper underneath cover. A blacklight flashlight does not show as much as you would think. It's not a reliable tool but can spot some color touch. This book was cleaned and pressed with light humidity tank exposure. Graded by CGC at a 7.0 FN/VF with off white pages. You should first start with a basic cotton round (used for makeup removal) for removing any loose dirt particles or grime. This is a very effective and non-invasive form of dry cleaning your book. Use a dental pick and scraper to carefully lift and place tears or folds where they should be before pressing or cleaning. For dry cleaning, it’s always best to start in a non-aggressive manner, so start small with just a simple clean eraser from a Number 2 pencil. I also use eraser tops as well. You will need to clean your pencil eraser often as you lift the dirt and oils from your comic book. Cleaning a book should be approached in stages. Starting with latex rubber gloves, use a dental pick for lifting up folds and creases. Do this first. Lightly dust off and wipe the surface clean lightly with a cotton round, lotion free Kleenex, dust cloth, or a can of compressed air. Try using a regular unsharpened #2 pencil eraser end to remove light staining on cover. This noninvasive method is recommended before using anything else. Also, worth of consideration is Swiffer brand dust sheets as cleaning pads. This product is great and will safely lift most dirt and grime layers off comic books. Try it! #1 recommended method to clean comics is a simple pencil eraser. Use the Absorense Eraser Pad to clean your pencil eraser top as it gets dirty during cleaning. 3 weeks with CGC and this book has been graded a 9.6 Near Mint comic book. Go slow with the Absorene around corners and tears. 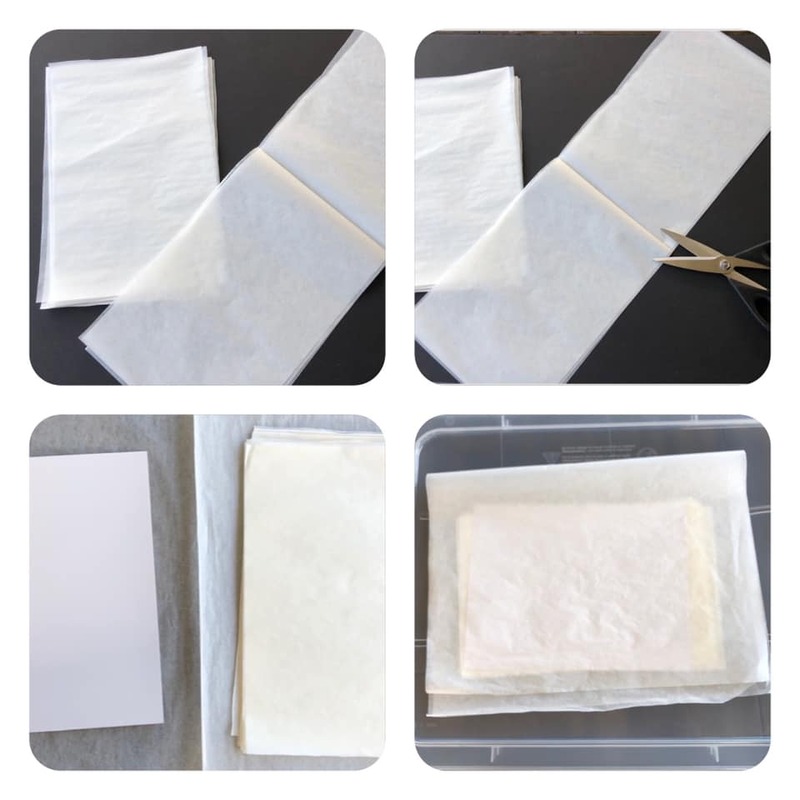 You should place a perpendicular mylite2+fullback or magazine sized backer board and bag against your hand so that you do not lift up the cover or page being cleaned. Cut 1″ cubes of Mr Clean Magic Eraser to alternate from Absorene Book Cleaner Putty and Magic Eraser along spines. Never reuse a magic eraser cube. Apply firm but gentle pressure against book. 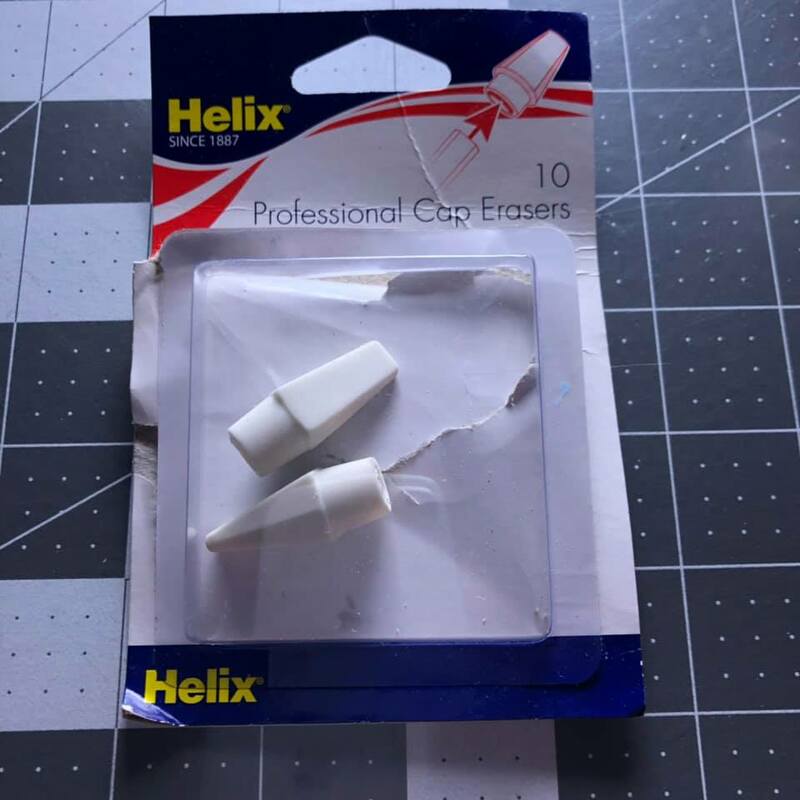 Erasers are best used for white or light covers. Avoid red and black with the magic eraser! Notice the following book also is a white cardstock cover. This is the best method for that type of paperstock and cover. Thin paperstock covers or glossy covers should be treated using a different method of approach. Staples can push through the front and rear cover. Dirt and oil like to get trapped around elevated bumps along staple on back cover. If you can already detect staple rub on the front or back cover you should probably use copy paper or a backer board inside the cover. Press with lighter pressure using the adjustment screw on press machine. Squarebound books like Silver Surfer #4 or Giant Size X-Men #1 have this effect with staples and pressing. Cleaning staples is not recommended either. Watch for rub and try not to clean them or scratch them up too much. It can be evident if there is staple cleaning with third party Grading Companies such as CGC and CBCS so I caution you on scuffing up staples. Rusty staples should be lightly scuffed but I would not recommend it. Some books will benefit from humidity to loosen up the paper fibers for a more successful pressing. “There are three basic steps to humidification: cleaning, humidifying, and weighting or flattening. Each step requires somewhat specialized equipment that can be easily constructed from materials gathered from common sources, such as hardware and fabric stores." Further in the guide, under advanced topics, you will learn more about how humidity works in the process prior to pressing a heavily creased or folded comic book. 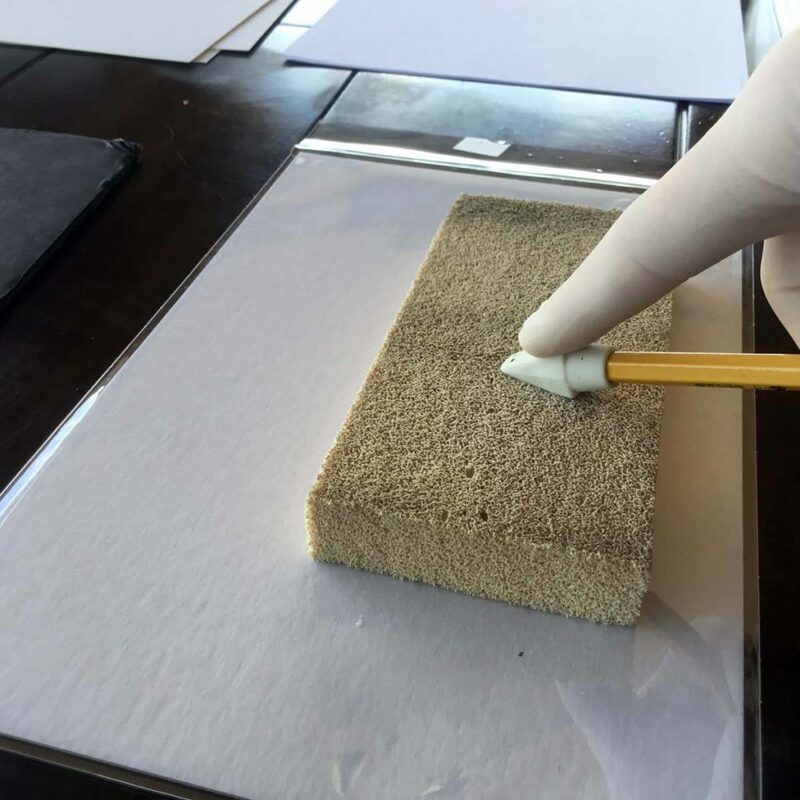 It is important to remember that any dirt on the surface of the paper may become muddy during humidification and will set further into the paper fibers. This will make the paper difficult if not impossible to clean in the future. The surface of the paper should at least be swept with a soft, natural fiber brush before humidification. If the papers are heavily soiled, consult a paper conservator about surface cleaning before proceeding. Before proceeding with humidification, remove fasteners such as clips, staples, brads, and rubber bands. Extreme care must be used when initially opening papers that have been folded or rolled. 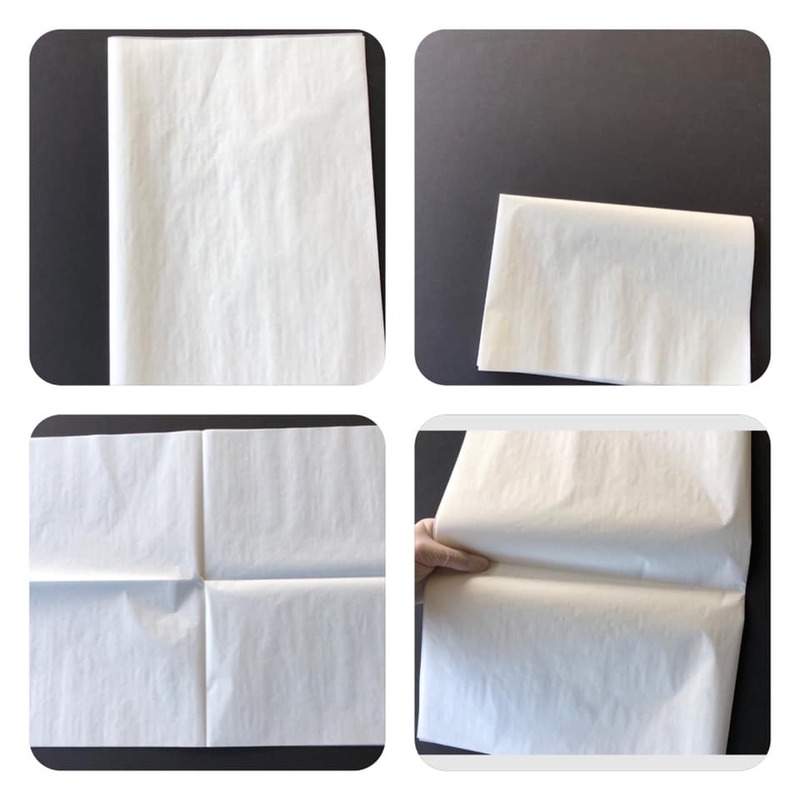 While some papers remain supple over time, others may grow increasingly fragile due to inherent weaknesses, widely fluctuating temperature and relative humidity, or exposure to light and/or to chemicals in the atmosphere. As a result, paper remembers creases, folds, and curls. If records are not flattened carefully, they may crumble and their valuable information will be irretrievably lost. Never attempt to open a rolled or folded piece of paper if you are uncertain of its physical condition, particularly if the climate is extremely dry (less than 35% relative humidity)." You will need to practice first on 7 basic types of comic books to learn the process slowly. Practice on your own books first. Practice treating each book as if it were priceless. 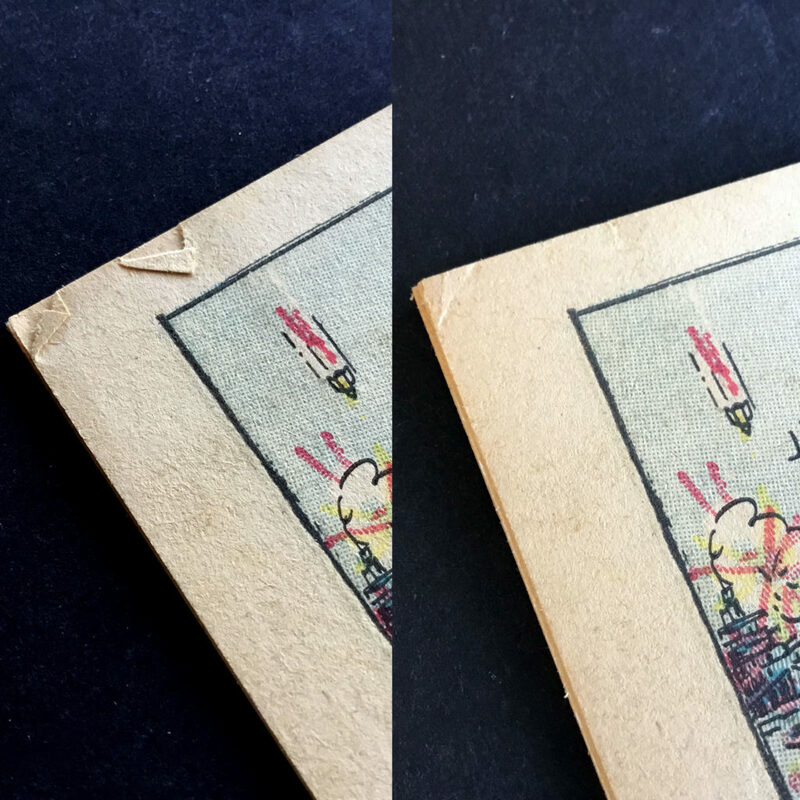 Golden Age Books are brittle, require steam or humidity, and require extra care when handling. Silver Age Books can also be quite brittle, and have edgewear like crazy. Watch for rusty staples. Bronze Age Books have a different type of paper, semigloss and with inserts. Modern Age Books with Glossy Magazine Paper books can have pages stick together if too hot! Under 150F and under 5-7 minutes at a time. (5 minutes on each side) The pages will stick together otherwise and you will create a razor blade comic book. It is not necessary to place one sheet of Silicone Release Paper (SRP) between each page of the entire book before pressing to avoid pages sticking together so long as you do not go any higher than 150 degrees. Foil books (Convention exclusives) are more intimidating if anything. Watch your fingerprints! Always wear gloves. Same rules apply as if it were a glossy modern with glossy pages. Too hot and too long will ruin the book! 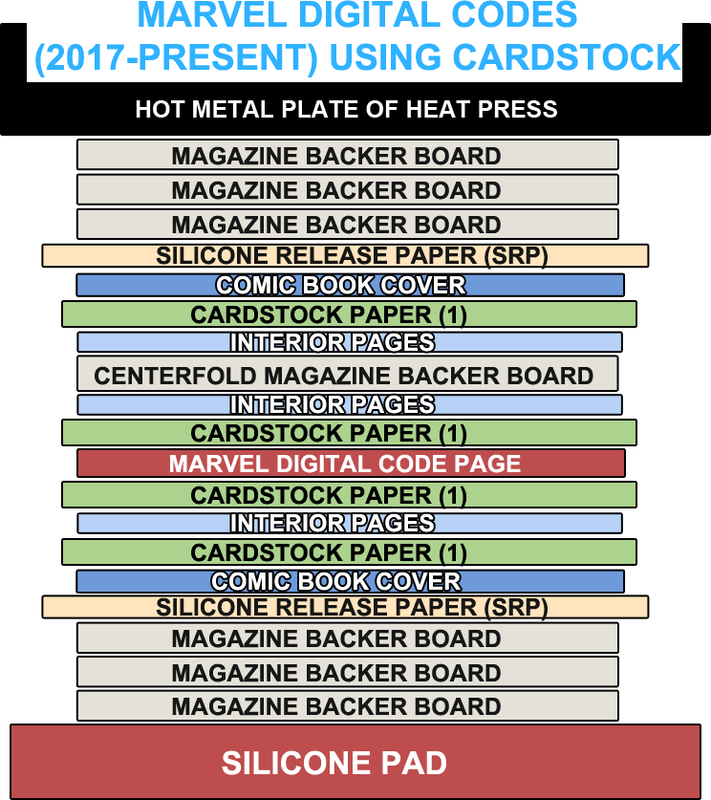 Keep a backer board at the centerfold for foil books. 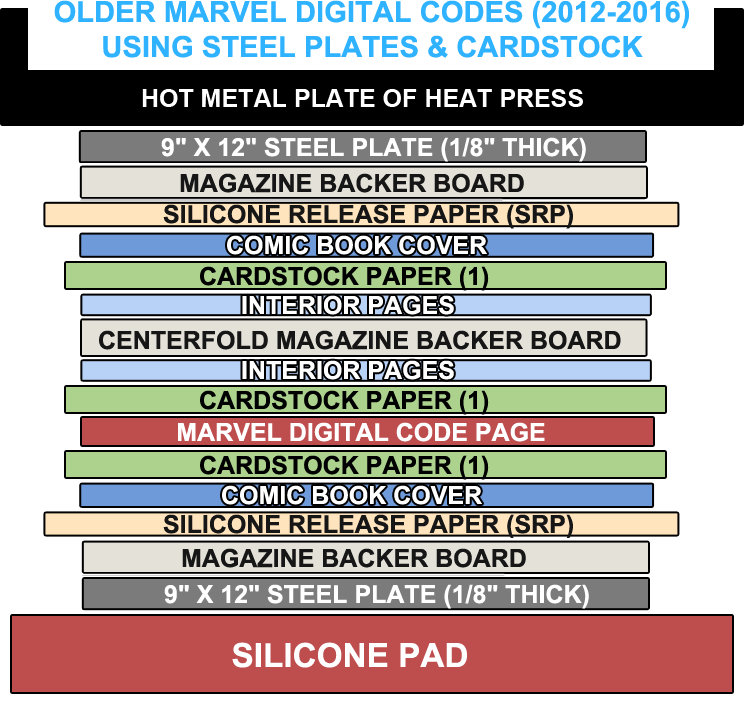 Digital Code Inserts Marvel and DC both now have online digital code inserts found at the last 4-6 pages. You will need to use cardstock paper to prevent the 1″ or 2" square digital code from imprinting on last 4-5 pages and back cover. Gimmick Books are books that have die cut, embossed, glow-in-the-dark, hologram, or lenticular covers. Embossed covers will need to be cushioned with cardstock paper. Gimmick books can be safely pressed using less pressure under low heat (150-155 degrees) for 5-7 minutes and left overnight in a cold press machine. 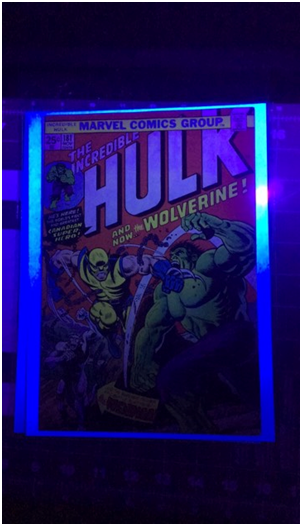 Heating up glow-in-the-dark comic book covers actually re-activate the glow powder crystals in the paint, which effectively make the glow effect appear brighter with bolder colors. Cardstock covers are tough and resiliant so they should be pressed with cardstock paper or backer board underneath cover. There are more to practice on, but this is a great head start for the learning process. Different books require different angles of approach. Practice how you handle a comic book as well. Always wear gloves. Always lift and remove comics from their bag/board by pulling the entire comic and board from the bag. Always use a second bag/board to flip books over so they are supported. Chromium cover books or holofoil books cannot be pressed. The required and necessary heat will melt the covers and shatter the art into spiderweb patterns. 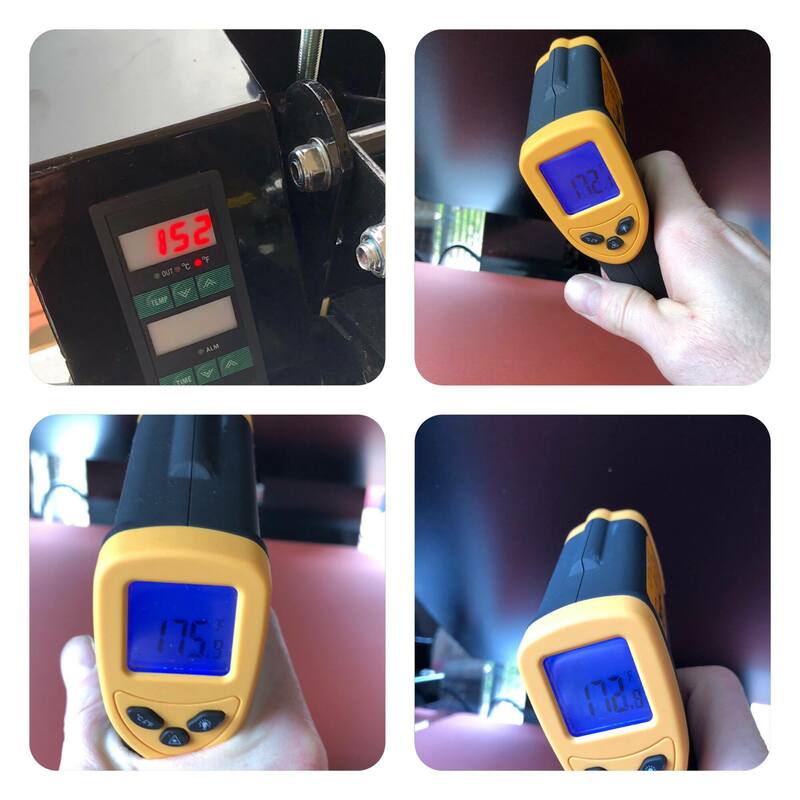 How to Calibrate the temperature of your new Heat Press: On a new heat press, it is not unusual for the temperature settings to be off by 18 to 20 degrees. 2. When the press heats to about 100F, press the down arrow on the control panel for 5-10 seconds. The heat press will go into Calibration Mode. It may take as long as 20 minutes to finish this process. Do not turn off or unplug the press during this time. This is the incorrect way to measure the top platen with an IR Thermo Gun. The readings are too erratic from light waves reflecting off the satin finish on top platen. 1. Using the control panel screen, press the “Set” button then the up or down arrow to the desired temperature. 2. Press the Set button again and set the timer using the up and down arrows. 3. Press the Set button and arrows again to choose Fahrenheit or Celsius. 4. Press the Set button again to confirm these settings. 5. Press the Set button and use arrows one more time to set an alarm that will notify you in advance when it is time to open the press. This is the correct way to measure your top platen with IR Thermo Gun. Place a backer board on silicone pad and close press machine. Wait at least 60-120 seconds and lift clamp. Measure backer board immediately. Alternatively, you may press and hold the backer board against top platen and measure with IR Thermo Gun. Use the adjustment screw and washer to adjust for pressure sensitivity against thickness of book. It takes time and practice to master this through experience. Always use light pressure. Counter clockwise backs the pressure force down by 1/16" each full turn. If you press a comic book with too much pressure, you'll know by the staple indentations left behind on the backer boards used as a buffer. Make sure you do not see staple dents on your boards. Reverse the pressure adjustment knob by turning counter clockwise. Sometimes this can happen, even if you feel it was a light yet firm press. This is another example why you should replace all paperstock between presses/flips. The dents can imprint onto the next book you press. You will see staple dents on your backer boards if you used too much pressure. This causes staple push and color rub on comic books. You also risk staple dents through every page of the comic book as well. For the smaller swivel model variation of heat press machines, you will need to watch that top long bolt at the very back top side of unit the adjustment knob resides on. This applies to the 9x12" or the 12x10" versions. Over time the entire shaft or bolt itself becomes loose. It is necessary to finger tighten the bolt when consistently using the swivel action back and forth between presses. Also, you will need to wrap the entire handle with black electrical tape so it doesn't snap off in your hands. The swivel mount heat press has a weak impact zone at the handle. Over time this will snap off in your hand. 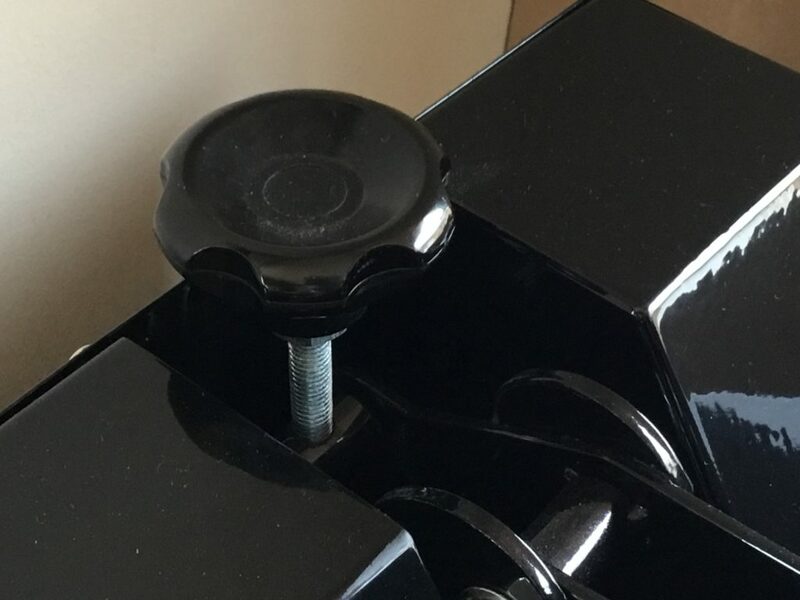 Use electrical tape to prevent handle from snapping off the swivel mount press machines. Make sure when the hot metal plate is going down on the book that it clamps down with firm yet little resistance. You are not wanting to press the handle down so hard that it takes great feats of human strength to clamp down on the comic book. If you are doing this, then you are creating razor blade spines to shave with. Do not create razor blade spines. This also can cause staples to push through front cover or spine. This is known as “staple popping”. This can also cause the staples to appear sunken into the book as well. Use caution and self control when pressing the plate down on the book being pressed. This is crucial to a successful press. 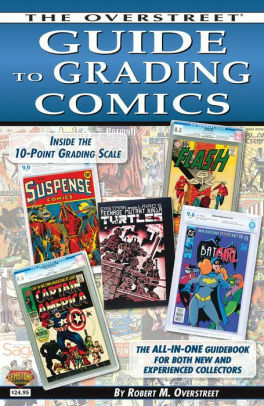 The goal here is to press with the mindset of a grading company looking at your book. Smoothness and glossiness. Deep folds and color breaking crease lines cannot be fixed. Press so that is is not evident you pressed the book. Paper burns at 451F (degrees Fahrenheit). Most comic books can be safely pressed at 160F degrees but not any higher. 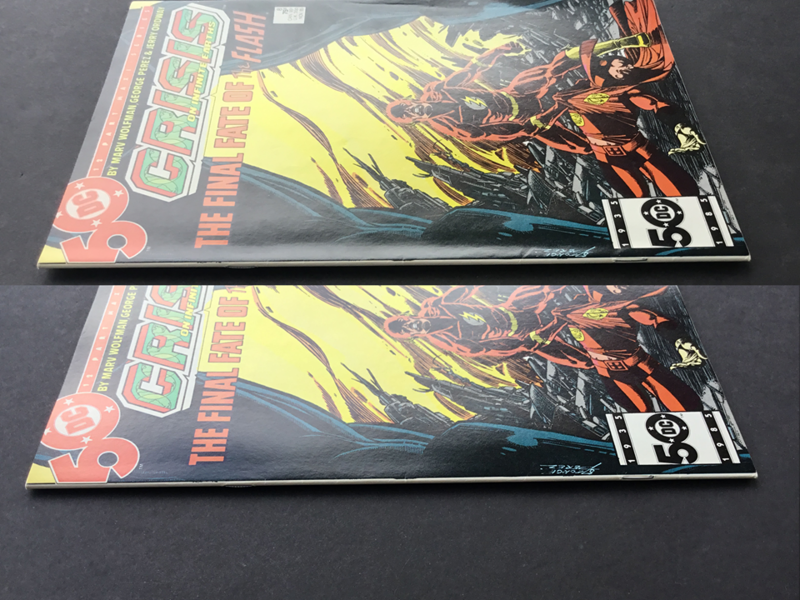 Glossy comic books with glossy paper will melt and stick pages together if using temperatures higher than 160F. I typically press most comics at 150F-155F degrees. 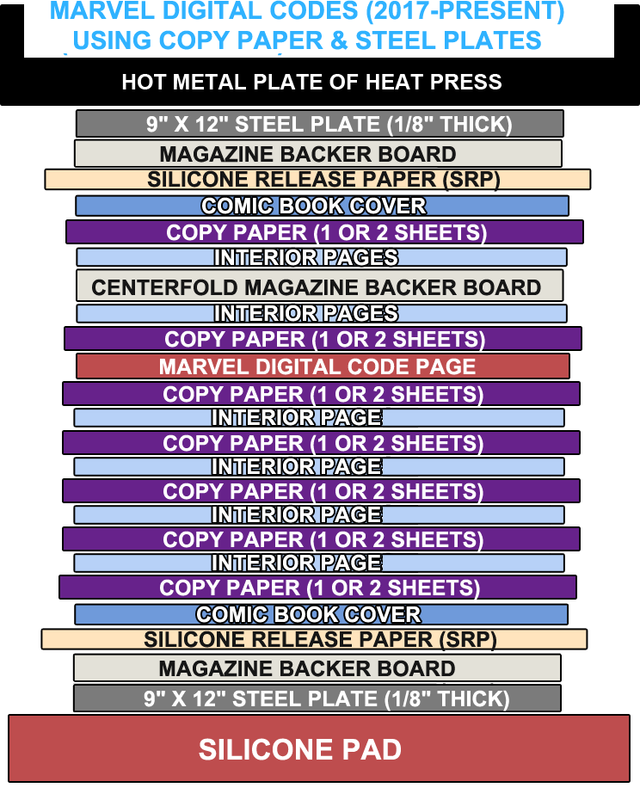 Brand new modern age comic books, foil edition covention exclusive books, glossy paper comic books, magazines, and books with inserts should be at a lower temperature, at 145F-150F degrees but left in the press a lot longer to compensate for the lower temperature. I have success with 150 degrees for just 10 minutes for glossy moderns, without making all the pages stick together. Determine what age the book is. Then determine what type of cover and paperstock the interior pages are made from. I would not press a book under high heat for longer than 30 minutes per session. Too much heat can cause flaring and damage a book as well. If your press machine does not have a built in digital timer, you should get one or set your phone timer. If you are using metal steel plates in your press, you will not flip the book. After the heat press stage is complete, you will shut off the press. Leave the book in the press with the temperature shut off and cool down for several hours. 12 hours is minimum time before removing from press. Probably ideal to leave the book in the press for 24 hours or more. This advice is for owners of a Bienfang or Seal brand laminating dry mount press machine. If you have a 15x15 clamshell press or swivel model unit t-shirt press machine, you may skip this section. The thermostat (all of the seal presses have a thermostat) is the control knob and some have a temp gauge (while some do not). There is a Trimac relay in some older models that may need to be removed/replaced for proper operation. To verify and validate you are pressing books at the correct temperature, you will need to purchase an IR Thermometer. (Link provided at top of guide). Heat press to 200F. With a partially closed press machine, open and read slowly from left to middle. Next, partially close press and open, read from right to middle. (Partially closed means platen down , but not closed all the way.) Both readings on thermometer gun should be within 5 degrees -/+ of 200F. If not adjust thermostat knob. If adjusting thermostat does not work, replace the thermostat unit. The part is readily available from the catalog online. If you have the correct temperature on one side of platen and the other side is cooler then it's time to replace the metal platen. 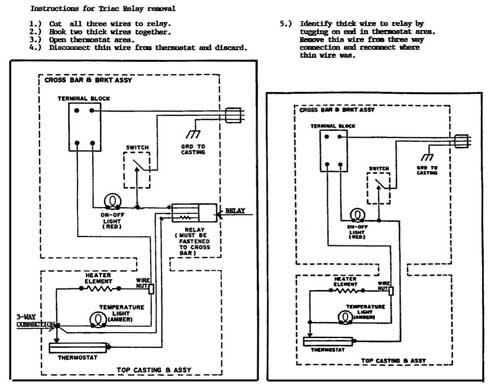 Another problematic part could be the triac relay - this applies to older units. For Triac relay removal procedure, if they are still in the machine they should be removed (only in older machines, they did away with them in newer models). 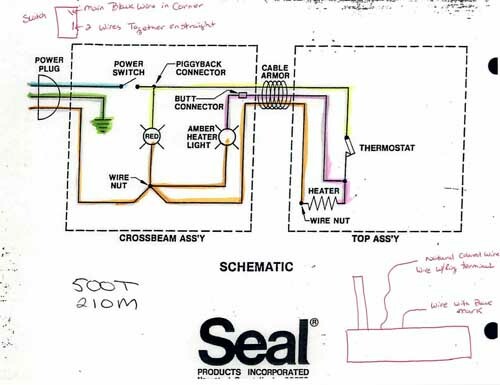 For conversion from old thermostat to new thermostat unit. The older ones had wire screws the newer ones are press on . The conversion is in the document. In order to maintain the pressing, and not have “muscle memory” of creases and spine bumps, you have to let the book be completely cold inside the press before removing it. Heat is the number one ingredient for a successful press. Pressure is number two. These 2 main core principles are crucial to the pressing process. Humidity and moisture are varying factors depending on paperstock and condition. Most books can be cooled down quicker than naturally. If you just simply use a standard $20 box fan at the store, this will cut your cooling down time to 8-12 hours instead of 1-2 days. You can also buy a second identical press and use that one as a “cooling press” as the other cools down. Alternate for 2-step pressing to save time and maximize your time constraints. If you are having trouble pressing a book, leave it in the press for several days or even a week! Basic one time press under high heat for 10 minutes and left in press machine for 24 hours. This book could use another press one more time to get that last bit of faint vertical bend traveling along spine. After the second press the faint spine bend is gone. 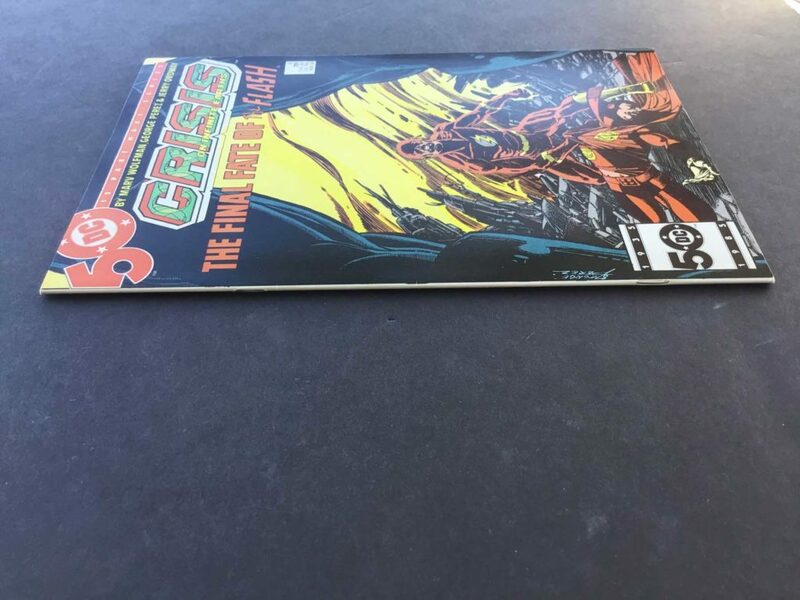 1985 Crisis on Infinite Earths Issue #8. Be sure you feel the top of the plate with your hands before removing any book from the press. You are making sure the press plate is ICE COLD. Not even warm or room temperature. Make sure the press plate is cold to the touch. If you have a second press, place the book inside the press that has a completely cold press plate for faster cooling. 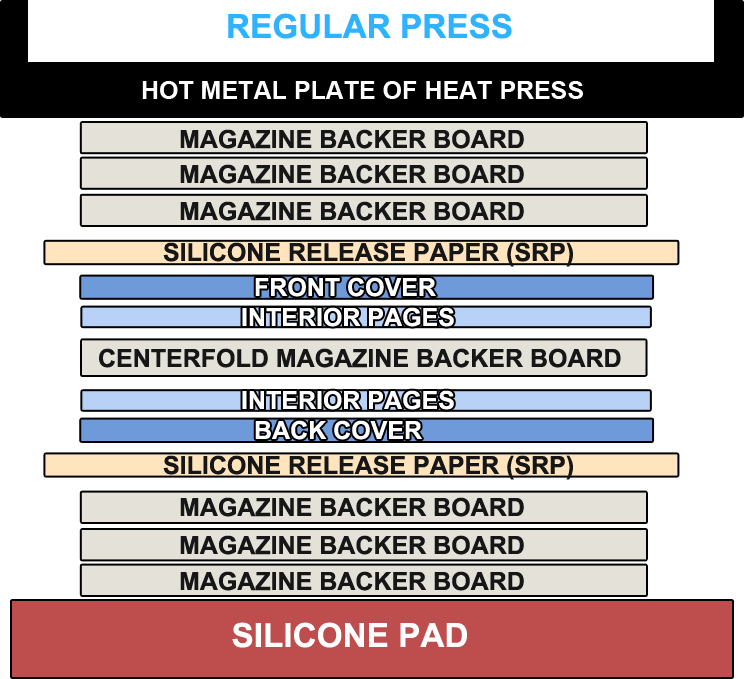 Protect the rigidness and flatness of the interior pages by placing a magazine sized backer board at the centerfold of all books being pressed. This will also protect the staples as well. Otherwise you books will flare and have wavy pages. If you take the book out of the press too soon or too much heat (or both), it causes corner flares. This does not ruin the book, but it does require a second press at less heat with an overnight cooldown time of 24-48 hours. Too much moisture can also cause a wavy cover. Remember, most books do not need humidity. Try experimenting with different humidity times and cool down times based on your climate. If your book has flaring you should lower the heat duration and humidity levels when pressing the book in question. Flaring is caused by too much heat, too much pressure, or too much moisture. Sometimes all of the above are contributing factors. Less is more. Removing the book too soon from the press while still hot can also cause flaring. Always use a magazine sized backer board at the centerfold for all books being pressed. The only time you do not use a backer board at centerfold is for glued or squarebound comic books. Another example of a book that was graded with flaring. While rare, reversion can happen. Check back and verify your book retained a good press after several weeks. I recommend this step especially if you are pressing a book for a client, friend, or a grading company! It is entirely possible to come back several months later only to find your hard work performed on the book reverted back to it’s previous state. If this happens, you are definitely going to have to press the book for a week or longer to keep it’s shape and press. Some books can be stubborn. Don't doubt your pressing abilities, just accept the fact some books will need to be pressed several times to behave. BACKER BOARDS INSTEAD OF SRP AGAINST PLATE? 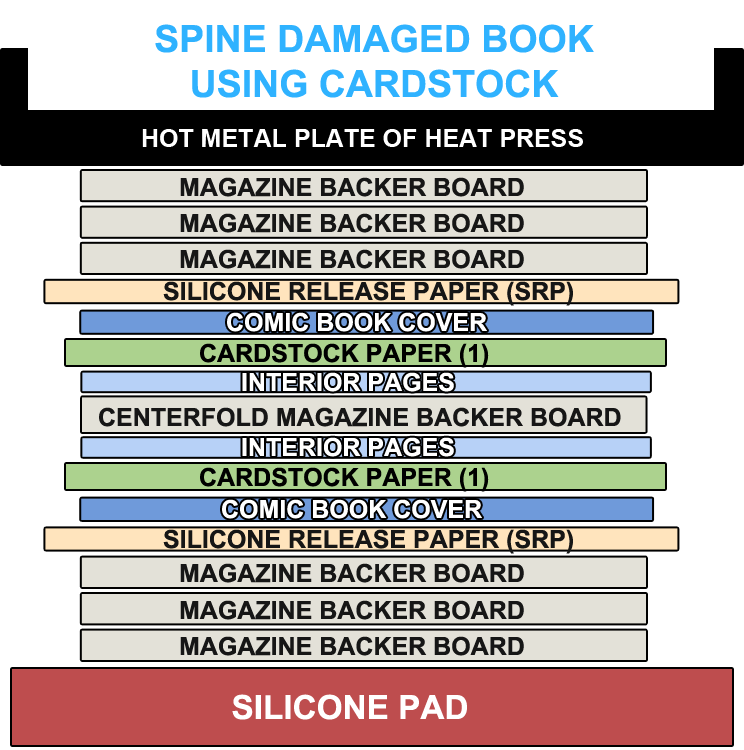 Be sure to use magazine backer boards as a buffer between your book and the press machine. Silicone Release Paper (SRP) on your books and documents inside press. “Pebbling” can cause divots on the surface of a book if the press plate or pressure pad isn’t clean. Make sure the silicone mat and pressure plate are clean and free of debris. 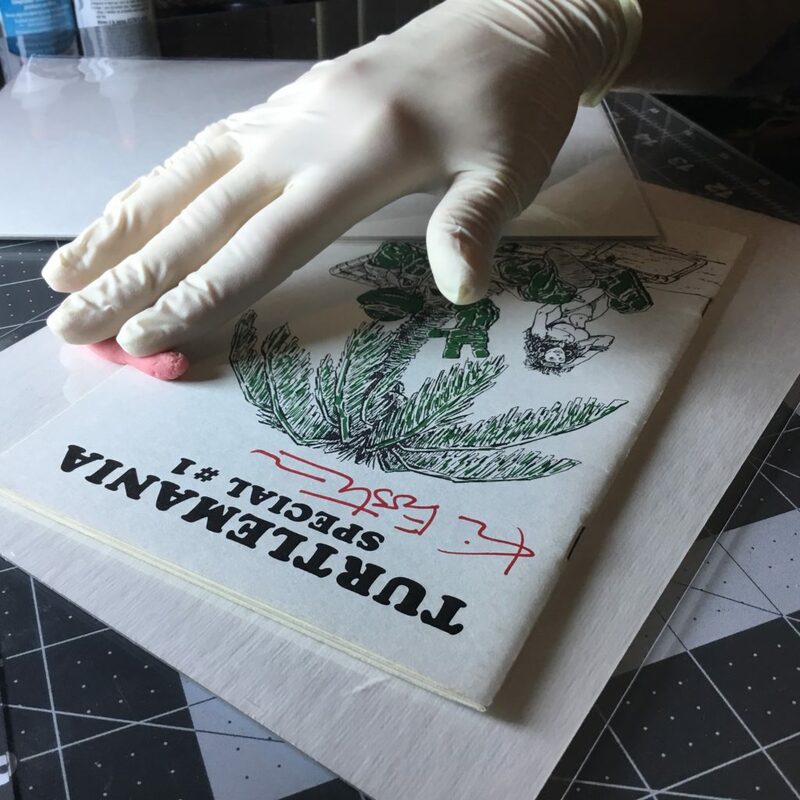 Make sure the pressure plate and silicone release paper being used against the book is clean and free of dirt. “Pebbling” can cause divots on the surface of a book if not the press plate or pressure pad isn’t clean. This is caused by anything from a speck of dust, dirt, or cleaning shavings from using Absorene or Magic Eraser. You must have a completely flat surface larger than the book being pressed. You want to make a comic book sandwich. The magazine board at the centerfold should be pressed up snugly against the staples but not underneath the staple prongs. 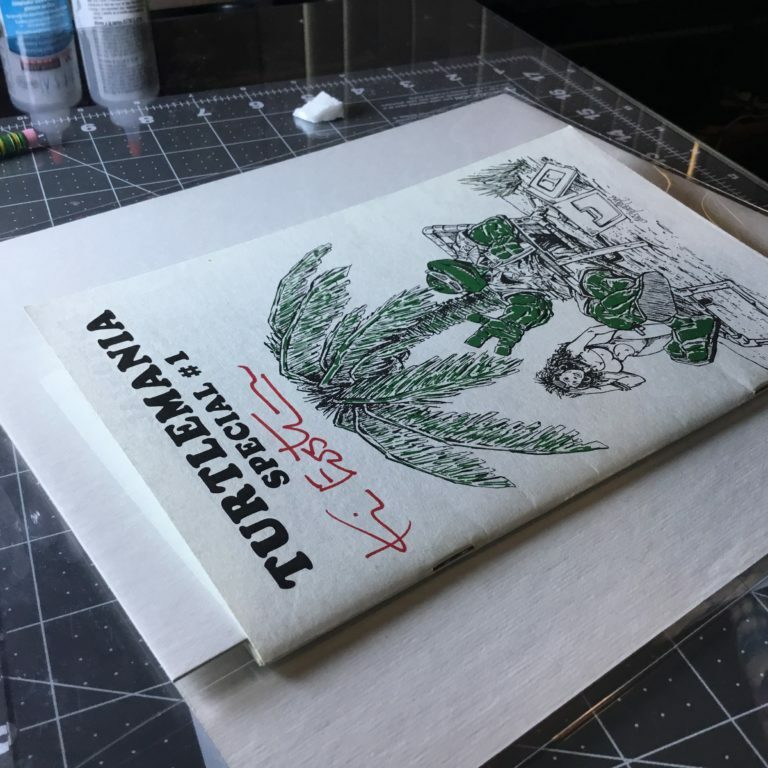 The cardstock paper, copy paper, or backer boards placed inside interior pages should be pushed up snug and even against the spine as close as possible without movement. The copy paper or SRP paper placed underneath covers should be pressed up completely flush against the spine. If you are not careful with the placement of interior pages or use too much pressure, you will cause vertical lines to travel down length of spine vertically. It is important you do not use too much pressure and you have your copy paper sheets pressed firmly up against the spine. 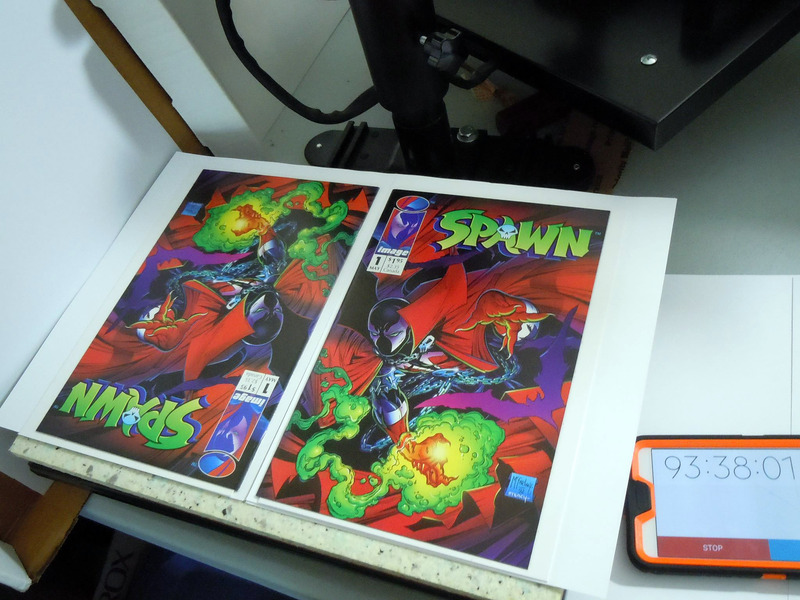 Use digital calipers or a ruler and measure the total thickness of comic book and board stacks. This will help you determine the gap thickness required by using the pressure adjustment knob at the top rear of your press machine. If a front or back cover is more severe I would place aforementioned side up towards to press machine's heat plate. These are recommended press techniques which are dependent on year produced. 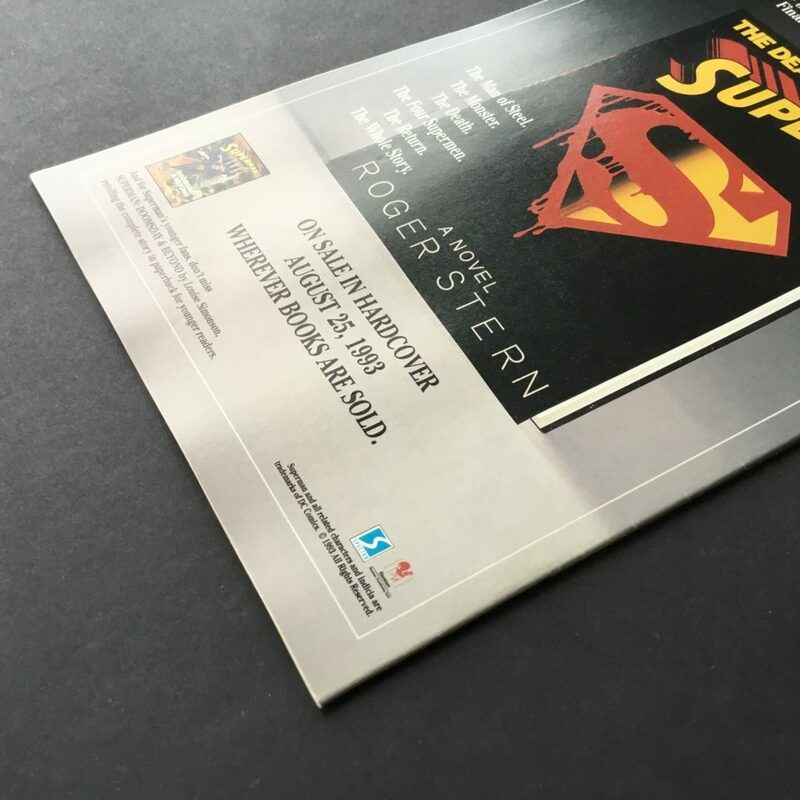 DC Comics code inserts are very thick and require a different approach. 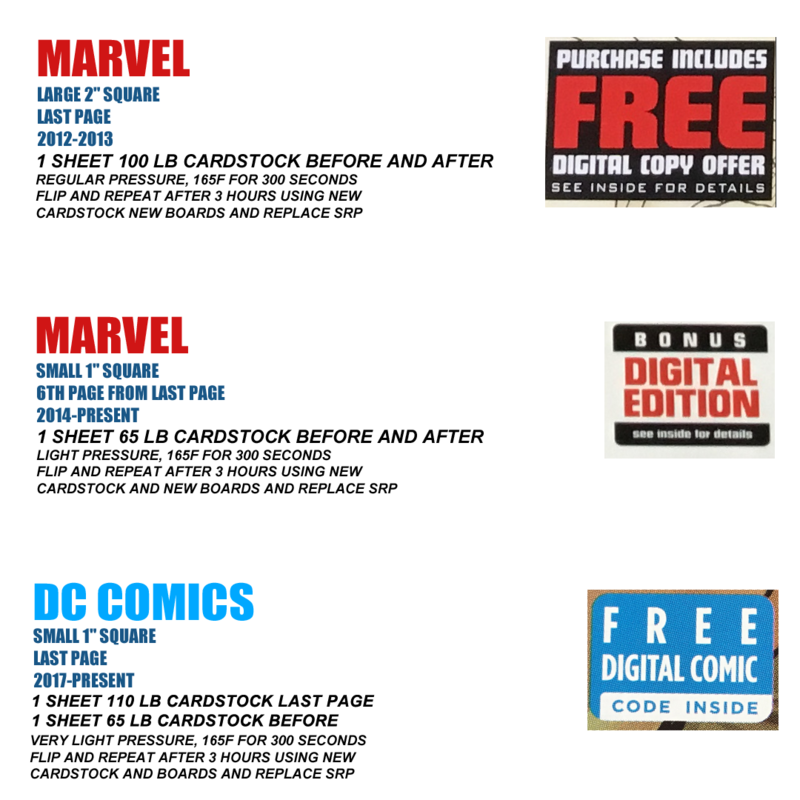 With DC Comics blue digital code insert stickers, use very light pressure and a combination of using 2 sheets of 65 lb cardstock after code page and 1 sheet of 110lb cardstock before the digital code page to prevent imprints. You will use a metric ton of backer boards and SRP paper. To save money, buy in bulk. 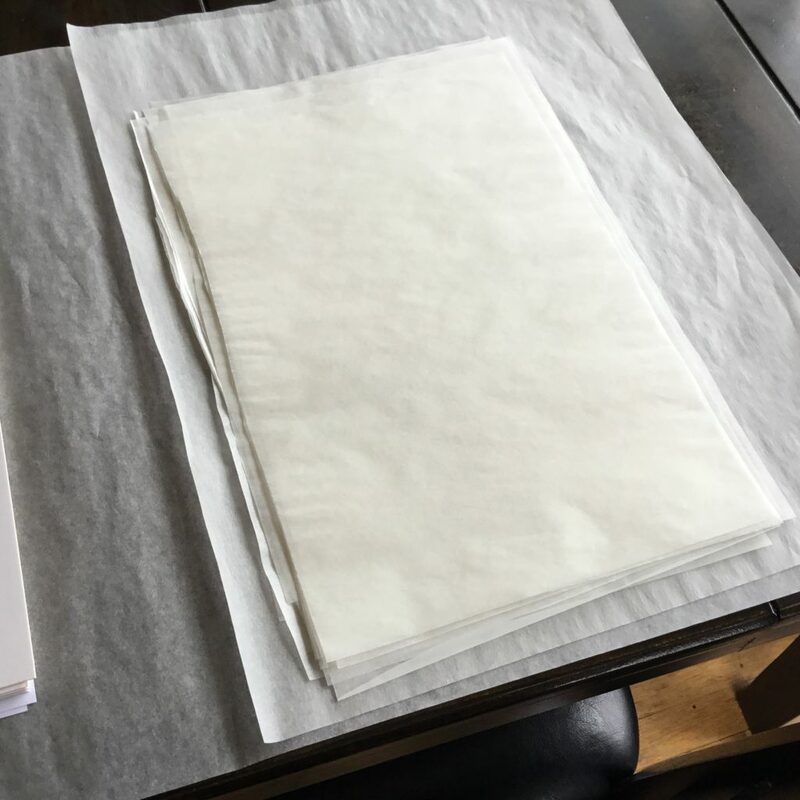 ULINE has 16"x24" sheets of Silicone Parchment Paper that is coated on both sides. It's cheap, disposable, and you never have to reuse sheets. This prevents wrinkles, divots, and cockling while pressing books like a professional. This is a big heavy box of 1000 sheets. That's really 4000 sheets for you at $87 shipped same day to your door. That's 2 cents per sheet. You can afford to throw those away after 1 use. To start, grab a stack of 5 sheets. Try to not crease any sheets or wrinkle them sliding them out of the topside of box. Fold the stack in half on a flat surface such as a black foam board. Fold the stack in half again. Open your stack to find 4 even equal lines to cut along with your scissors. Fold once in half and pinch opposite end with your offhand so the pages stay in the crease trench. Cut along trench. Now you have 2 less thicker halves to cut along. Fold your sheets in quarters and cut along the folds. In moments you have worry-free, equal cut, 20 sheets of srp paper for today or tommorow's next job. More disposable materials means a sterile environment free of divots and pebbling. Halfway down this guide, you are now ready to press a comic book. Here is where it is finally discussed in great detail how pressing a comic book works. Please read through all steps carefully before you begin. Always test this method out first on cheap dollar bin comic books until you are comfortable and ready to move onto more valuable books. 1. Get magazine backer boards ready. Warm up press machine to desired temperature and wait until it is HOT and ready. Make sure backer boards are flat side out, glossy side inwards away from book or plate. 2. 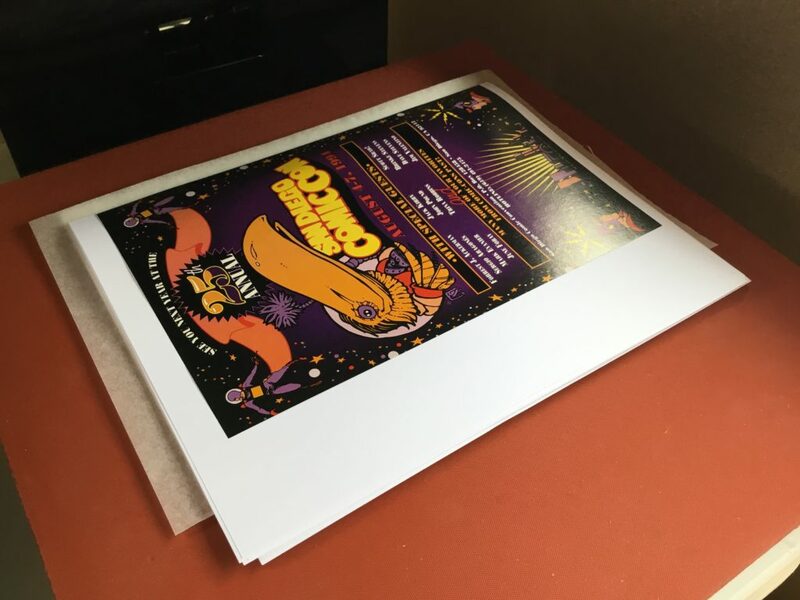 100 lb cardstock paper, or the above pictured Super Bright 165 whiteness Inkjet copy paper is used as a buffer for digital codes, tattooz inserts, or other inserts inside a comic book. Do not use Laserjet copy paper. Laserjet copypaper can lift ink from glossy covers and glossy interior pages. Remember, cardstock paper works best for stubborn spine dents and Marvel digital code inserts. Some books will require copy paper vs cardstock paper, due to the cardstock paper being too thick. Thinner 65lb cardstock paper or copypaper can get closer to the spine. Covers can split or come apart from the spine if you use the wrong method - so carefully study the spine and thickness when determining what to use. 3. Clean and prepare the 15x15" Clamp Style heat press machine surface. 4. Get 3 magazine backer boards. Stack them on heat press machine. Glossy side down away from plate. Make sure backer boards are flat side out, glossy side inwards away from book or plate. 5. Get 3 magazine backer boards. Stack them on heat press machine. 6. Set a sheet of cut SRP (Silicone release paper) on your stack of 3 backer boards. 7. You can buy large 16×24 inch sheets of SRP paper from ULINE and cut them into 4 smaller sheets. 9. Place a backer board at centerfold. Place the board up against the staples. Do not place the backer board under the staple prongs. The backer board is acting as the same height of the staples, so as to not imprint staples into the interior pages of the book. If you place it underneath the staple prongs, you will have indents from both staples on the opposite side of staple. Trust me. If you have spine ticks, place 2 sheets of copy paper under front cover and back cover. Depending on how deep the spine ticks are, you may need to place copy paper at page 2 and page 3 of front and back of covers. Make certain your copy paper and boards are snug up against the spine as close as possible. 9b. If you have a digital code in your book, see recipe above for the stacking of paper and boards. If the book is thin with fewer pages, you can use a magazine backer board or sheets of copy paper on the following page of digital code insert. Thicker books require cardstock paper or backer boards. Do not reuse your copy paper or cardstock paper. It is now scrap paper after 1 use. 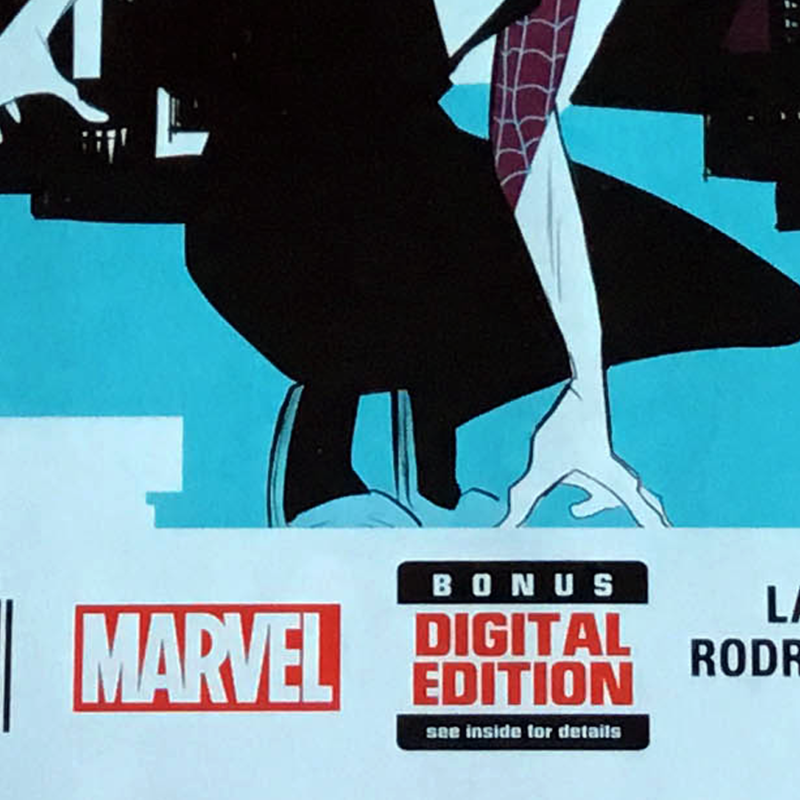 Avenging Spider-man #9 has a large 2" digital code insert on last page. Use 3 sheets of copy paper as a buffer for the back cover. Use 2 sheets of paper as a buffer on the page before the last page. You will press using light pressure. 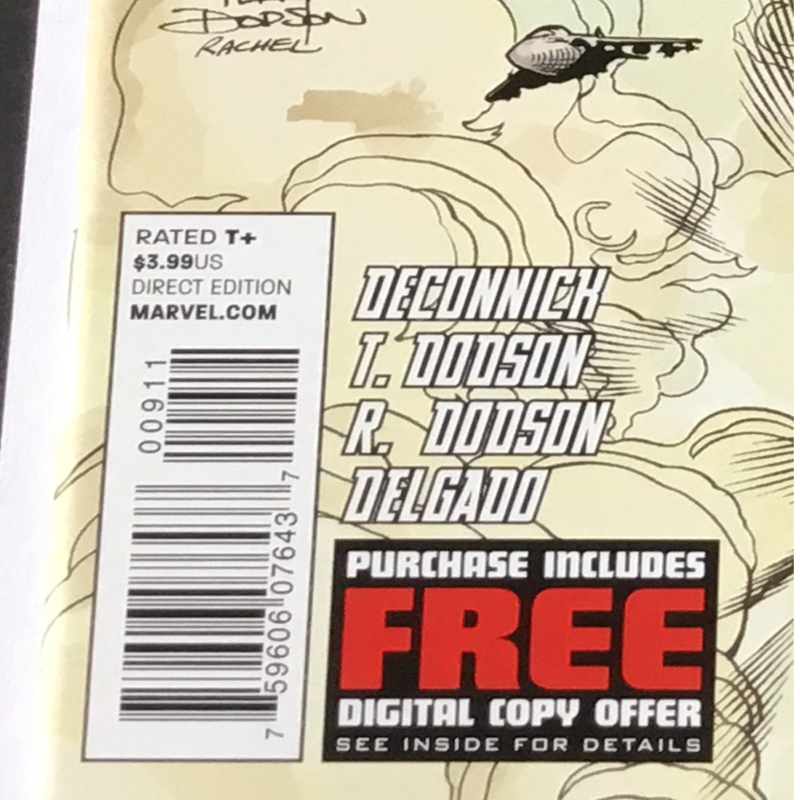 Older digital code inserts in Marvel Modern Age books were on the last page, and very large, up to 2" in size. 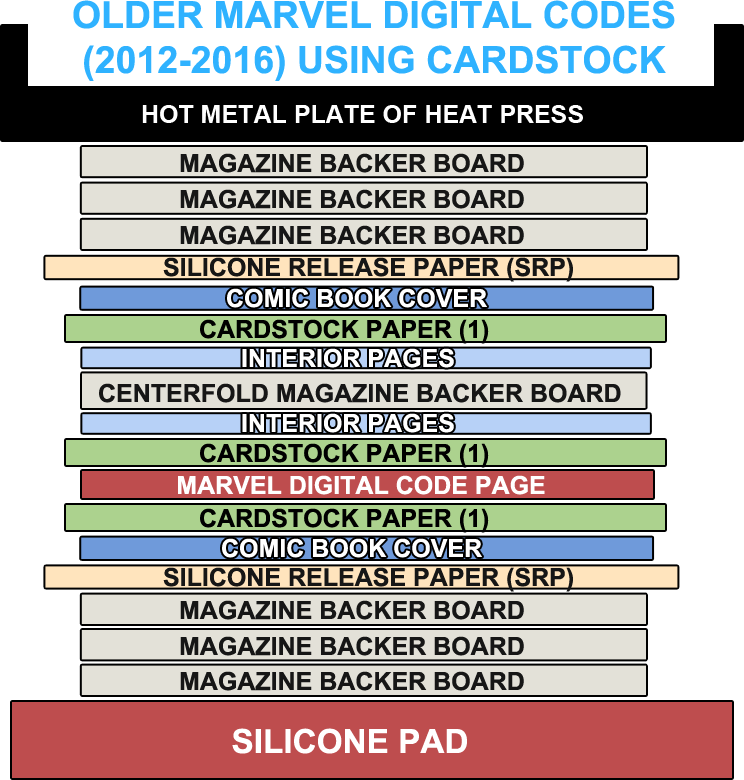 The Modern Age Marvel books now from 2017-Present are 1" square inserts found usually on the 4th or 5th to the last page of book. New DC Comics from 2018-Present feature a blue 1" digital code insert on last page. These are very thick and require 110 lb cardstock. This can easily imprint onto the back cover and surrounding pages. 10. 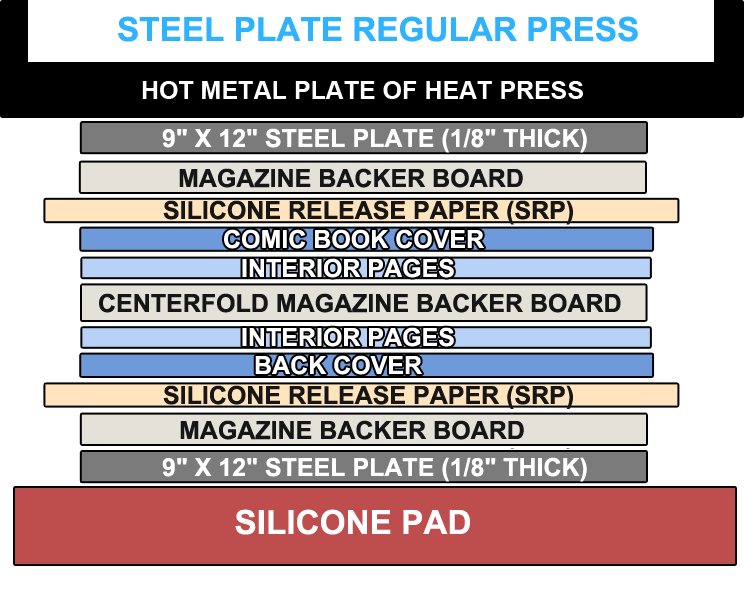 Set a sheet of cut SRP (Silicone release paper) on your stack of 3 backer boards and comic book being pressed. 11. Get 3 magazine backer boards. Stack them on your stack of boards, comic, and srp paper that is set on heat press machine surface. 12. Place 3 magazine backer boards evenly. 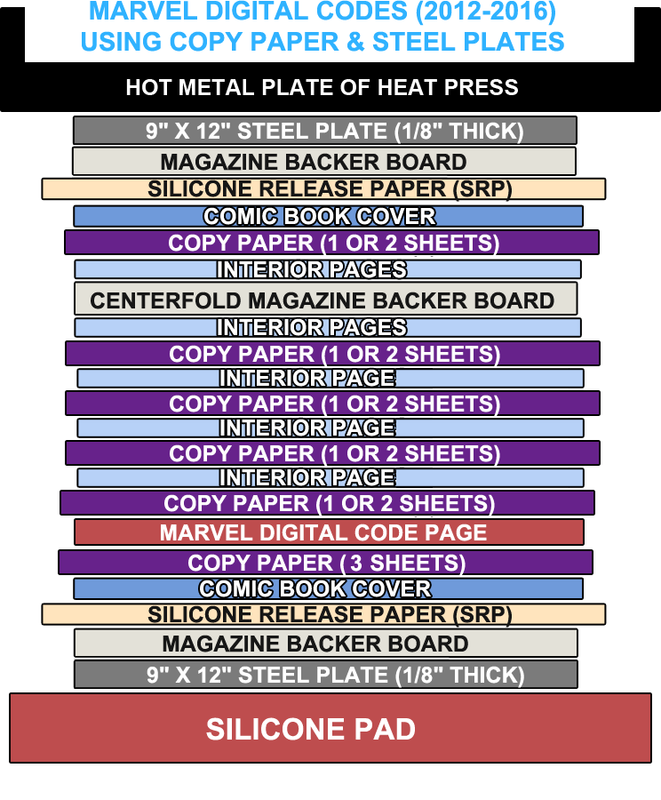 Stack them on your stack of boards, comic, and srp paper that is set on heat press machine surface. 13. Make sure book is inside all outside edges of top and bottom stacks of backer boards. If your book is outside the outer layer of boards, you will imprint vertical lines down your covers. 14. Use the pressure adjustment screw. Turn it clockwise to increase pressure. Counter-clockwise decreases pressure. The idea is to turn the knob to increase firm pressure at first before clamping down on book. When you are ready for the initial clamp of press, turn the knob counter clockwise and back it off slowly as you clamp down press. There should be firm but slight little resistance. Do not press too hard. The adjustment screw will help you with this. Think of it as driving a stickshift vehicle and you are learning the clutch and gas pedal. Using too much pressure will damage your book. This will pop staples, cause vertical lines or seams to travel down the length of the spine, or worse. Make certain to use firm but light pressure. 15. Press book with clamp down for 10 minutes and lift up clamp slowly. Sometimes the backer boards will stick to plate. 16. Flip book over so the opposite cover side is facing the hot plate of press. Replace the backer boards if you see staple indentations. 17. Repeat steps 1-15. After the second 10 minutes is up, you will simply shut OFF the heat press machine. Leave book inside press "as is" for 24-48 hours before removing. 18. After 24-48 hours is up, carefully and slowly lift clamp on press. Remove stack of boards and your book carefully and set on a flat, clean, level surface. Use a large golden age or magazine sized back and board to slide under your book inside the press to slide it out safely. This works if you are tight on space or have another press next to it. Slide bag/board under bottom srp paper carefully and slowly. Slide bag/board under bottom srp paper very carefully and very slowly. Now you can carefully lift the stack by the flap and place your fingers underneath both sides of bag/board supporting the weight and flatness of the book. You can now safely walk the book over to another table for photographing or evaluation prior to bag and board. You can now safely slide out the bottom supporting bag and board to carefully disassemble your press stack. 19. Remove boards and SRP paper by slowly sliding each one out one at a time in the process. You may need to gently grip the spine to you can slide each sheet out one at a time. If one side doesn't slide out by pulling from the bottom, try pulling from the top. 20. Photograph your results, or place inside a bag and board. You are done. The thickness of spines can vary, but most are 0.03" - 0.05" inches thick. 1. The idea here is to use a spacer the same height as spine so it doesn't get crushed by accident. Use a ruler or digital calipers. Measure the thickness of book being pressed. Take note if any staples are popping through front cover or back cover. You may need to use a flathead screwdriver or putty knife to gently push staple prongs down flat. 2. Place 1 sheet of SRP paper on top and bottom of book. Place 1 magazine backer board on top and bottom of book. 3. Slide and postion stack of boards right up against the side of spine of book. Your stack should be positioned side-by-side of book in question. 4. No centerfold backer board in this book. 5. Set clamp down carefully and slowly on press, using adjustment knob as necessary to decrease pressure. 6. Press at a temperature of 125F for 30 minutes, using similar above steps on "HOW TO PRESS A BOOK"
6b. If you have spine denting or stacking curl, it helps to place a sheet of silicon release paper or inkjet copy paper in between the first and last 4 interior pages of book to push out spine dents. Once you have mastered the above techniques, it's time to go the next level. I have tested this method to very successful results. These plates are metal, steel, cold, and heavy weighing in at 5lbs each. Preparation: To start you will need 2 (TWO) steel plates 1/8" thick at least 9x12. You can opt for a 15x15 but these are super heavy plates. Put on some gloves we're about to get dirty. You are going to see fine black steel shavings in powder form everywhere. The plates come oiled from the machining process so you will need to wipe them down, but only after sanding. The machining lubricant oil will cause fingerprints over time on books, even if wearing gloves. Wipe those plates down! Sand one side because both sides are redundant. Chose the best side that was machined the best with less scratches and pits. Sand first by purchasing some 3M sanding blocks or use cheap wood and sandpaper. I recommend going 60grit to 220grit. We are still using backer boards as a buffer between plates and srp/comic. Once the plates are sanded on one side, disregard the other side its pointless - so write on there, "OTHER SIDE" so you are never tripped up. After the plates have been sanded down starting with 60 to 220 (higher the number, the finer the sandpaper is for surfacing), you will grab some clorox wipes or similar product and begin wiping BOTH sides down completely over and over again until the wipes are dry. Next, grab paper towels and dry both sides of both plates very well to prevent rusting and pitting. You are now ready to use oil-free sanded steel plates for your t-shirt or laminating dry mount press machines. The metal plates are 9" x 12", which is smaller than the 15" x 15" surface area of my press machines. This is fine, because the plates are still larger than the books being pressed. The 9" x 12" metal steel plates are 1/8" thick each. Total thickness of both plates is 2/8", or 1/4" of an inch, 3 backer boards, and you must include the thickness of your comic book. You must factor the 1/4" metal plates , backer boards, and the thickness of your book, that makes a 1/3" total average gap in your press. Because they are metal plates and not silicone, there is no give or flexibility, so it's always good to back the pressure adjustment knob back too much, than not enough. Plates + 3 backer boards + comic book = 1/3" gap total in most cases. Different thicknesses of books will always rule the total gap needed for pressing with metal plates. Set the plates down on top of the included 15x15 red silicone mat that is already with the clamshell 15" x 15" press machines. The plates are 9" x 12", so they are smaller than the 15" x 15" surface area, but still larger than a comic book. 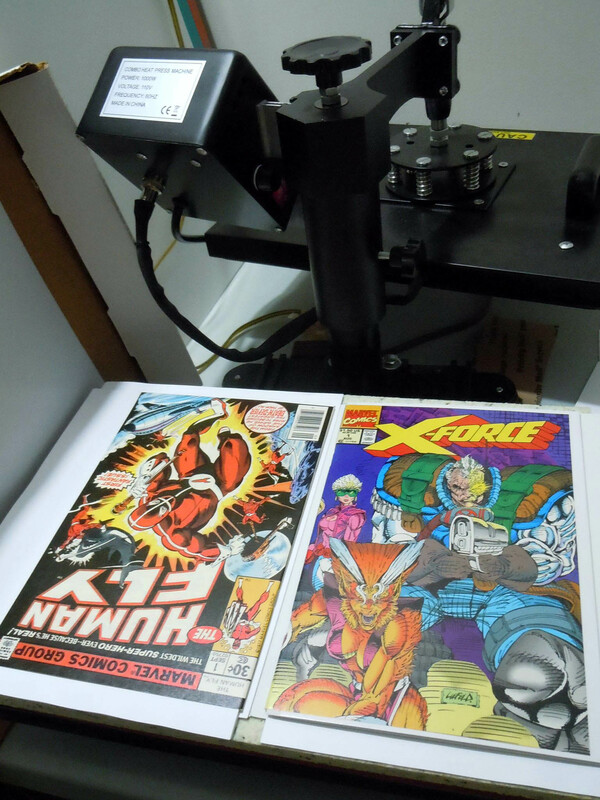 Use your digital calipers or a ruler to measure the thickness of comic book and steel plates. Use pressure adjustment knob and make sure your gap matches total thickness of plates and book. If you do not, you risk popping staples or causing damage to the book being pressed. If a front or back cover is more severe I would place aforementioned side up towards to press machine's heat plate. 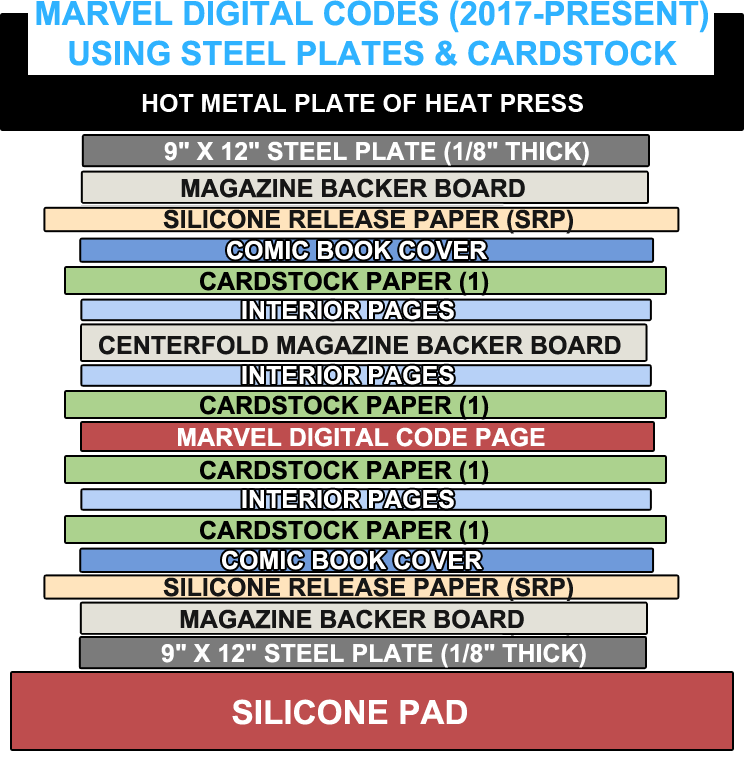 You will still want to place a backer board on steel plate, then SRP Paper, then comic book, SRP Paper, backer board, then top steel plate. Why? 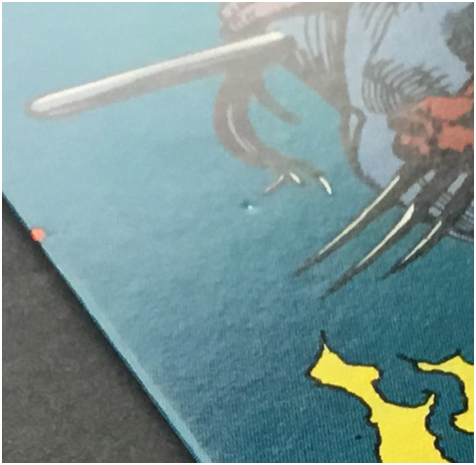 Dust particles, debris, and other elements could get on the plates and transfer to your book cover surfaces. You will drive yourself crazy over pebbling and wiping the plates clean every time. Steel also rusts so you need a protective barrier from your book and the steel plates. Any moisture can and will seep through the SRP paper. Aluminum plates do not rust so that's a positive when pressing damp books. Aluminum doesn't retain heat as long so the bottom plate will not get hot as fast for very long. Aluminum is lighter yet also warps because it's more pliable and flexible. Both can be used in this application and both have their own merits and faults. Use whatever works best for you and your budget. When pressing older books with steel plates you do not have to flip if you press for 150F for 10 minutes or slightly longer. That duration is long enough to heat both plates, including the bottom one. When pressing brand new current modern age glossy books you can press at a much higher temperature such as 164F or even 167F but for only 280-300 seconds, then shut off press and come back 2 hours. Then, after 2 hours, you can flip the book, using same boards but replace the srp. Flip book, repeat at 164-167F for 280-300 seconds, then shut off press and come back 3 hours later. You can remove book and work on the next one this way for modern age books. The reason for doing it this way is to press modern age books faster, reliably, and efficiently. 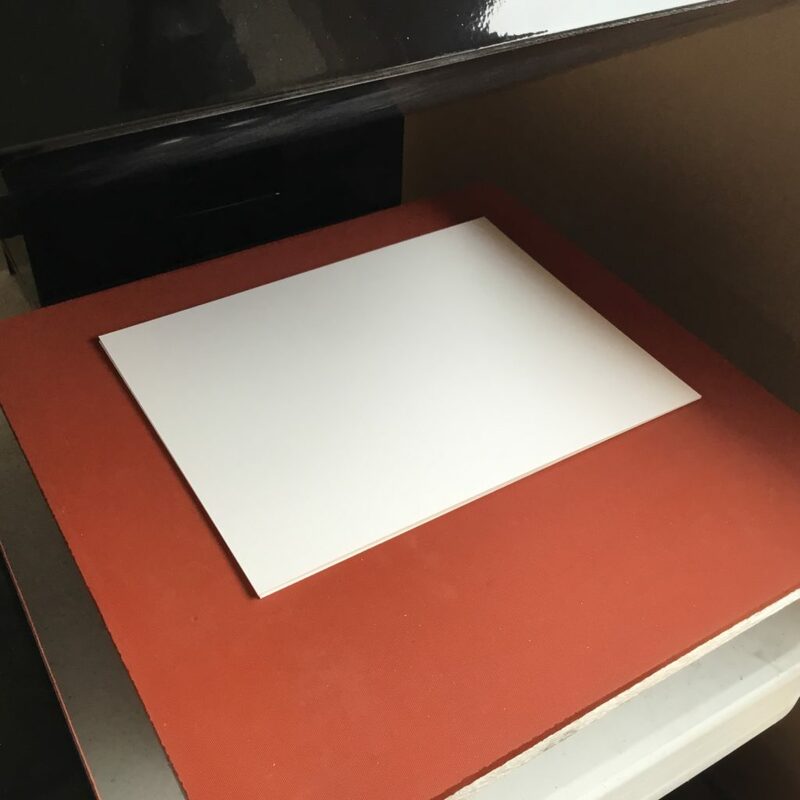 The short duration of heat on one side isn't enough to heat bottom plate when only 280 seconds is used for modern books that we are quickpressing. This is discussed in further detail below. Finally, the reason I don't just tell everyone to go out and buy plates is because it's not that simple when you first learn pressing. You must have a great understanding and grasp of all other aspects to pressing books (such as a sterile environment, handling of books, dry cleaning, pressure sensitivity with the locked position, what to look for, screening, etc) before you can dive into using steel plates. 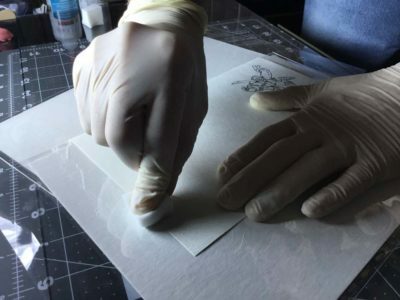 Because of this - this is why its recommended to use 7 backer boards otherwise without plates because you need that tough "rigid as possible" surface area for pressing yet you need to make sure you can feel the pressure on the lock of the machine as you learn what's going on. You'll want to use copy paper still for thin books or thin paperstock covers. An alternative to steel plates is aluminum plates, which will not rust. However, aluminum is more flexible, lighter, and will not retain heat as long as steel. 1. 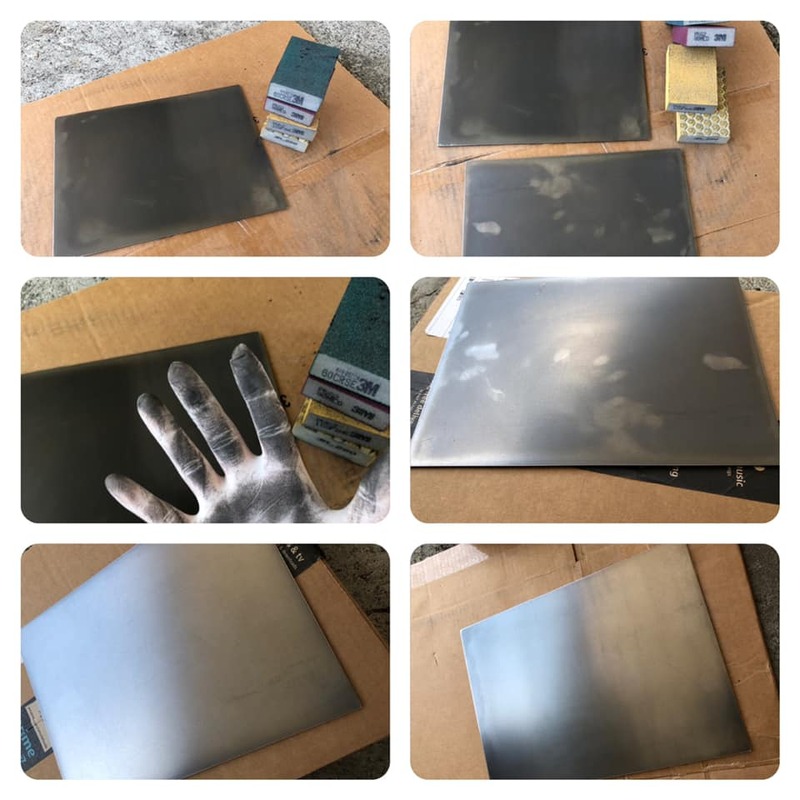 To prep, once you have ordered your 2 steel plates you will need to use gloves and sandpaper to completely smooth over the surfaces of the plates to remove burrs and scratches or other imperfections in the steel. I used 120 grit and 180 grit sandpaper with a block of wood. If there are deep scratches or burrs close your eyes and glide your fingertips across the surface. If you can feel the indents and scratches, you will need to use the other side of plate, or replace it entirely. Leave the press machine OFF and COLD during this procedure. Look at the thickness of 2 steel plates on top of one another. Now use the adjustment knob of your press machine and counter clockwise turn that knob until there is a gap when the press is closed. Make sure this gap is bigger than the thickness of your comic book, and the 2 steel plates. This is crucial. 2. Set 1 steel plate measuring at least 9" x 12" or larger on your clean silicone mat of press. I still use the mat as a tiny bit of cusion when clamping press down. Keep your plate sideways so the book spine is in the inside of press where the most pressure is at clamp of press. 3. 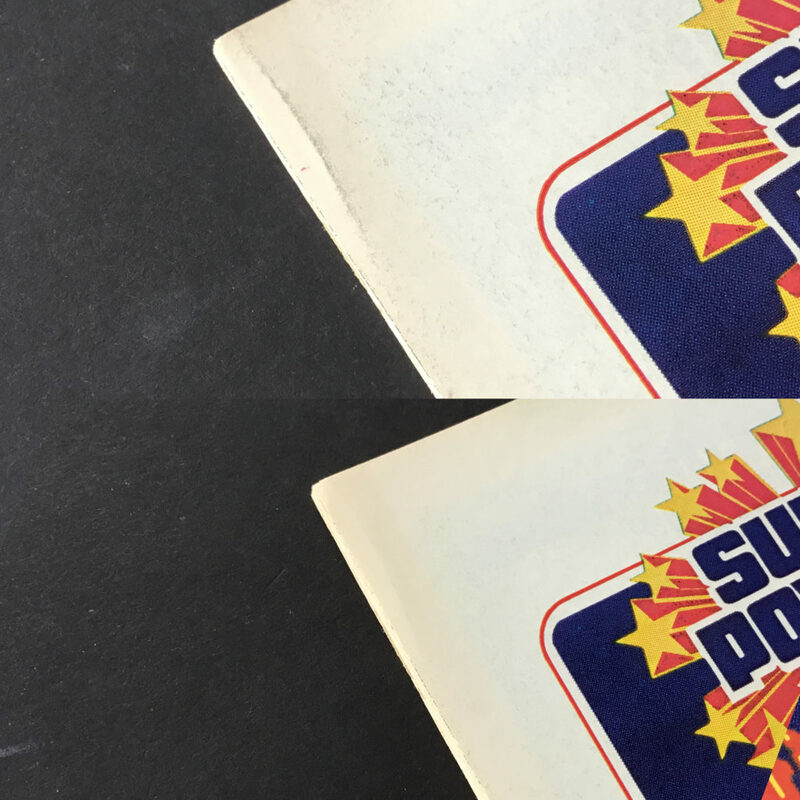 65 lb cardstock paper, or the above pictured Super Bright 165 whiteness Inkjet copy paper is used as a buffer for digital codes, tattooz inserts, or other inserts inside a comic book. Do not use Laserjet copy paper. Laserjet copypaper can lift ink from glossy covers and glossy interior pages. Remember, cardstock paper works best for stubborn spine dents and Marvel digital code inserts. Some books will require copy paper vs cardstock paper, due to the cardstock paper being too thick. Thinner 65 lb cardstock paper or copypaper can get closer to the spine. Covers can split or come apart from the spine if you use the wrong method - so carefully study the spine and thickness when determining what to use. 4. Set a magazine backer board down on bottom steel plate. This acts as a buffer from dust, dirt, debris, rust, and moisture from your book. Make sure backer boards are flat side in, glossy side outwards away from book. Set a bottom sheet of cut SRP (Silicone release paper) on your bottom metal steel plate. 5. You can buy large 16×24 inch sheets of SRP paper from ULINE and cut them into 4 smaller sheets. Set your book sandwich on SRP paper resting on backer board and bottom steel plate. 6. Do not reuse copy paper, backer board, or SRP paper using this technique. It is scrap after 1 use. 7. Place a backer board at centerfold. Place the board up against the staples. Do not place the backer board under the staple prongs. The backer board is acting as the same height of the staples, so as to not imprint staples into the interior pages of the book. If you place it underneath the staple prongs, you will have indents from both staples on the opposite side of staple. Trust me. If you have spine ticks, place 2 sheets of copy paper under front cover and back cover. Depending on how deep the spine ticks are, you may need to place copy paper at page 2 and page 3 of front and back of covers. Make certain your copy paper and boards are snug up against the spine as close as possible. Set your book "sandwich" carefully placed in the middle on bottom SRP paper and bottom steel plate. 7b. If you have a digital code in your book, see recipe above for the stacking of paper and boards. If the book is thin with fewer pages, you can use a magazine backer board or sheets of copy paper on the following page of digital code insert. Thicker books require cardstock paper or copy paper. Do not reuse your cardstock or copy paper. It is now scrap paper after 1 use. FYI 65lb cardstock paper works best instead of copy paper. Place a top sheet of SRP Paper on your book sandwich. 8. 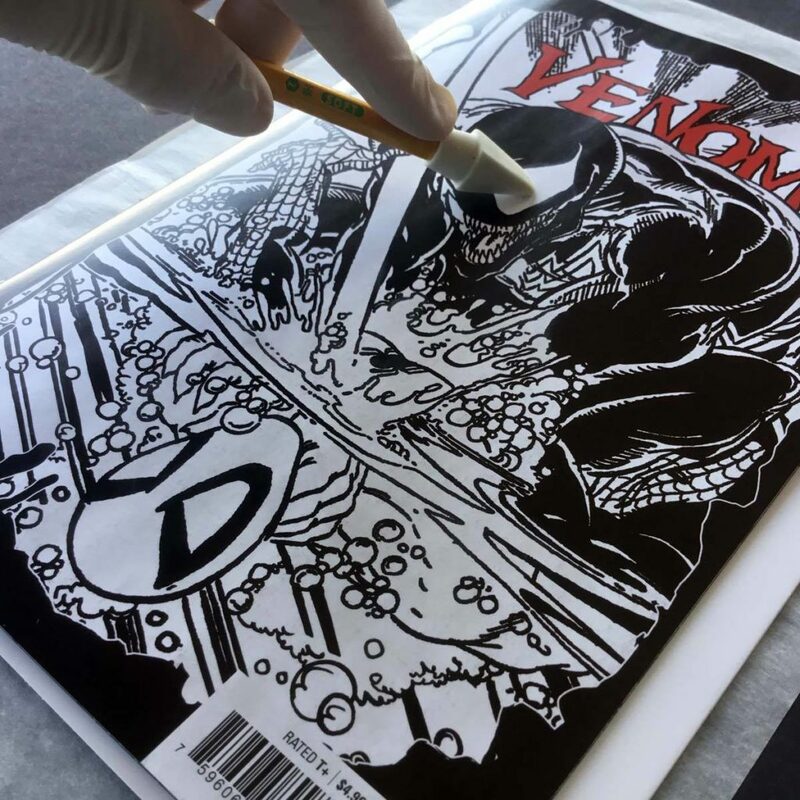 Set a top sheet of cut SRP (Silicone release paper) on your comic book. 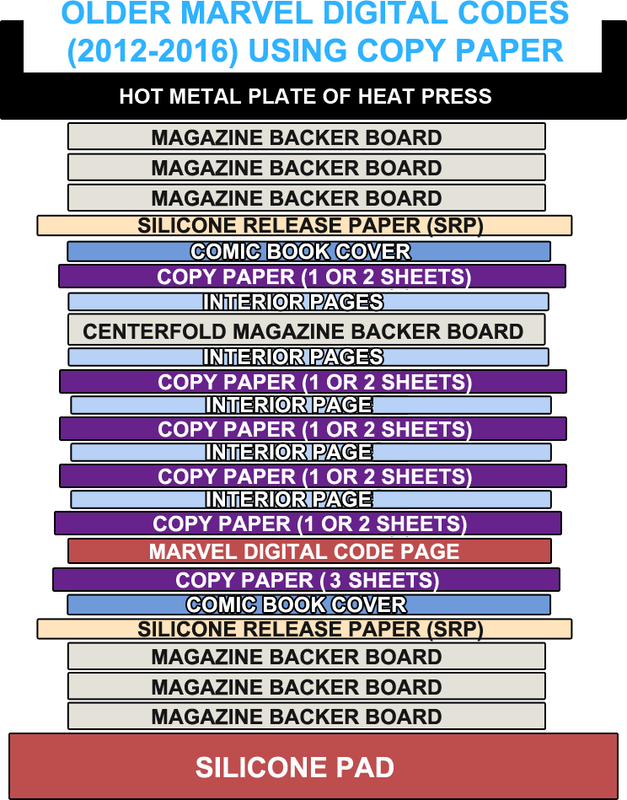 Set another top magazine backer board on top of top SRP Paper and comic book being pressed. This acts as a buffer from dust, dirt, debris, rust, and moisture from your book. 9. 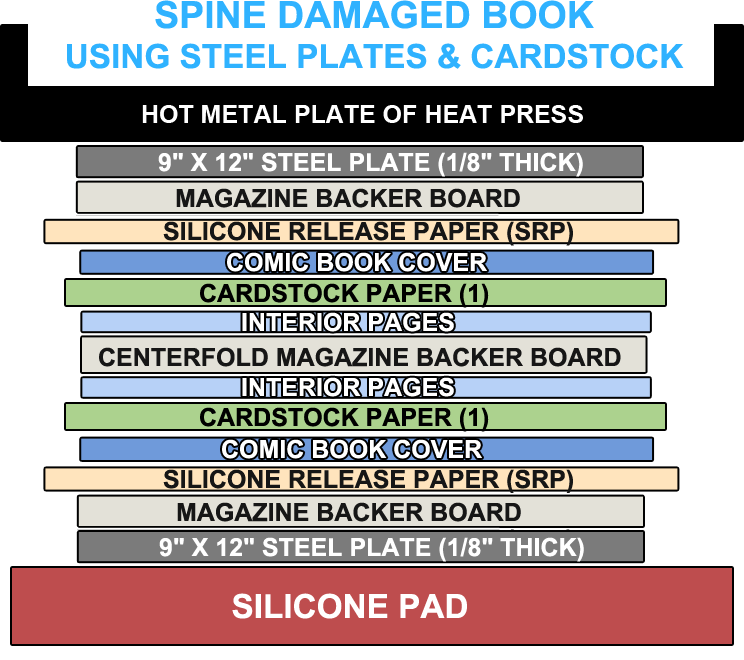 Set your top steel plate carefully and calmly on your stack of boards, comic, and srp paper that is set on heat press machine surface. Make certain the book is inside all outside edges of top and bottom stacks of backer boards. If your book is outside the outer layer of boards, you will imprint vertical lines down your covers. 10. Remember that crucial "gap" I mentioned above in step 1? Make sure your gap is as large as the thickness of both plates, backer boards, and your book being pressed. Most steel plate book sandwiches will be around 0.35-0.40 inches thick. 11. You want the press to clamp down very lightly on the plates. Gently and meaningful but not forced or aggressive. Make sure the press machine is OFF. 12. Use the pressure adjustment screw. Turn it clockwise to increase pressure. Counter-clockwise decreases pressure. The idea is to turn the knob to increase firm pressure at first before clamping down on book. When you are ready for the initial clamp of press, turn the knob counter clockwise and back it off slowly as you clamp down press. There should be firm but slight little resistance. Do not press too hard. The adjustment screw will help you with this. Think of it as driving a stickshift vehicle and you are learning the clutch and gas pedal. Using too much pressure will damage your book. This will pop staples, cause vertical lines or seams to travel down the length of the spine, or worse. Make certain to use firm but light pressure. 13. Turn the press ON. Let the plate temperature heat up to match the book at the same time. 14. Once the press machine has reached desired temperature and time duration, you do not need to flip the book or remove anything. The metal plates are now 150-160 degrees, so you can't handle the plate temperature anyway. Since steel is a great conductor for heat, both surfaces of the book are flashed with instant heat from both sides. If you are pressing damp books from the humidity chamber, look further down this guide for separate procedure. Remove top magazine backer board. 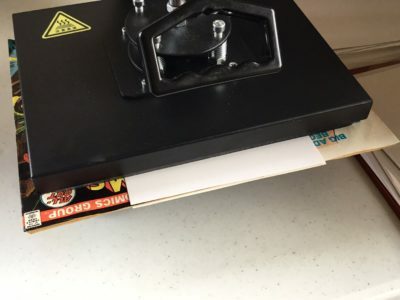 Use a large golden age or magazine sized back and board to slide under your book sandwich inside the press to slide it out safely. This works if you are tight on space or have another press next to it. Slide bag/board under bottom srp paper or backer board carefully and slowly. 15. After 24-48 hours is up, carefully and slowly lift clamp on press. Remove top plate very slowly and carefully. Try to lift the plate straight up and not at an angle. Set your book sandwich stack down carefully and on a flat, clean, level surface. 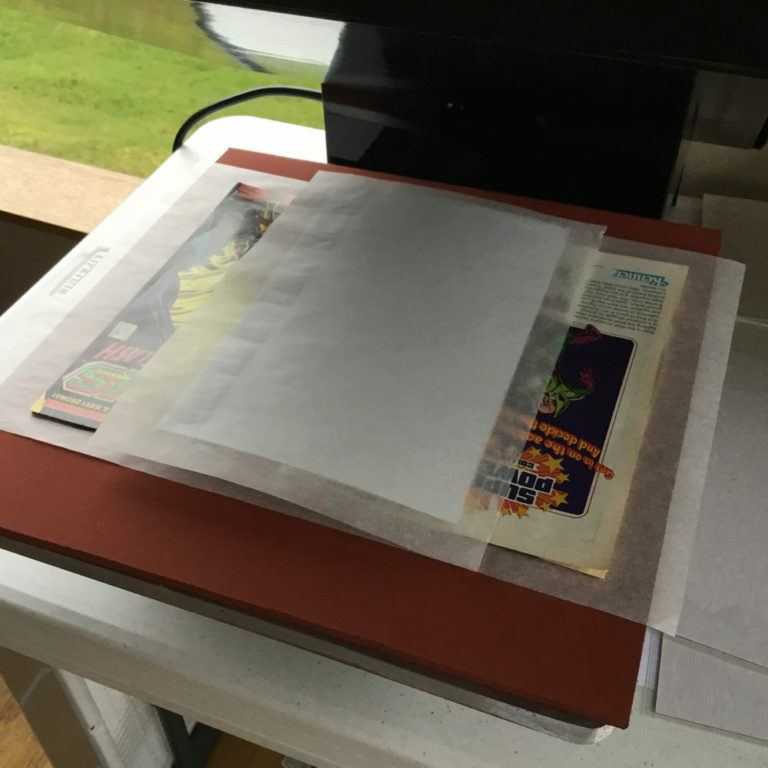 I would not reuse copy paper, backing boards, or SRP paper using this method. 16. Remove boards and SRP paper by slowly sliding each one out one at a time in the process. Latex gloves help grip the book from the spine as you slide each sheet away from book. 27. Photograph your results, or place inside a bag and board. You are done. If you are pressing a squarebound giant sized book, the steps are the same. Only deviation from this is for prestige format books with no staples, make a stack of backer boards the same height as book before setting top metal steel plate on top of book with stack of backer boards pressed up against alongside spine. After 3 weeks at CGC, this book has been graded a 9.6 Near Mint condition comic book. After 3 weeks at CGC, this book has been graded a 9.8 Near Mint condition comic book. WHAT IS A "COLD PRESS"? A "cold press" is just that, a "cold press machine". 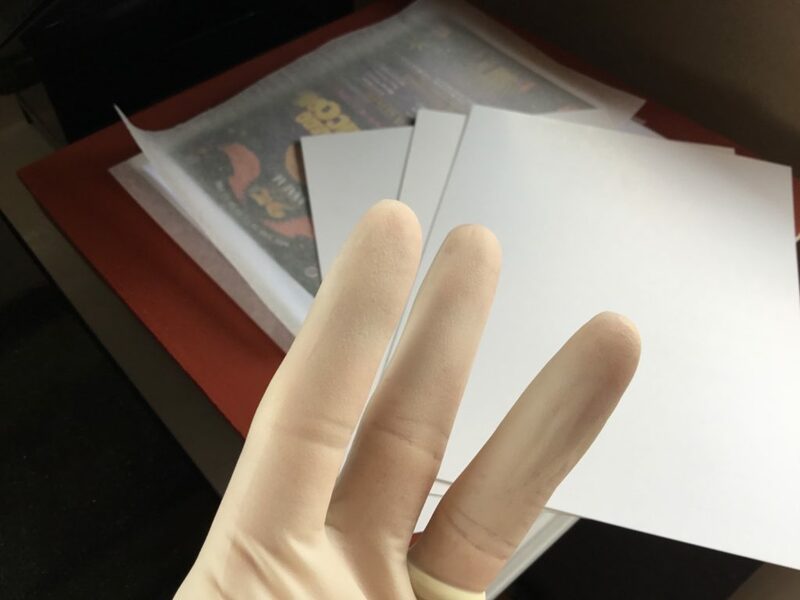 Simply shutting off the press machine when the timer beeps (or your phone alarm) and leaving the comic book inside the press machine, left alone and un-touched for a minimum of 12 hours. The recommended time for leaving a comic book in the coldpress is at 24 hours for maximum benefit. This prevents any sort of reversion or flaring that could take place. What if you have a 15" x 15" press machine? 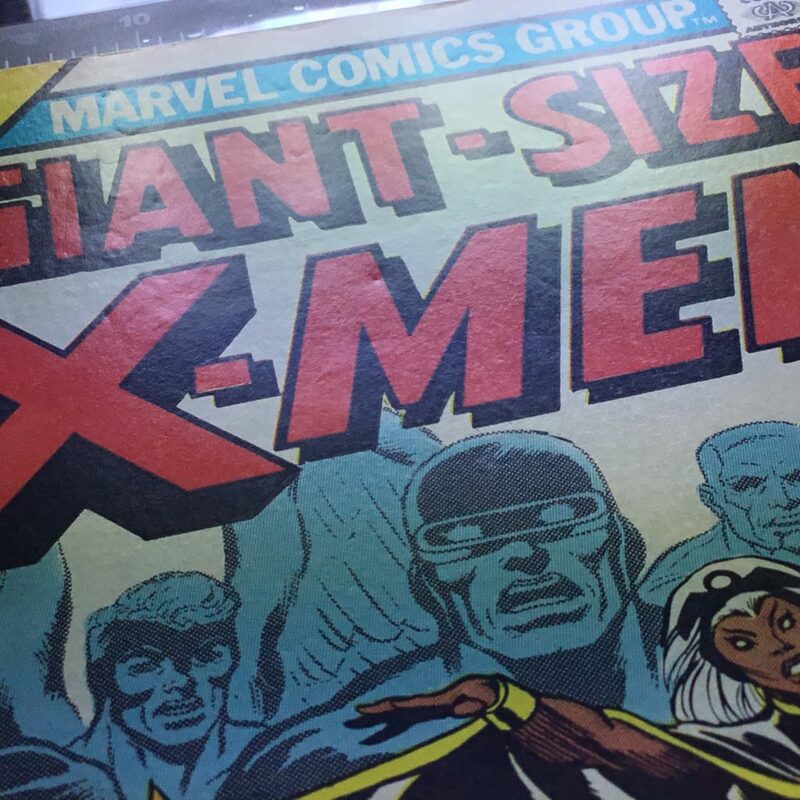 Comic books are only 7" x 11" in size for most common books. A simple light press for two books at once sounds like a great idea. It's easy to want to double down on your workload with one machine, right? 7" x 11" x 2 = 14" x 11" so 2 would fit. Do not press two comic books at once inside one press machine. Do not set 2 books in one press machine. Respectfully to all of you reading this guide, this is not advised. You are not ever going to get the same results this way, and you could damage one of the spines or both. Purchase another press machine if you want to press 2 books per day/session. T-Shirt Press Machines put more pressure at the back of the platen on the clamshell press machine. The swivel unit press machines press evenly from the middle outward using the spring setup but it's dangerous to use this method due to uneven pressure at the direct center of platen pushing downwards from the middle of spine outward. What this means is you'll still have uneven pressure at the top and bottom of spines on both books. It might seem like a good idea if you are just doing a light press to smooth the bumps and waves out... but it's not. I repeat, do not set 2 books in one press machine... even if identical. Comic books are mass produced on large heavy bulky industrial machines. There are variable tolerances to the production and range of "runs", when they have to change out paper rolls and ink tubes. With that said, even 2 identical comic books do not have identical spines. Staples move, centerfolds can become off center. They are not precision hand-made Italian supercars. Sorry, I just think it's bad advice for new people learning how to press comic books. Once you've mastered the concepts it's easy to want to get ahead of yourself. Buying additional press machines is a more practical and safer solution for you, and for the books. I strongly do not encourage pressing more than one book at a time, and I only stress this because I already can see there being an interest immediately that could potentially damage books. 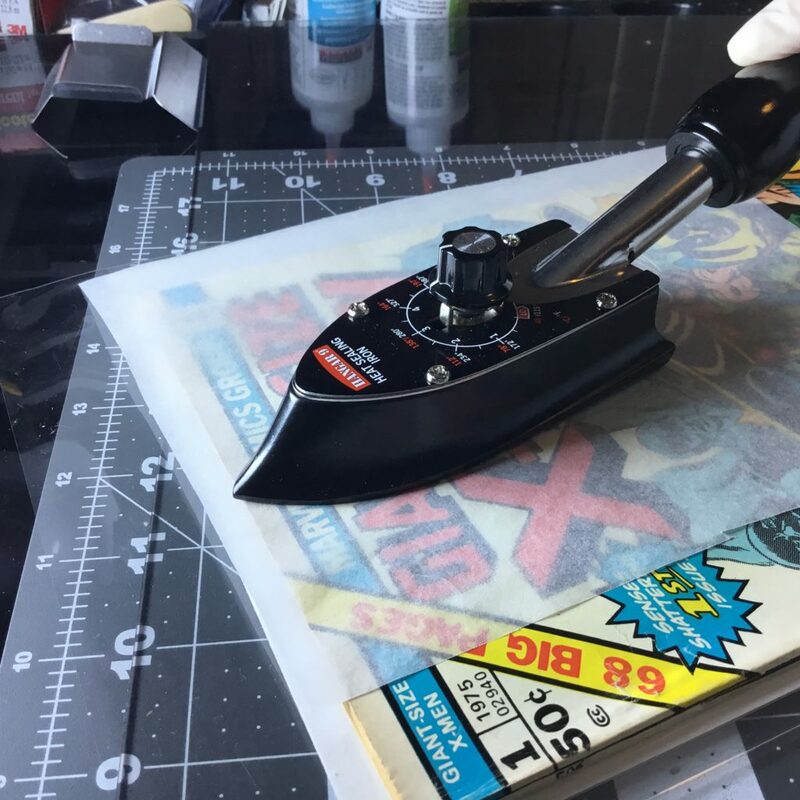 Pressing 2010-2016 modern age DC and Marvel comic books with glossy covers and glossy thin interior pages can be pressed very quickly and reliably well with confidence using this method which only takes a few hours instead of 24 hours. You can press at least 4-5 books a day using this method. The process works by flash heating the covers and pages then letting the book gradually cool back down. This is very effective for covers that have pressure dents or wavy bends or finger bends to cover and first few pages of interior. 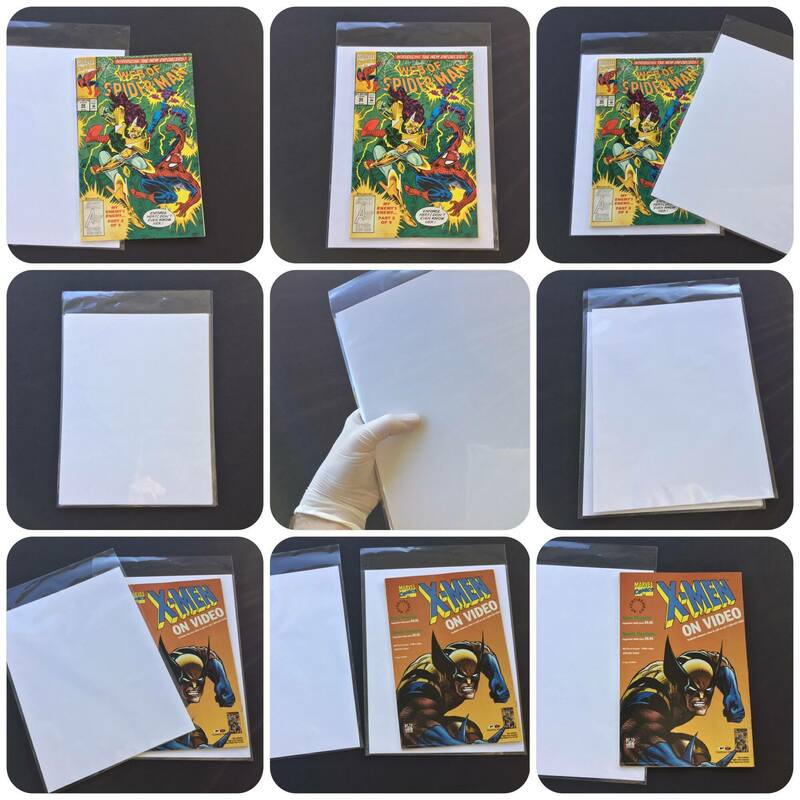 Warning: The "Stan Lee tribute comics" from 2019, along with some smaller independent press comic books and crowdfunded books from Ka-Blam!, Indy Planet or Kickstarter will melt pages to cardstock and backer boards. This method has been tested safely on most modern age DC and Marvel comic books. This method is not recommended for 2019 "Stan Lee Tribute" comics, small independent press comics from Ka-Blam, Kickstarter or Indy Planet or any similar crowdfunded campgain source. The paperstock seems to melt the pages to cardstock or backer boards at centerfold. Be sure to test this procedure on a similar book before trying it on a high dollar Patreon or Kickstarter edition variant comic book if you are unsure. This method has been safely tested on modern age DC and Marvel comic books. Leave press machine off and cold. Preset temperature to 165 degrees for 280 seconds. Turn OFF press machine. If you forget, wait till machine is cooled back down. Place bottom steel plate on press machine. Set a clean unused magazine backer board on bottom steel plate. Place 1 sheet of clean SRP paper on magazine backer board. Place a clean unused backerboard at centerfold of comic book. Place 65 lb cardstock under front cover, back cover (before and after marvel digital code insert sticker if necessary). Place 1 sheet of clean SRP paper on comic book. Set a clean unused magazine backer board on SRP paper. Place top steel plate on bookstack carefully. Make sure press machine pressure is measured with calipers or ruler and adjust accordingly. Press very lightly with minimal firmness when press is clamped down. Close press machine while OFF and clamped down. Turn press machine ON (preset at 165 for 280 seconds) let plate heat bookstack up gradually. When press machine reaches core temperature of 165, there should be only approximately 30-40 seconds remaining on timer. When timer beeps, shut OFF press machine. Wait 2 hours. After 2 hours, flip the book. Open press machine carefully and make a new bookstack and repeat by flipping the book to do the other side. Do not reuse boards or SRP paper. It is wrinkled and could press patterns onto cover. After the other side beeps, turn off press machine and wait 2 hours before you remove book. The pages should not be stuck together but if so, gently and very very slowly and slightly bend the book at the middle with both hands by placing your fingers on back cover and thumbs on front cover, holding the left and right edges by the palms of your gloved hands in order to make the pages release. You will hear the pages unstick together. Otherwise you may carefully open each page slowly and slightly. I do not recommend leaving pages stuck together if you are sending off to grading. Do not let grading companies grade a book with stuck pages. You will get hit hard on stuck pages or curling pages and take a hit resulting in lower grades. If your book has no rounded corners, no spine ticks, no scratches, and no other imperfections that might count against it...this method is guaranteed to give you 9.8s. It is up to you to pre-screen for that 9.8 or it will end up a 9.6. For glued squarebound books with staples, try this method. Cut one inch strips of backer boards using a paper cutter or straight-edge and razor blades. Use those 1" strips of backer boards and make a stack of them the same exact height of spine you are pressing. Slide that stack of 1 inch strips up against the spine of your book about to be pressed. Trying this trick will prevent the spine from being crushed. There are certain books that come to mind: SILVER SURFER #4, GIANT SIZE X-MEN #1 & #2, GIANT SIZE WEREWOLF BY NIGHT, CONAN THE BARBARIAN ANNUAL #1, and others. Make sure the strips of backer boards are outside the comic, and aligned up against the spine. No centerfold backerboard. Cut 1" strips of backer boards that are 1"x10.25" and stack them the same height as squarebound book you are pressing. Place right up against spine and make your boardstack as usual. This prevents spine crushing and is the most effective way. For spine denting, use sheets of inkjet copy paper in between the first and last 5 pages of book. Press the book using light pressure at 125F for 30 minutes. If you are having trouble lining up the strips, use blue painter's tape and tape the very top and bottom of strips so it stays in place. What are "Stan Lee tribute books"? 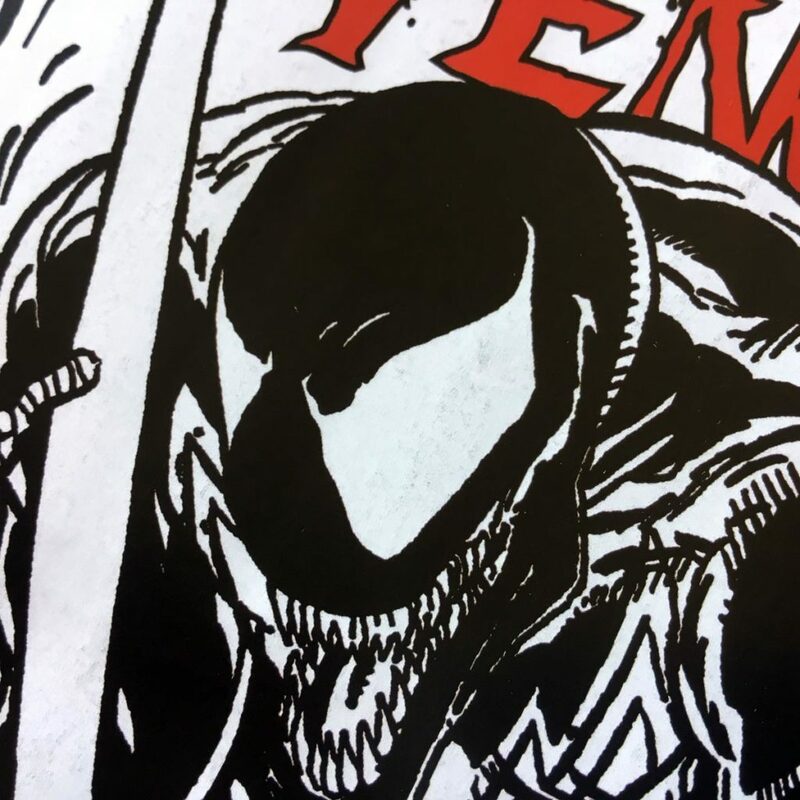 They are 2018-2019 Modern Age Marvel comic books with glossy covers, glossy thin interior pages, and 2 all black pages followed by a portrait of the late great Stan Lee. These comic books also have digital code inserts and very large staple prongs which can dig into the thin, fimsy 20 lb glossy paperstock. The staples can tear the pages or leave imprints through entire book. Sometimes, this can cause staple push right through front cover as well. The issue at hand when dealing with these books is the "tribute pages" can melt and fuse together, ruining the book. These is a special process for these books that you must follow to the exact details or you will ruin a book. The same method also applies to Kickstarter or Indy Planet smaller publication books from crowdfunding projects printed by Ka Blam! or Print Ninja. 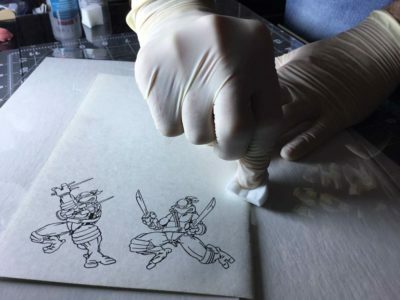 This method is highly recommended for 2019 "Stan Lee Tribute" comics, small independent press comics from Ka-Blam, Kickstarter or Indy Planet or any similar crowdfunded campaign source. This method has been safely tested on modern age DC and Marvel comic books. Leave press machine pre-heated with steel plates warmed up to at least 100F. Preset temperature to 140F degrees for 300 seconds. Place 2 clean unused backerboards at centerfold of comic book. 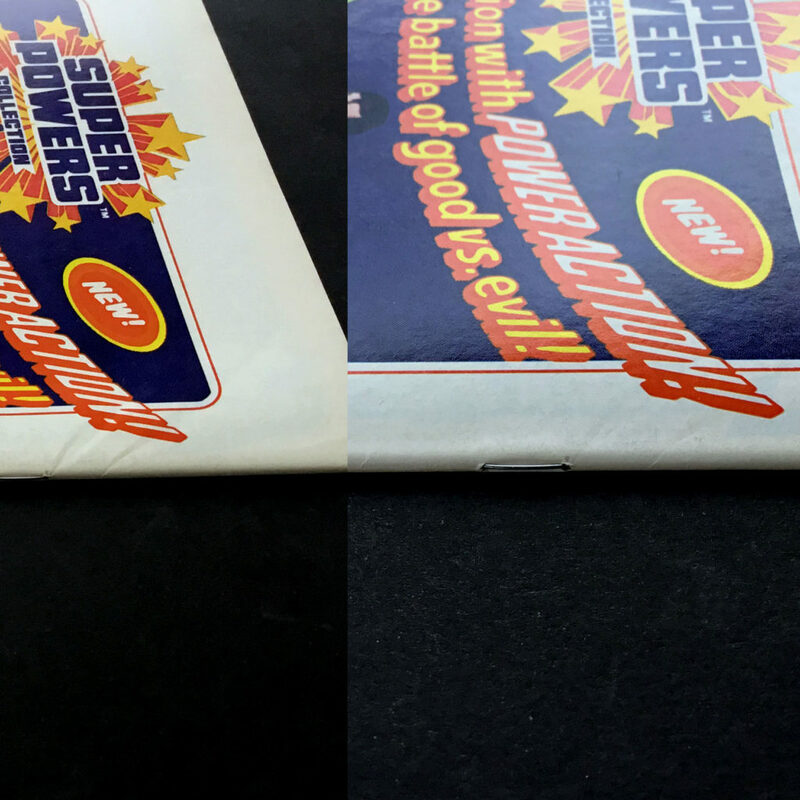 Place a sheet of SRP paper BEFORE and AFTER both centerfold backer boards. Place SRP paper sheet, then 65 lb cardstock under front cover, then another SRP sheet, same for back cover. Make sure SRP paper is directly under both covers and first wrap. Place 1 sheet of SRP paper between first 3 pages of book. This would be between both all black pages, and between Stan Lee's portrait and black page. For good measure, place an additional SRP sheet after Stans Portrait page. At the digital code insert page, place 1 sheet of 65 lb cardstock paper before and after digital code insert page. Make sure press machine pressure is measured with calipers or ruler and adjust accordingly. Press very lightly with minimal firmness when press is clamped down. Close press machine while ON and clamped down. Wait 300 seconds for time to finish. When timer beeps, shut OFF press machine. After 24 hours, remove book carefully from press machine to examine your results. You will find the pages did not fuse together, and the digital code insert did not imprint onto back cover. A dent or divot in the cover of a book can be frustrating. This can be pre-existing from a previous pressing job, or from debris and dirt on cover of book before pressing. You will need: One ball bearing, 1.5″ inch diameter, and a tack iron. If you see a pre-existing divot or dent in your cover you can try this trick out before pressing. Or, if you had some dirt or debris on the pressing plate and/or comic book then you can try this method to fix your mistake. Find or purchase a one and a half inch (1.5″) steel ball bearing. 1.5" Ball Bearing. Wipe your balls first! They are coated with lubricant to prevent rust. A tacking iron speeds this process up instead of using the press machine. You can use the press machine if you don’t have a tacking iron. The tacking iron helps localize the area being focused on. Start by placing SRP underneath the cover being worked on. 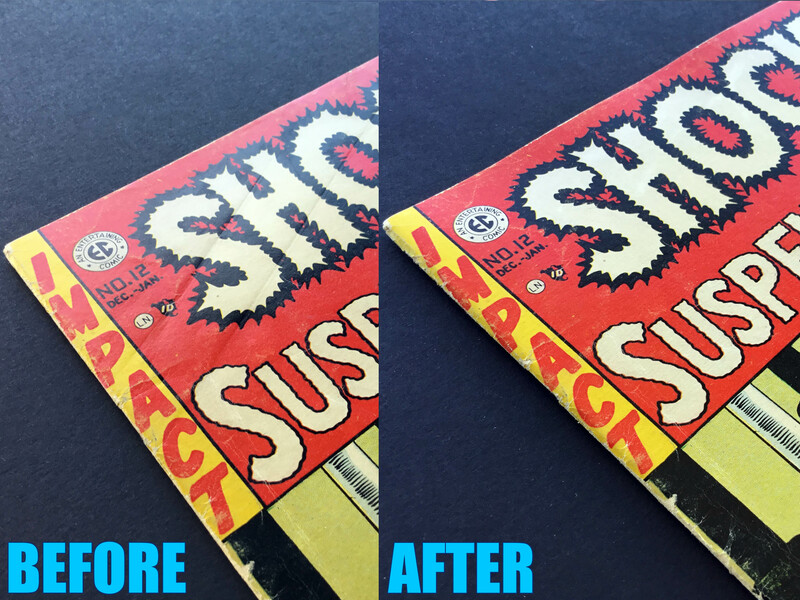 Make sure a clean smooth surface is underneath the comic book. I use a golden age mylite2+fullback so I can move the book around with ease. After placing SRP above and below cover, heat and flatten the spot with a tack iron for only a few seconds. After placing SRP above and below cover, heat and flatten the spot with a tack iron for only a few seconds at a time. Press gently downwards in intervals, but not when sliding back and forth or you can cause scratches. Place a small cut sheet of SRP on top of the cover being worked on. You can place a backer board underneath the cover as well if the initial process doesn’t work the first time. Keep in mind this method doesn’t always work. For example, if you can see the divot pass through onto the next 4 or 5 pages of the book, this method might not be successful for you. If the divot or dent removed ink and caused a color breaking divot you can press it back out but the ink removed will still show the dent. 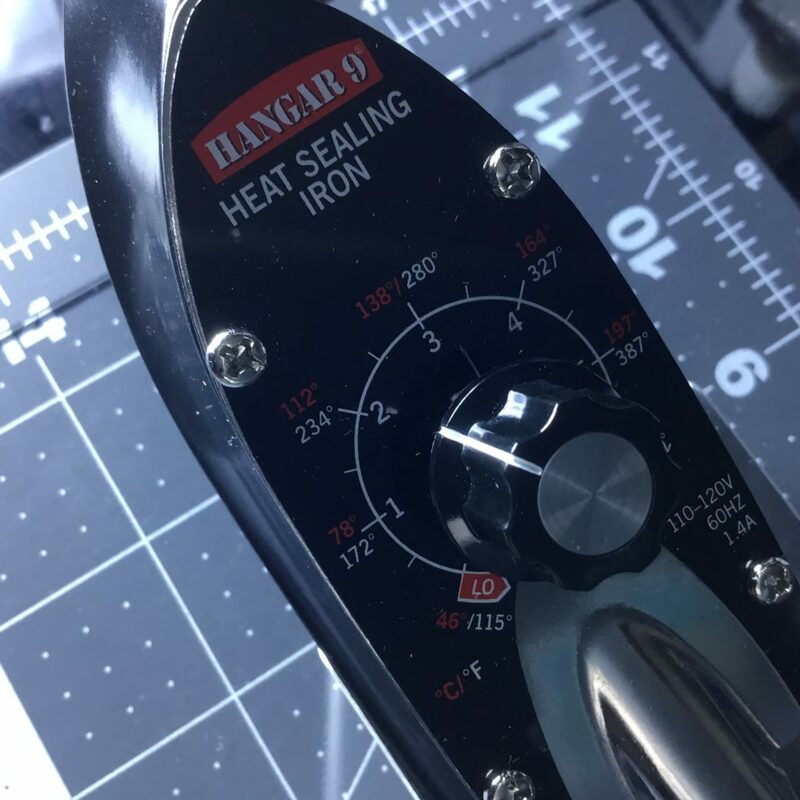 After you now have the SRP and backer board in place, begin heating up the tack iron to 140-150 degrees for moderns or 160-165 degrees for bronze and copper. After just a few seconds the book should be warm to the touch. 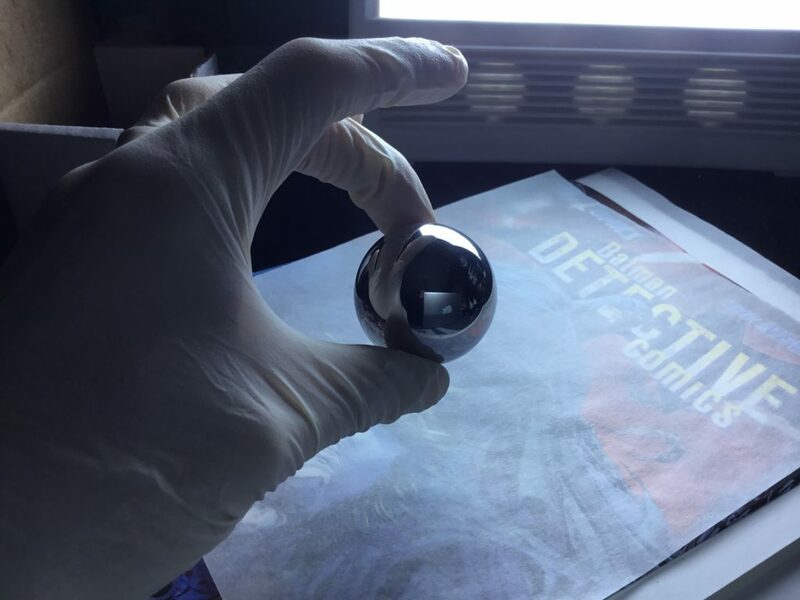 Set the ball bearing down on the heated spot, and press down firmly with the palm of your hand, rolling the ball bearing around the spot in a circular motion. Place your ball bearing down on top of the SRP on cover and begin rolling the ball around the location of the divot. Press firmly with the palm of your hand as you press down with pressure and roll the ball in circular motions. You can pinch the ball bearing as well and roll it around firmly in a circular motion. You can also pinch the ball bearing with your thumb and 2 index fingers while pressing downward with firm pressure. Alternatively, you can carefully open the cover and perform the process on the underside of the cover if you can see the bump from other side. This method is risky because you can put stress on the spine and create spine ticks. Only try the underside if you feel the ball bearing isn’t working well on the top side of the cover. 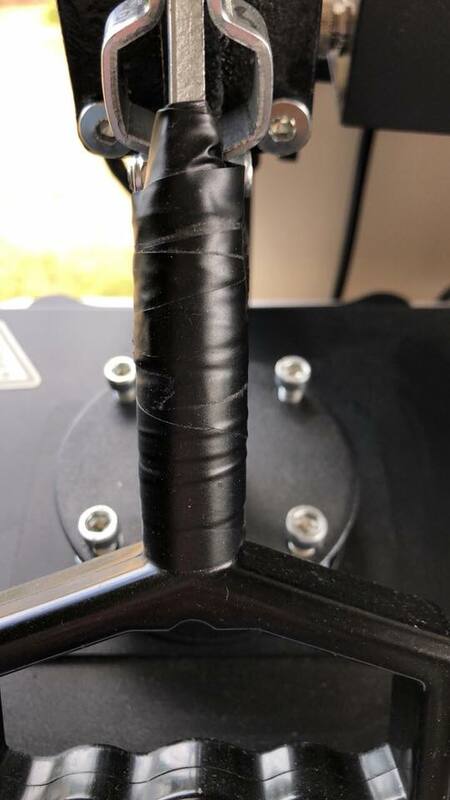 Set the ball bearing down on the heated spot, and press down firmly with the palm of your hand, rolling the ball bearing around the spot in a circular motion.The divot is gone from the trade dress logo on cover. 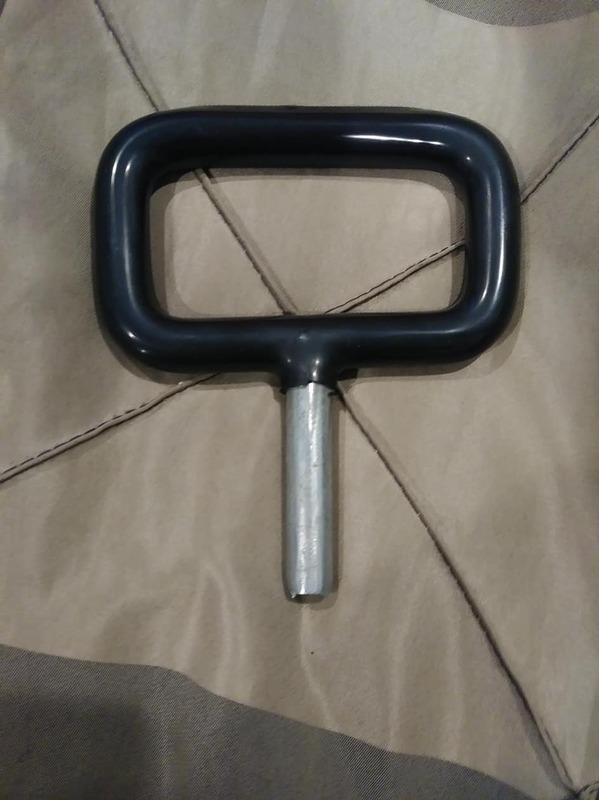 The cover will be wavy from the localized tack iron. You are now ready to press the book as you normally would.The divot is gone from the trade dress logo on cover. The cover will be wavy from the localized tack iron. You are now ready to press the book as you normally would.The divot is gone from the trade dress logo on cover. The cover will be wavy from the localized tack iron. You are now ready to press the book as you normally would. Divot is now out of front cover of book. You are now ready to press the book as usual. After 2 complete pressings, the divot is completely gone from the cover of book. After 5 weeks at CGC, this book has been graded a 5.0 VG/FN condition comic book. Sometimes it isn't about immediate results. The heat from the tack iron on number 2 or 3 at extreme localized applied heat and rolling a steel ball bearing around works at a much deeper level than you'd think. On the surface some books will not display progress until after pressing. In the following example given, this copy of HE-MAN and the MASTERS of the UNIVERSE #18 (1st appearance of She-Ra) had deep indention on Battlecat's right eye and along right side front cover. The dents were all the way through the first 6 pages of book including front cover. There was also some dents on middle back cover as well. I spent a good hour working each page out with a tack iron turned to setting 3 (which is over 250 degrees) and applied firm pressure with a 1.5" inch steel ball bearing. No matter what, it seemed nothing was working. So I pressed the book as usual anyway....with superb results. Be patient and keep at it. The tack iron and ball bearing are working at the deepest layer of paper fibers using localized heat and pressure. Science! This book first had a steel ball bearing and tack iron on the first 6 pages including cover before pressed. The results of the ball bearing and tack iron were not successful...or so it appeared that way. Sometimes this technique works by loosening the paper fibers up so the press machine can actually do its job successfully. Do not be discouraged if it looks like the ball bearing and tack iron aren't working. Chances are...it is working and you don't know it yet. Press as usual and see what happens. After 3 weeks this book has been graded by CGC as a 9.6 Near Mint comic book. Start with a light press using backer boards and SRP with the 15×15 press. After 5 minutes on each side completely flattened out, lightly fold the book back over and press down to make your new fold. Start with a light press using backer boards and SRP with the 15×15 press. After 5 minutes on each side completely flattened out, lightly fold the book back over and press down to make your new fold. After a signing with George Perez, this book was graded a CGC 8.5 comic book. An example of how to create a new centerfold for spine roll fixes using a swivel heat press machine. First begin by laying the book flat in a hydration chamber for 1-2 hours. Next, lay the book flat face down in the press with 2 backer boards at the staples on top and botton. Flip the book after 5 minutes on 160 degrees. 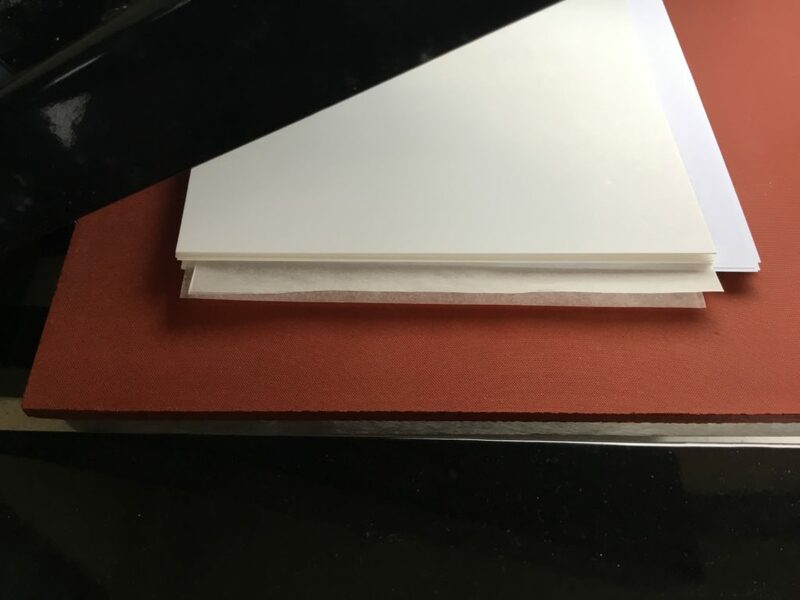 Begin making your new fold by folding the book in half and pink the edge tight and make your new fold with the press for 2 minutes. Proceed to press as normal afterwards. 1977 Ms Marvel #1. Spine roll fix alignments can be fun. I mean that sincerely. They can be real fun and rewarding to work with. One method I’ve seen now in the pressing world is to adjust that spine so all the spine creases and dents move to the back of the book for a better eye appeal inside a graded case. This does not trick the graders nor are you trying to pull “a fast one” but you are making the book have a better eye appeal when considering reselling or displaying the book. Steam the book with some humidity. Do this with a clothes steamer or a Do-it-Yourself Humidity Hydration Chamber. Set the press to 160 degrees. This part of the process does not matter if golden age/silver/modern/foil. Get a 1/8” stack of backer boards, gloss free, or at least put the gloss away from the covers. Place them down the center of the rubber pad on press. Get the book in question. Find the staples. Find the center. Flatten the book from the inside face down, staples down. Set the book carefully onto the stack of backer boards 90 degrees perpendicular to the pad. If you are using the Tivor Swivel Mount Heat Press Machine, you will have an overhang obviously. That’s fine. You’re going to rotate in 5 minutes to do the overhang side if so. Stick one backer board on top of your spine. Carefully and slowly lower the press onto the comic and make sure the spine flattens out. Keep the book this way for 5 minutes. If you are using the Tivor swivel press machine keep reading. Otherwise skip to step 13: Now swivel everything around and press the overhang portion of the comic book spine. Press for 5 minutes. If using the larger 15×15 heat press machine, press for 5 additional minutes. Now remove the book, keep the boards there. Maybe take the bottom backer board and put on top in case there was a staple indent. Flip the book over on its opposite side, with the staples now facing up. Set the book carefully onto the stack of backer boards with the staples facing up – 90 degrees perpendicular to the pad. You will have an overhang obviously. Stick one backer board on top of your spine with the staples facing up. Carefully and slowly lower the press onto the comic and make sure the spine flattens out. Now swivel everything around and press the overhang portion of the comic book spine. Press for 5 minutes. The book should now be completely flattened out after 10 minutes total duration of pressing flat against cardboard backers. You are going to make your own new centerfold now. Remove all backer boards and anything left in the press. Only should have a rubber pad and a metal plate above, nothing else. No SRP Paper, either. 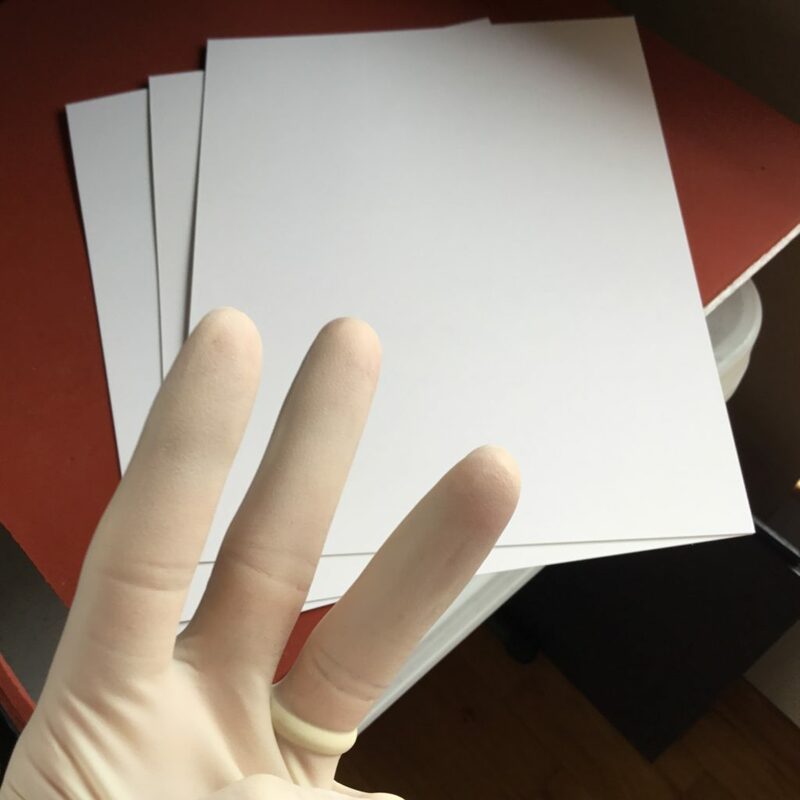 Using latex gloves, you are going to fold the book carefully in half. Stand the book up on its bottom edge when doing so. Pinch the middle center with your index finger and thumb TIGHT so no movement happens between pages. 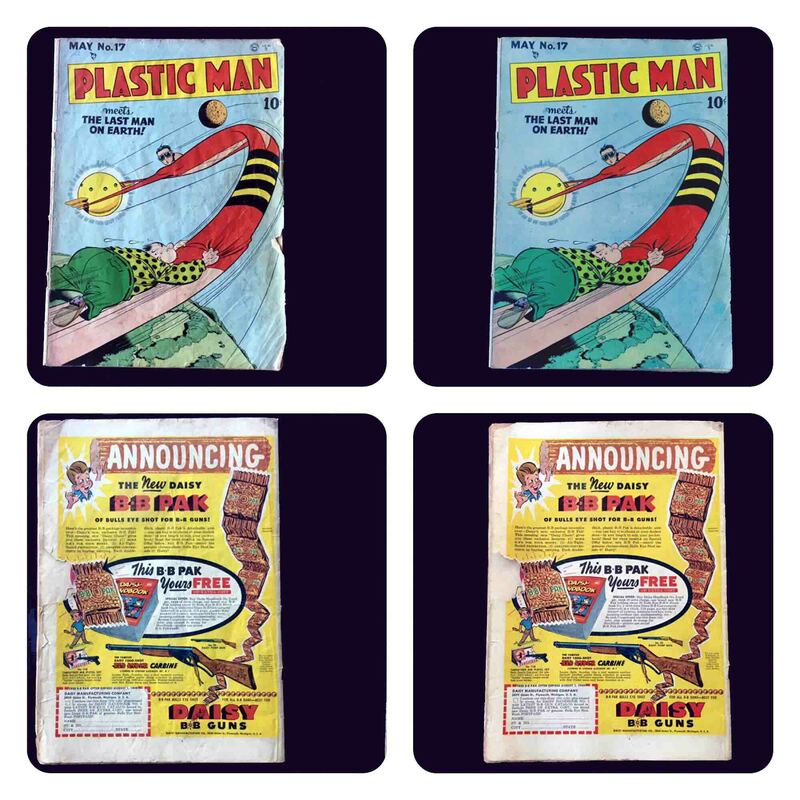 Stick the pinched comic with your fingers in sideways, allowing 7/8 of the comic’s surface on top of the rubber pad. Bring the metal plate down onto the comic and press down . You want your fingers so close to the plate that it will almost press your thumb down. Do not let the book move or travel with the press. You get only one shot at this! The reason you are using 7/8 of the surface is to minimize travel of the book when the press goes down on the book. If you barely place the comic in close at the spine, the entire book will travel and move on you as its being pressed! This step will take you time and practice to get the hang of it. Start small on simple dollar books to practice spine roll fixes! Books like this should be approached in a very careful manner, especially given the age and state of the book's pages. What is necessary to do is create a new centerfold. The way to start this is by completely flattening the centerfold cover side up and cover side down. You can actually do the spine realignment on any book, even a brand new modern book! I recommend this for blunted corners and deep spine indents or bunched up corners. This method is preferred instead of just shoving backer boards into your centerfolds and interior covers. If you only use backer boards or stacks of paper, you risk imprinting edges of the paper or backer boards into your books. Evidence of this is a simple vertical line that travels the length of the spine. Blunted non color breaking spines can be intimidating. 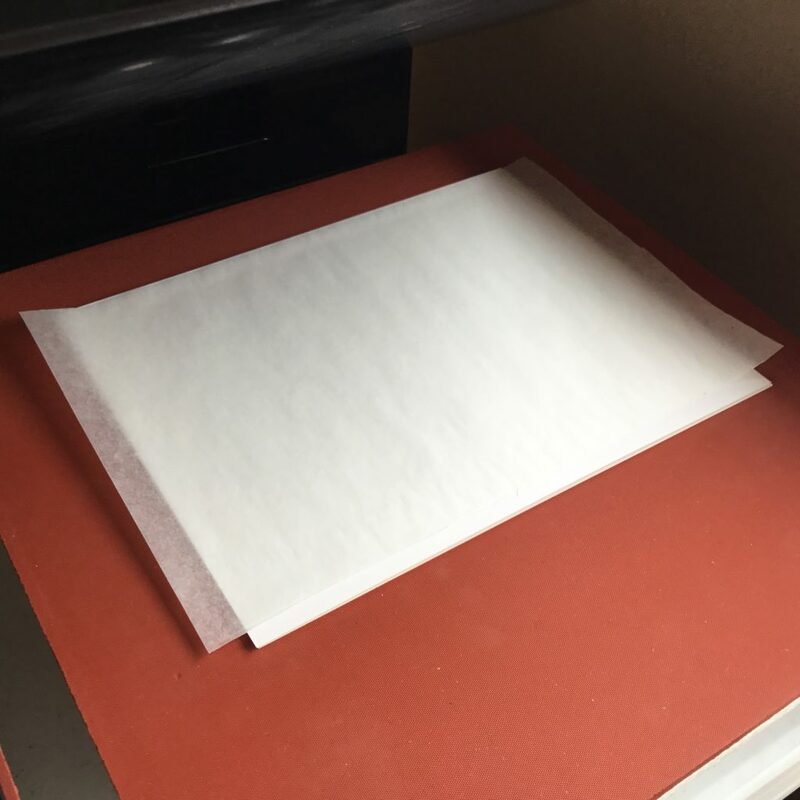 Paper records such as maps, newspapers, and documents that have been rolled or folded for long periods of time often may be safely flattened using carefully controlled humidification. Not all books require moisture. Most modern comics should not be introduced to humidity or steam. However, some older books would benefit from humidity. Brittle pages, Golden Age books, Silver Age books, frustrating blunted corners without color breaks, blunted spines, spine rolls, and rolled up or folded in half comic books. But why would you use moisture on books? The reason for this is the fibers of the paper must be relaxed for the process of pressing to actually take hold and remain. You can do this with a simple humidifier or clothes fabric steamer. Use the steamer for a few seconds to only make the pages curl. As soon as paper movement is seen, move to a different area or stop using steam. When creating new centerfolds, fixing spine denting, and working with golden age books – you are required to use steam. This is a very delicate process and should be used with moderation. I cannot stress this enough: not all books require moisture. Do not place a new modern age glossy cover, glossy interior pages comic book inside a humidity chamber. Chances are it will ruin the book. The modern age books produced now are very forgiving with press machines under flash heat without moisture. It is not recommended to leave a comic book inside humidity chamber over 24 hours. You will start to wash out colors. Most in the community agree that 10-12 hours with a bowl of room temperature distilled water is the average recommended time for controlled gradual humidity. The water level is what is the most crucial element to your tank working effectively. Spine splits greater than 1"
Always use distilled water. There are no minerals or dirt in distilled water. Otherwise you will get water spots and staining from the minerals if you do not use distilled water. It is recommended to empty the water chamber after several uses, or you will develop unwanted mildew. Do not use tap water. Water stains and water spots can develop on your book. Tap water also can cause off-white pages. 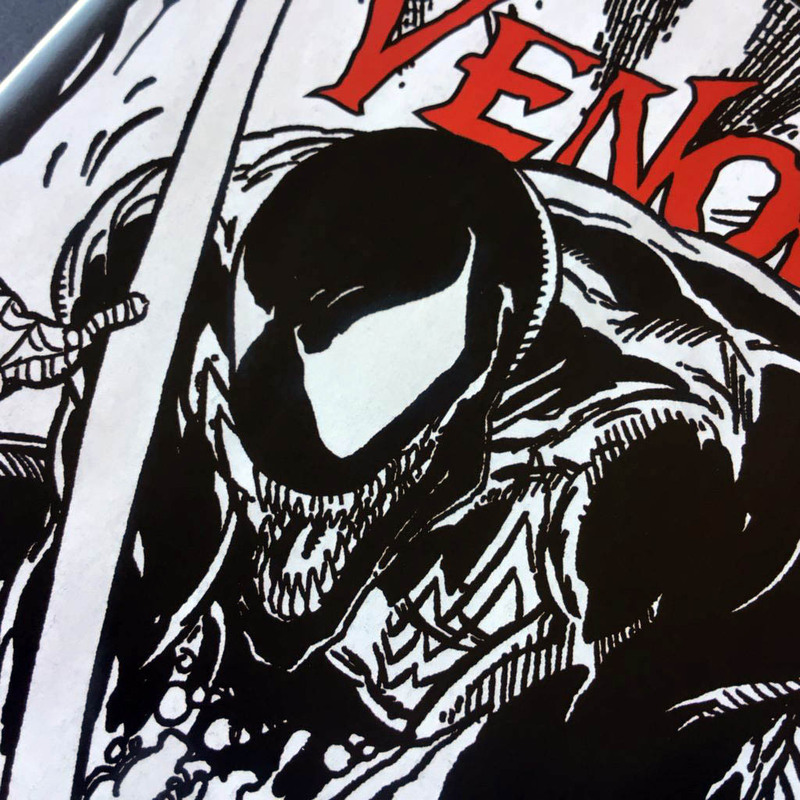 When using a humidity tank with a comic book, it is not unusual for a book to have "off-white pages" and receive "white pages" as the new page quality designation. For the same reason tap water can cause off-white pages, (by minerals absorbing into the paper fibers) clean distilled water can cause white pages. It's always a good idea to replace your water between uses and dry when empty. Most books will not require humidity. If a book is old, brittle, feels very dry and rigid to the touch – then you should probably use humidity. Time and patience will guide you. Always better to use not enough humidity with a slightly disappointing press with no damage to the book and do it again than to use TOO MUCH humidity and ruin the book, right?! Too much humidity and too much heat can cause edge flaring and a wavy cover. If you are using a clothes steamer, be sure to steam from a safe 1-2 foot distance so droplets of water don’t splash on the book. This can create light circle spots when dry. Also do not over steam staples or they will rust. The safest method would be to make your own hydration humidifier chamber with basic supplies at Home Depot or Walmart. The recommended and average method for this technique is to use room temperature distilled water. Some applications will require a different accelerated approach. A lot of this depends on trial and error, experience, and varying conditons of books. Use a plastic mixing bowl or cereal bowl to control your water levels. If this is not effective enough, try pouring 1/4 gallon or 1/2 gallon of room temperature distilled water in the entire bottom of tank. Most of these recommended methods also depend on what type of climate or region you live in. Experiment and see what works best for you and your needs. 1. While using room temperature distilled water, you should leave the book inside the chamber for 12 hrs. Personally, I place a book in the humidity tank at 9pm and take it out the next morning at 9am. Longer durations exceeding 24 hours will start to wash out color. You will fade the cover if left in chamber for too long with too much distilled water at the bottom of tank. Control your water levels for maximum effectiveness. 2. Most average books from Golden Age to Bronze Age with light creasing can be placed in humidity tank with a small bowl of room temperature distilled water for 2 hours but not more than 6 hours. 3. For really stubborn books that have heavy subscription folds or creaselines: Forget the small plastic bowl. Boil 1-2 cups of distilled water on the stove top. Pour the 1-2 cups of boiling distilled water inside your chamber with 1 half gallon of room temperature distilled water inside the entire bottom of tub to provide accelerated steam evenly to the book. Do not boil more than 1-2 cups. It would introduce more than 120% humidity with temperatures too hot that will cause warping and damage to your book. When using boiled distilled water you should check on your book after 1-2 hours. You will need: 1 gallon of distilled water, some terry cloths from the kitchen department, a 40qt storage tub, cooking grill grate, some plastic cups and a plastic bowl. Another way to build a humidity tank.... (many options) Just make sure the storage tub is air tight and can be sealed. Set something heavy on top of lid when closed. Make sure you use distilled water. Fill the bowl with distilled water as much humidity you think the book will need. See chart above for recommended water levels. Stubborn books might require filling the entire bottom of storage tub to 1" inch water line. Place a buffer between your comic book and any water droplets that might land. You may use synthetic nylon window screen, a towel, or terry cloth on your grate surface. Then place a magazine backer board on top of buffer or terry cloth. Place book on backer board as pictured above. Now place another magazine backer board on top of your book. Place another buffer such as a terry cloth on top of boards and comic book for protection and a little weight. This is another example of a Humidity tank using slightly different materials but achieves the same results. Your humidity tank should look similar if not the same. Close lid up tight and place something heavy on top of lid to retain seal inside to trap the humidity inside tank. Another example of a similar humidity tank. This one uses a Weber grill surface grate and nylon window screens cut to 12"x18"
2001 Marvel Comics SPIDER-MAN 2099 #1 Second Printing horizontal bend from left to right across entire book and throughout all pages of book from blister packaging comic book originally came inside of with packaged action figure toy from Toybiz. After 12 hours inside humidity tank as pictured above. Pressed using steel plates and magazine backer boards with 65 lb cardstock paper at 160F degrees for 5 minutes and left overnight in coldpress for 24 hours. 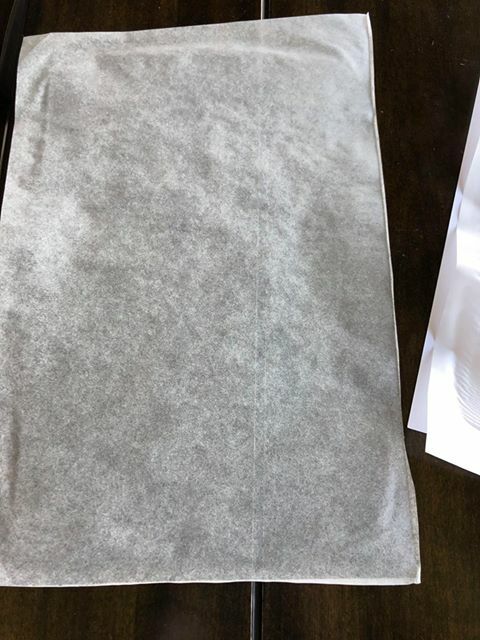 A long time ago, I had previously been using the Conair Clothes Steamer method, but it's not reliable and you risk damaging books with water spots. This way is deemed much safer and dependable. During the initial tests I ever did was 18 hours left overnight inside the chamber at room temperature distilled water. After much testing and trial and error, for most books, I have determined you should leave the book overnight from 9pm to 9am (or adjust accordingly to your schedule). Place the book as normal flat on a magazine backer board and place an additonal magazine backer board on top of it. Cover the book and boards with terrycloth for protection. Leave overnight to let the paper fibers naturally absorb the humidity from the bowl of water below grate. The safest controlled method is leaving 1 book in humidity chamber for 12 hours at room temperature distilled water. Start at 9pm and remove damp book at 9am. There are several websites available online, including the Library of Congress at your disposal. According to the National Park Service, “Paper records such as maps, newspapers, and documents that have been rolled or folded for long periods of time often may be safely flattened using carefully controlled humidification." So with that in mind, you really should remove the steel staples from the comic book. With that disclaimer stated, we aren’t going to remove the staples from the comic book. We are not restoring the comic book. We are only cleaning and flattening the book. Removing/replacing staples counts as restoration, and we don’t want that. Since the duration time period inside our homemade humidification chamber will be only be 15-30 minutes, I do not believe that is long enough for iron oxidation to set in on a staple that currently shows no signs of rust. Scientifically, and depending on your climate conditions, it’s more realistic to assume light rust would begin to set in at the microscopic level within 2 days. Steel can start to corrode (microscopically) immediately upon exposure to the elements. Since we are leaving the comic book in for 15-30 minutes, it’s probably not going to cause rust. The heat press will absorb the humidity moisture and dampness of the book within minutes before rust can take proceed. There is a risk of warping and flaring using too much humidity on damp books from the humidity chamber. Sometimes we leave books in the chamber for several hours, or even overnight, due to deep stubborn creaselines or folds. If you use only SRP with nothing else, moisture can set in too fast before evaporation can take place. This seeps through the SRP paper and will need to be replaced after 5 minutes. When the press machine is in the shutdown phase cooling off, not enough moisture is removed from paperstock and backerboards. Moisture collects and causes moisture patterns all over the SRP paper. Worse, mold can begin to form on the cover as well. 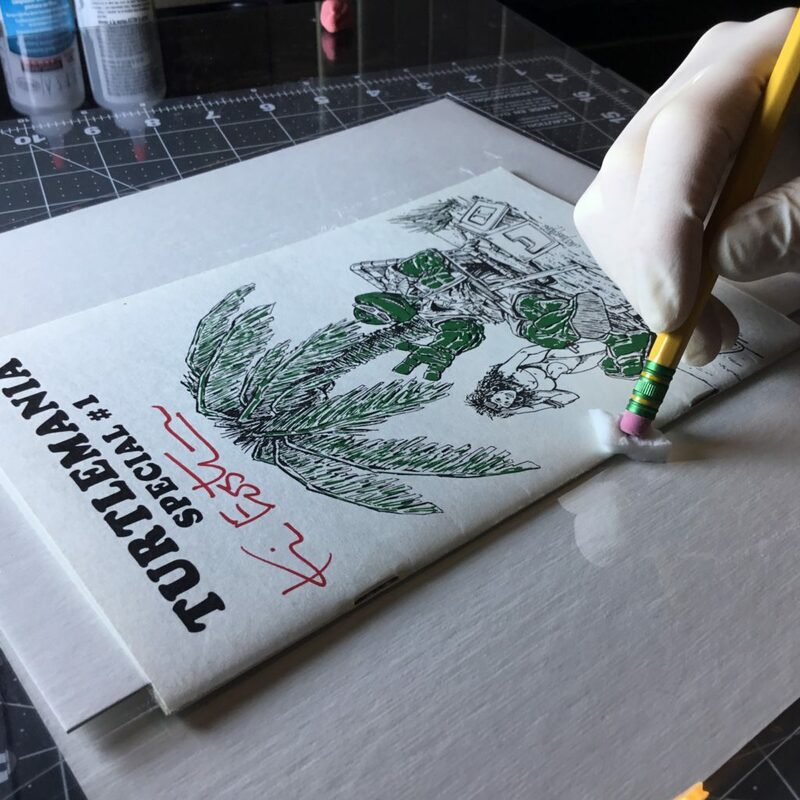 It is crucial to use backer boards as a cushion to separate the moisture and dampness from setting in and seeping onto your books. You will need to press the book 3 times in 5 minute intervals, changing and replacing all backer boards and srp paper each time. On the 3rd cycle you will leave the book in the press for 24 hours before removing. Because this step uses up large amounts of backer boards, I set aside magazine backer boards that have been used only one time and I use those for the stacks of 3s for cycle 1 and cycle 2 since the book is at its peak dampness. On cycle 3 I use a fresh clean set of backer boards for the final press. Press damp book for 5 minutes at 150-155 degrees, using 3 backer boards on top and below book / SRP paper as shown in image above. You cannot use copy paper under covers on the first 2 cycles. Covers can split when damp. Use a box fan on HI for 5 mintues to cool press machine. If you do not have a fan, it's okay - just don't touch that plate of the press machine or you will burn yourself. For cycle 2, replace all backer boards and SRP paper with dry, fresh paperstock. Make sure backer boards are flat side out, glossy side inwards towards book or plate. 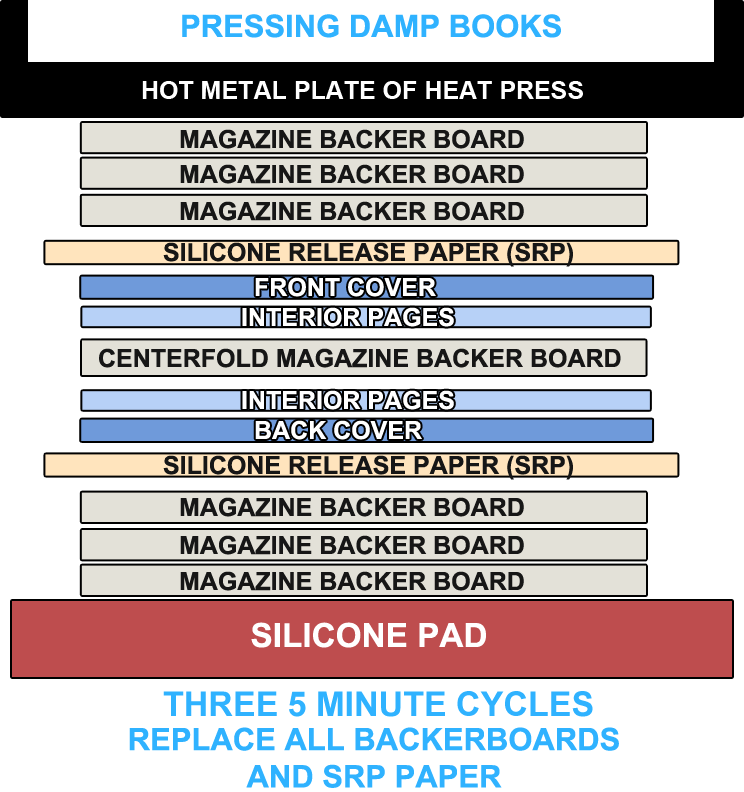 On cycle 2, press less damp book for 5 minutes at 150-155 degrees, using 3 backer boards on top and below book / SRP paper as shown in image above. For cycle 3, replace all backer boards and SRP paper with dry, fresh paperstock. Make sure backer boards are flat side out, glossy side inwards toward book or plate. On cycle 3, press dried book for 5 minutes at 155-160 degrees, using 3 backer boards on top and below book / SRP paper as shown in image above. You can now use copy paper under covers to push out spine ticks but not backerboards or cardstock. Covers can split when damp. After 3rd and final cycle of heat duration of minutes is up, shut off press and leave overnight for 24 hours. There is a danger of rust to using hot steel plates on damp books from the humidity chamber. Sometimes we leave books in the chamber for several hours, or even overnight, due to deep stubborn creaselines or folds. 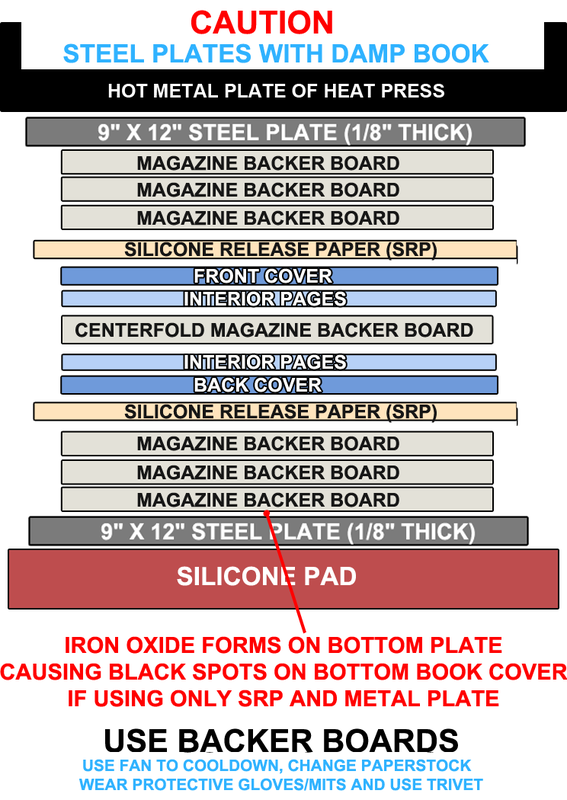 If you use only SRP paper and metal plates, iron oxide (rust) forms on the bottom plate. This seeps through the SRP paper and will cause black spots all over the cover facing the bottom plate. When the press machine is in the shutdown phase cooling off, the bottom plate cools down much faster than the top plate. Moisture collects and causes rust patterns all over the SRP paper. Worse, mold can begin to form on the cover as well. It is crucial to use backer boards as a cushion to separate the moisture and rust from seeping onto your books. Press very damp book for 5 minutes at 150-155 degrees, using 3 backer boards on top and below book / SRP paper as shown in image above. You can use copy paper under covers but not backerboards or cardstock. Covers can split when damp. Use a box fan on HI for 5 mintues to cool plates. If you do not have a fan, it's okay but you will be working with very hot steel plates so try to let it cool for a bit before touching the top steel plate and work quickly or you will burn your fingers. Wear protective handgear such as gloves/mitts and set top plate on trivet. For cycle 2, replace all backer boards and SRP paper with dry, fresh paperstock. Make sure backer boards are flat side out, glossy side inwards toward book or plate. 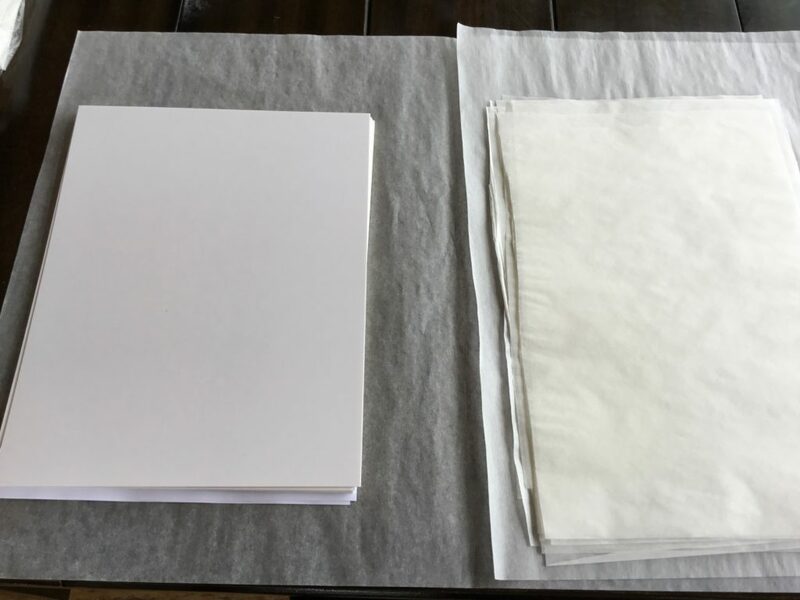 On cycle 3, press dried book for 5-10 minutes at 155-160 degrees, using 3 backer boards on top and below book / SRP paper as shown in image above. You can now use copy paper under covers to push out spine ticks (but not backerboards or cardstock). Covers can split when damp. Bottom SRP Paper from a damp book using only steel plates and SRP paper. Top SRP Paper from a damp book using only steel plates and SRP paper. Is this the only "correct" way to press comic books? No! There are many ways to press comic books. Many professionals do it differently! There is always more than one way to achieve the same favorable results. 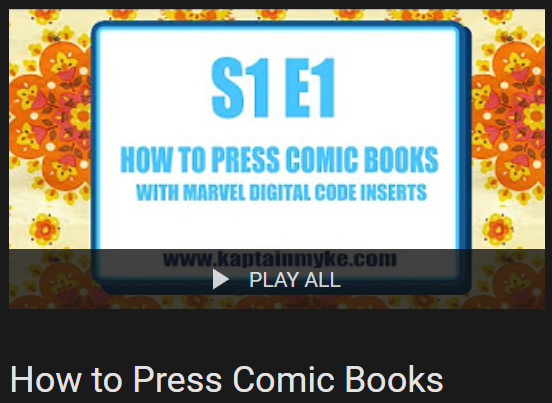 This entire guide is not the "end all, be all" correct technique to pressing comics. This guide was written based on my own personal experiences, user feedback, and lots of "trial and error". I am happy with the results I get on graded books from CGC so I try to maintain the same degree of quality and procedure. The best part of comic book pressing is you will continue to pick up new tricks and secrets along the way. You might even find a better way to do something as you read this guide. 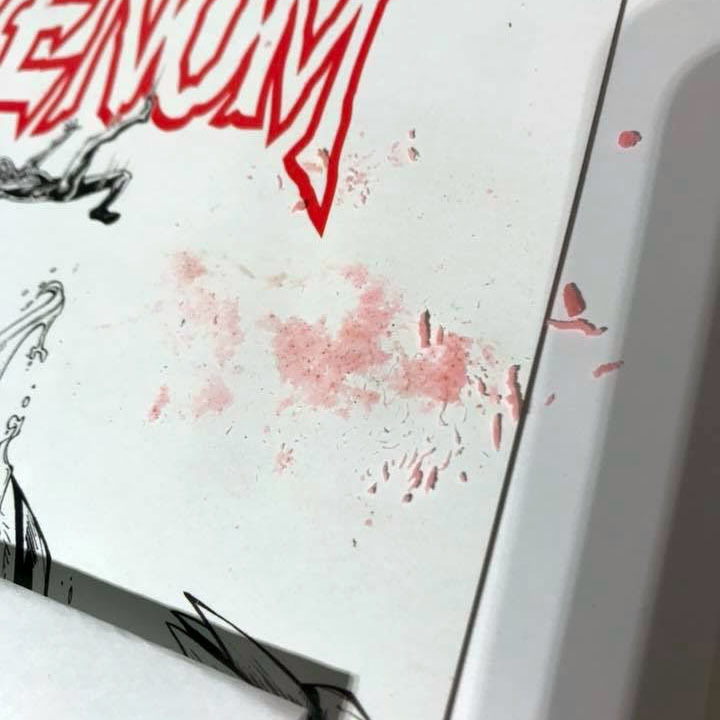 Experimenting and practicing is part of what makes comic book pressing so unique and exciting! What press machine do you recommend? That’s a good question as I would not be an expert in answering that question reliably. I go with what I know so to speak and the clamshell press and the swivel unit are the only two I have used and have experience with. So it would be false for me to give a straight reliable answer because I’ve never used a seal dry mount laminating press machine. I have experience with the 15x15" clamshell press and it’s what I am most comfortable with. I had way too many problems with the swivel unit when I first started out with. I have the most control using the clamshell machine. I do see there are other types of models out there on eBay now with the blue silicone pad and the control panel on the right side… Which I have read and heard complaints about that model. The two 15x15" clamshell press machines that I currently have for two years now have been used consistently and reliably with no problems. Both of these models came from the same seller and feature orange silicone pad and control panel on left side of back panel. I have never even considered buying a Seal press machine either. If anything, I have considered buying a third clamshell press machine like the two I currently own. It's a case of Ford vs Chevy. What is the best press machine to use? Professionals will swear up and down that the Seal Jumbo Dry Mount Press is the absolute best machine to go with. The results and techniques still apply to this guide. Many owners of Seal press machines are members in our Facebook group. Feel free to ask around! Research is important for you to make an informed decision. Why is the press machine "clicking" and the light blinks? This is a normal function of the thermostat working properly inside the machine. As the platen heats up and reaches the set temperature controlled by you, it very temporarily shuts off to not exceed that set temperature. Don't worry! Everything is working properly. Why do you use steel plates? I use steel plates set on top of the rubber silicone mat for a firmer, conductive metal totally flat machined rigid surface. The silicone mat is a buffer cushion so you don't press too hard into book. The original purpose of that mat is for t-shirts. We are not using the machine for t-shirts. What is this I hear about you using aluminum plates too? I use steel plates for regular dry high heat pressings. I use aluminum plates for damp or wet books that have been placed inside a humidity tank chamber overnight for 8-10 hours. I set the press machine for 60 thinking it was minutes but the press machine beeped after only a minute! Is the timer broken or set wrong on my machine? The temperature for machines is set to Fahrenheit. The timer is set to seconds. The clamshell press machines have a maximum timer of 999 seconds, or 16 minutes. Why do you recommend pressing books on average between 150F and 165F? I've read and heard of others pressing books for 170F and for an hour. My recommended temperature and times are based off personal experience and many hours of testing and re-testing results. I've never pressed a book past 170F because you can actually smell the comic roasting in the machine. Too much heat and too much pressure will destroy books permantently at the paper fiber level. Why do you recommend leaving books in the press machine for 24 hours? That takes too long to press books. Again - My recommened temperature and times are based off personal experience and many hours of testing and re-testing results. Every single silver age, bronze age, and copper age book I've removed under 4 hours from press machine caused a sort of flaring and curling through entire book. I realized very quickly that reversion takes place if the press machine and book are still warm or hot to the touch. To guarantee a completely flat healthy spine and book, it's best to leave the book inside machine for 24 hours. This is the best practice to avoid reversion and flaring. Modern Age books can be removed from press machine after 2 hours? This is correct because todays thin flimsy paperstock on modern comics is totally different from older comics made prior to 2002. You can safely quick press modern age comics by removing them after 2 hours, flipping the book and replacing SRP paper and press again the other side. You can use the same backer boards and cardstock paper too! Just make sure you replace the SRP paper because it gets wrinkled. After 4 hours total you can move on to another modern age book to press in the same day. So, in theory you could press 2 glossy modern age comics in the same day if you have only one machine. Why do you use cardstock paper and copy paper? I use copy paper on thin comics, golden age and silver age comics with lots of pin holes or spine splits, and damp books. I use cardstock paper only on dry healthy books that benefit from pushing out spine ticks and staple push. Can I re-use any of the paper or cardstock and SRP paper? In order to maintain a sterile environment for the comics, this is not recommended. Always replace any and all SRP paper you have used. If you see a new sheet of SRP paper with a wrinkle on it, discard it immediately and get a fresh clean flat sheet of SRP. All paperstock should be replaced. Can I re-use any of the magazine backer boards? In order to maintain a sterile environment for the comics, this is not recommended. Always replace any and all backer boards you have used. You can save backer boards that have only been used once for pressing damp books to cut down on supplies and materials. However, each damp cycle should be replaced with a new "used once" board on cycle 2 and cycle 3. Don't keep reusing the same materials! 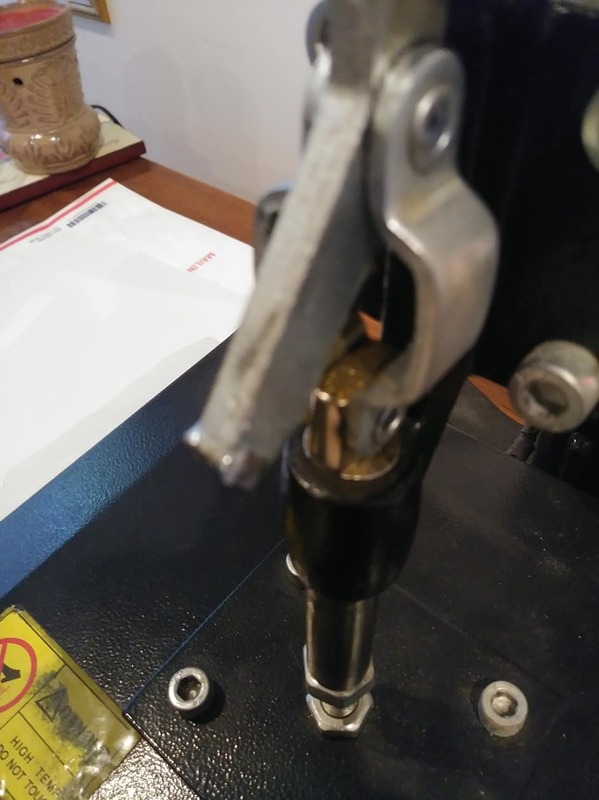 Will a tacking iron remove non color breaking spine dings? In many cases yes you can safely and slowly work out non-color breaking dings on spines while using 65lb cardstock with srp under cover, and srp paper on front cover, and gently work out the ding with a tack iron. Is it true you can use a light bulb to work out cover dents? It's true. You can use a ball bearing, a light bulb, a mini clover iron with ball attachment, and many more round items. The idea is to work out the dent slowly by applying gentle pressure around the dent with heat and pressure. A clover iron or hangar 9 tack iron in conjunction with a ball bearing or light bulb gives great results. Try it! Do I fill distilled water inside the bowl or in bottom of humidity tank chamber? You can safely do either. Depending on the climate you reside in, sometimes a little more water is needed to provide desired results. I frequently pour a 1/4 gallon into the entire bottom of my tank and leave a book overnight. Sometimes, if I am nervous to work on a high dollar valuable book I will use a bowl instead to limit the amount of water inside the tank. It depends whether you want a totally damp book the next day or if you simply want to introduce a little bit of hydration into the book to relax the paper fibers. More severe wrinkled comics from the 60s and 70s benefit greatly from the tank bottom being full of a 1/4 gallon of distilled water inside tank. A newer book from 1996-2006 would probably benefit using only a small bowl with a 1" amount of water inside of it to limit the exposure and times. Only time and experience will guide you on this one, I'm afraid. I placed a book in my humidity chamber and left it for 12 hours. The tank isn't foggy and the book doesn't feel wet at all! What did I do wrong? Nothing! Believe it or not, that book is damp. The book was most likely so dry it needed to soak up the moisture into the paper fibers. If the room your humidity chamber resides in has a temperature warmer than the water temperature inside your tank, it can remain clean with no moisture condensation on walls. 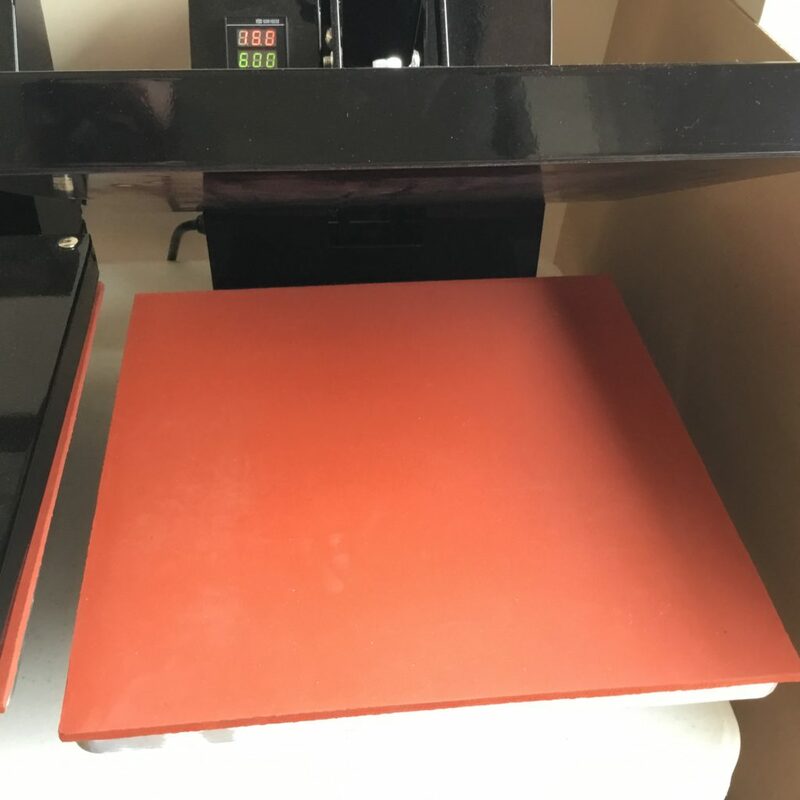 When you place your supposedly dry book inside the press, you will find the book will have moisture condensation around the backer boards and on the press plate after cycle 1. You'll be surprised the amount of moisture a book can absorb if it really needs it. If my answer here does not apply to you and the book still isn't damp, check and verify your storage container is air tight with zero leaks. I removed a comic book from humidity tank chamber after 10 hours. The book is now super damp and I see wrinkles, creases, folds, and ripples that were not there before! Creases, wrinkles, curls and folds will all come out after a book has been inside a humidity tank chamber for 8-12 hours. This is normally expected as the paper fibers expanded with water molecules. All of this should disappear after the 1st cycle while pressing a damp book. Is it safe to place a modern age comic book inside a humidity chamber? Yes! I have pressed a 2017 glossy cover, glossy pages modern age comic book after placing the book inside a humidity tank chamber for 25 hours. Modern age comics can be placed in a humidity tank safely. This book was placed at 9am and removed the next day at 10am. The book was extremely damp and had vertical ripples and waves throughtout entire book. Pressing books with 2 steel plates is too hot! I burn myself trying to remove the top plate. Why 2 plates? Isn't the top platen of machine hot enough for the topside? While using a t-shirt press, if you choose to use only 1 plate or simply use 2 plates on bottom - the surface area often times isn't a perfectly level surface for the book. The outside edge towards you sometimes will leave a tiny gap on outside edge. This proves ineffective if you are dealing with outside edge creases or outside corner bends. This is why I adjusted the steps for quickpress and steel plates. It helps to come back 2 hours later when you want to flip the book. Wearing 2 pairs of gloves can also help if the top plate is too hot for you. I follow your guide but I still get wavy bends, and divot pebbling on my covers. What can I do about this? I pressed a book and left it for 24 hours. Took it out of press, the pages and cover have a curl or lift. Why is the cover curling? Does your pressing room or building have central air conditioning? Is the environment of the room considered room temperature? If the room is too cold or no climate controlled temperature, your book might be cooling down too fast. Try using a space heater nearby or control the overall temperature of room. Comic books must be in the same environment as our body. If you are uncomfortable with the room temperature, so is the book. The overall goal of this guide is simple: Press books in a manner so that others cannot detect the book has been pressed. Light pressure, not firm or hard pressure. Do not burn the book, do not pop the staples, and do not spin the books on surfaces. For temperatures, 150-160 degrees or lower seems to be the “sweet spot” on most books to play it safe. Pressing under high heat for less than 5-7 minutes on each side is good for most books. Keep moisture and humidity to a minimum on your books. Always keep a timer with you and don’t forget to set your timer! 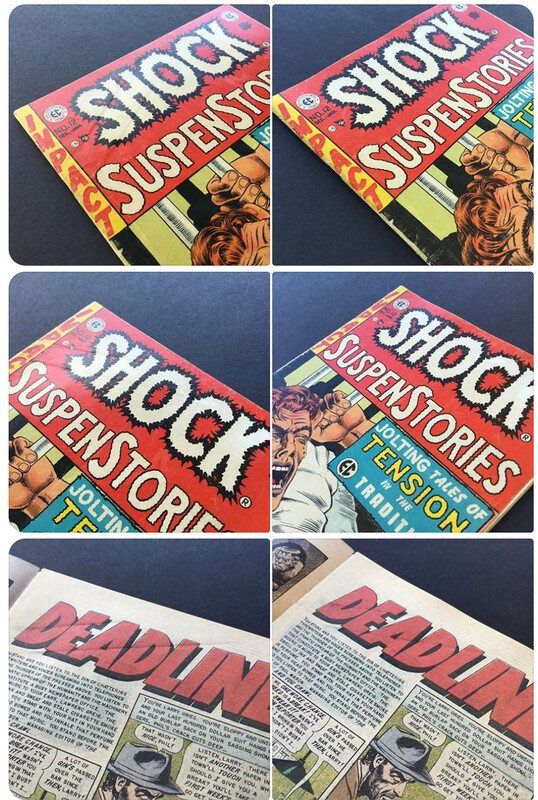 These steps are some of the things that can be done to successfully press a comic book, magazine, or poster with minimal to no damage to the item being pressed. These tips will hopefully save you money, and guide you along the way as YOU learn and pick up new ideas and better ways to accomplish things. I am not a professional presser, and I’m not a professional grader. However, these are the methods I use when I press comic books as a hobbyist. All of this is a learning process. I encourage you all to share your ideas among everyone so that we can all prevent damage to one another’s books. I am open to any feedback and suggestions. I also reside in a coastal Northwestern state, which is more humid than inland states. Your results may vary based on humidity and temperature of the climate you reside in. This guide has been called a "living document" as referenced by fellow enthusiasts of the hobby. The guide originally was first 5 or 6 long paragraphs on a blog post found at blog.kaptainmyke.com. That blog was taken down when I switched dedicated servers with my webhost. Since then, the guide has had a permalink here at this page and has not changed parked locations ever since. 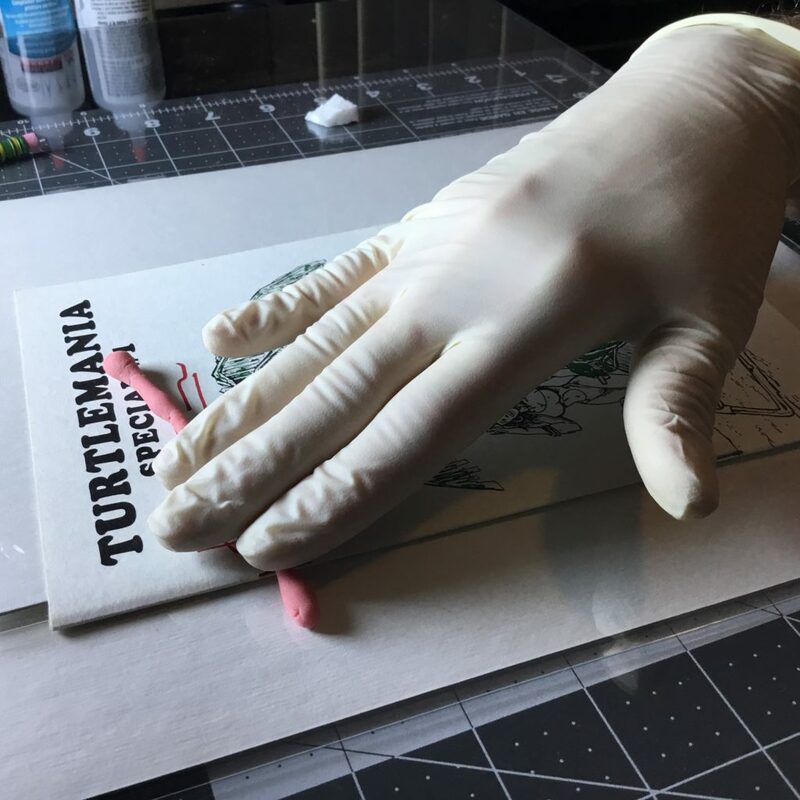 7-18-2017 Brief blog post at blog.kaptainmyke.com describing the fundamentals of pressing a comic book with a swivel model Tivor t-shirt heat press machine. 9-17-2017 First guide written explaining the fundamentals of pressing comics with a heat press machine. Explained a brief checklist of equipment, materials, and using steam on books. 12-12-2017 Added Does this book need to be pressed or not? 3-11-2019 Added new link in checklist for Marble Massage Balls with handle as an alternative to using 1.5" ball bearings with no handle. 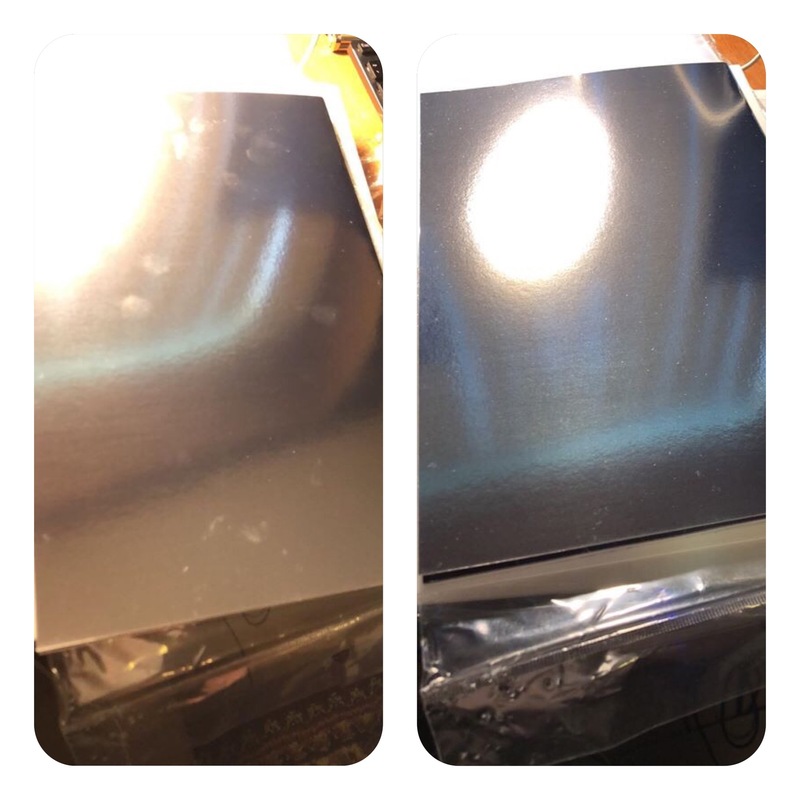 3-12-2019 Added questions + answers regarding water stains and humidity tank wrinkles/ripples on books. 3-13-2019 Tested successfully placing a 2017 glossy cover, glossy pages modern age comic book inside a humidity tank chamber for 25 hours. Modern age comics can be placed in a humidity tank safely. This book was placed at 9am and removed the next day at 10am. 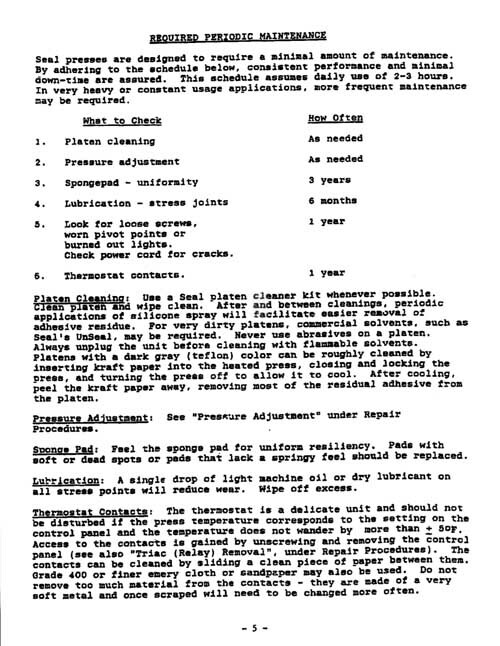 3-17-2019 Added a more detailed recommended checklist of equipment and materials needed to press and clean comic books. 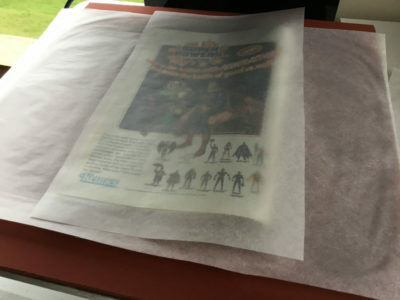 3-22-2019 Added new photos describing how to flip a comic book and proper handling/transferring a pressed book into a new bag and board. 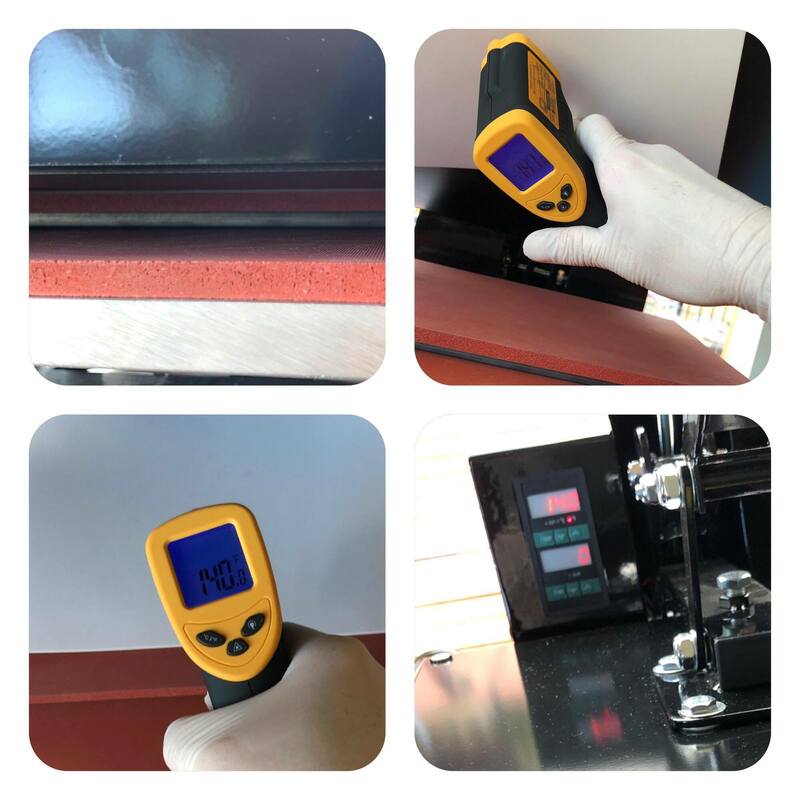 3-26-2019 Added procedure for calibrating temperature control unit on 15x15 Clamshell Press Machines, Model 3802 and similar. 3-28-2019 New photos: cleaning kit and cleaning comic books recommended products. New graded comic with flaring photo. 3-31-2019 New fancy temperature color meter graphics. 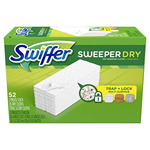 4-4-2019 New recommendation to try Swiffer brand dust sheets for cleaning top layer of dirt and grime off most comic books. Thanks, John! 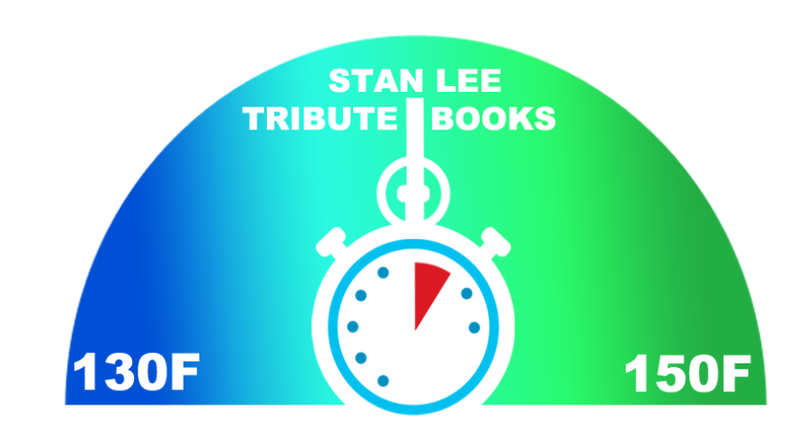 4-11-2019 New procedures and steps for pressing "Stan Lee Tribute" books and lesser quality crowdfunding independent publisher books with thinner quality paperstock. 4-14-2019 Added new photos. Updated inspection checklist with new defects on bottom of list.